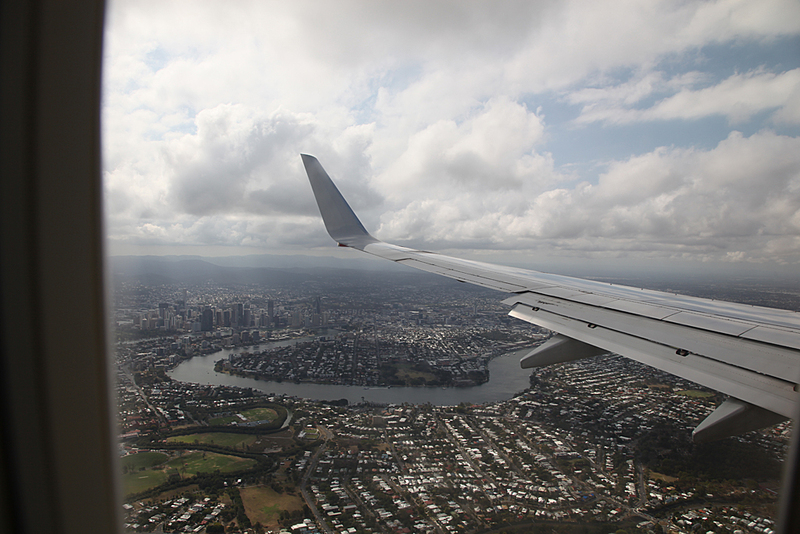 As well as our group there will be others from Sydney, Melbourne etc coming to Brisbane for the event. 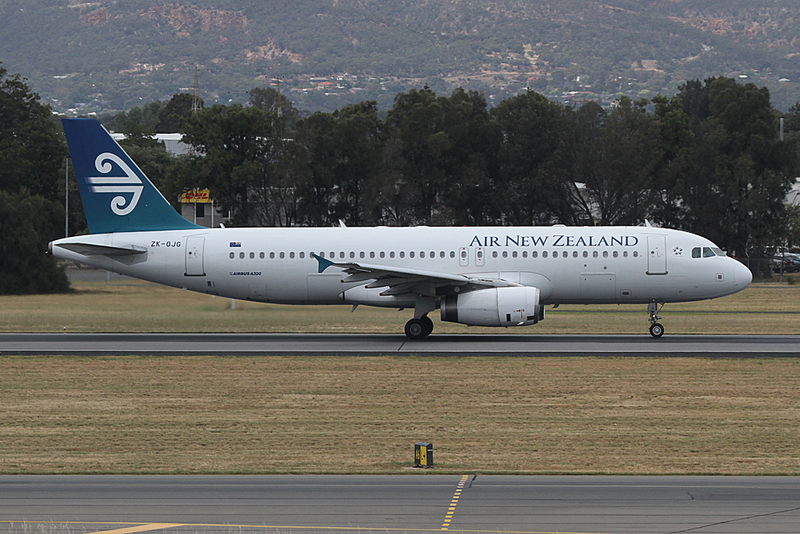 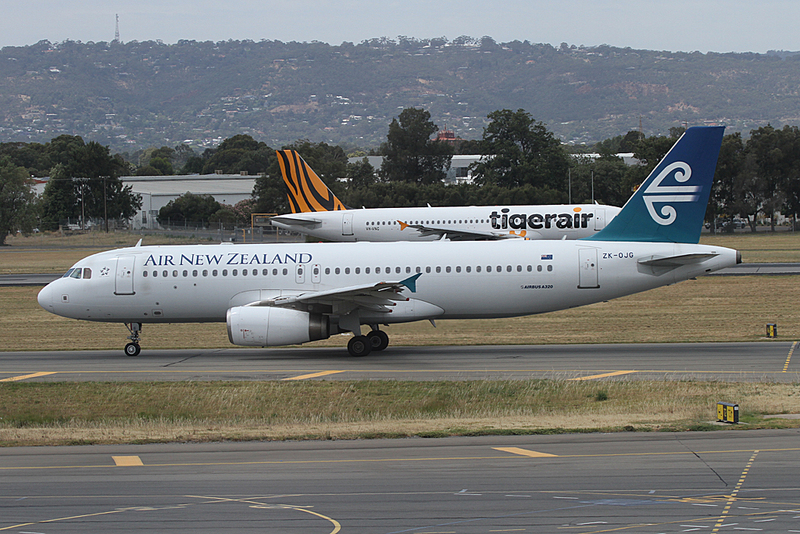 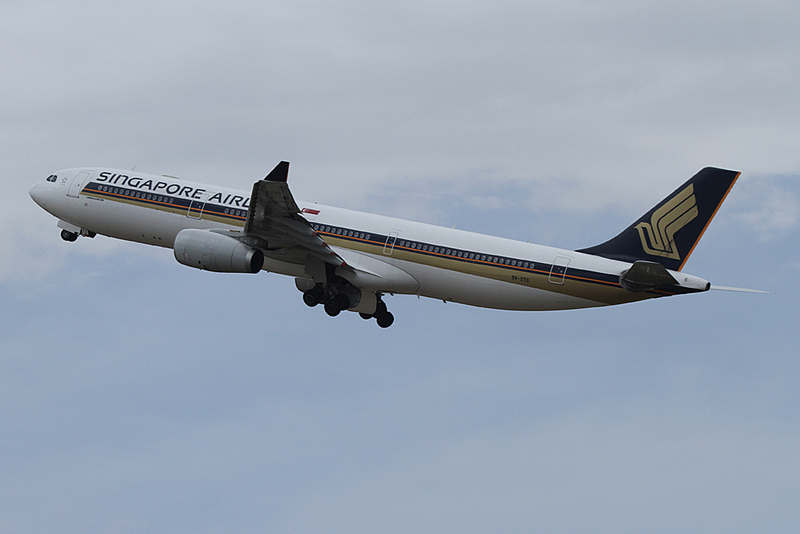 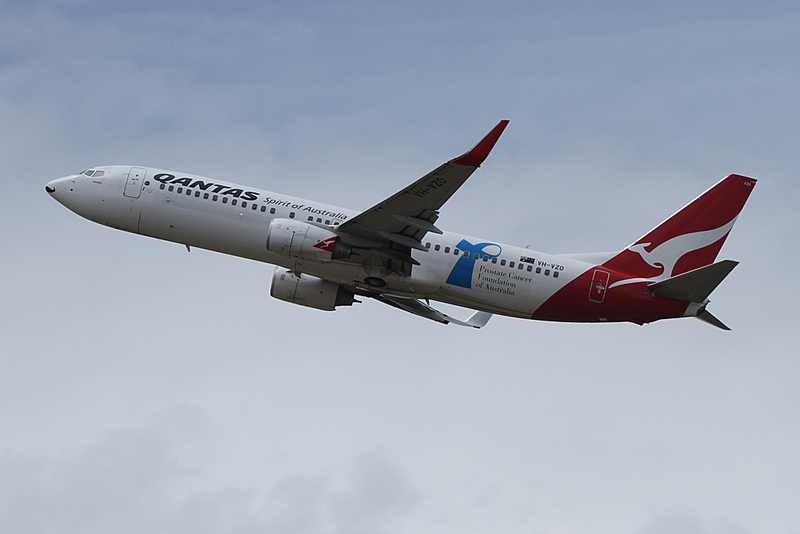 The main aim is to photograph as many of the visiting aircraft as possible. 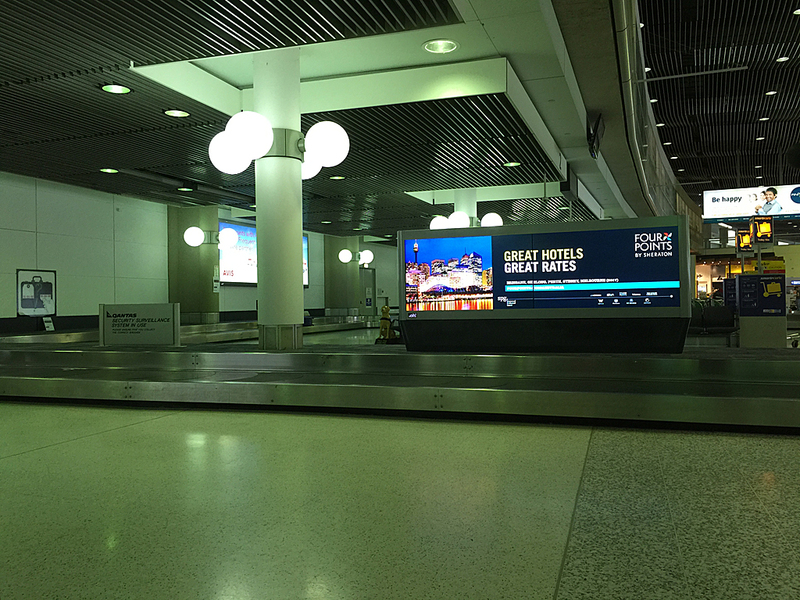 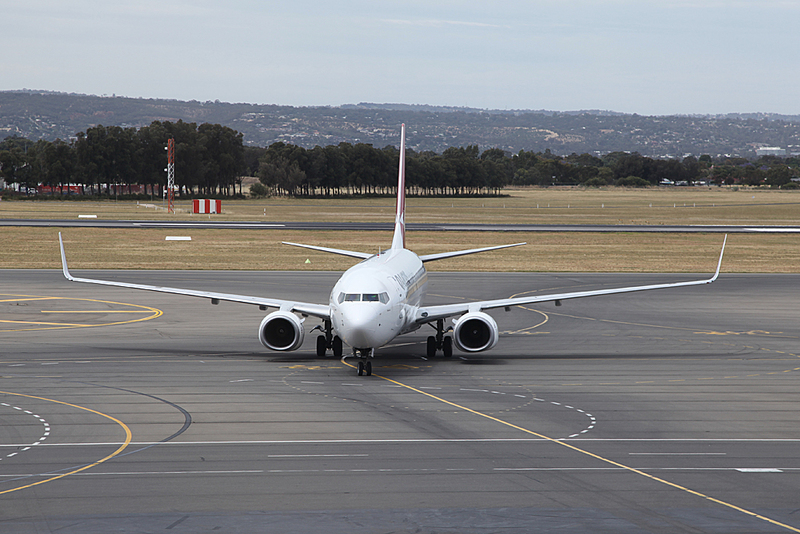 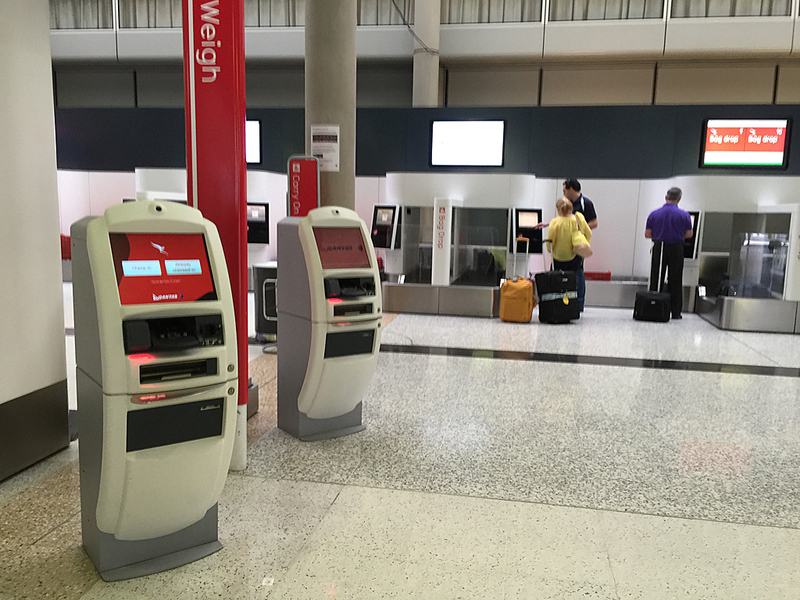 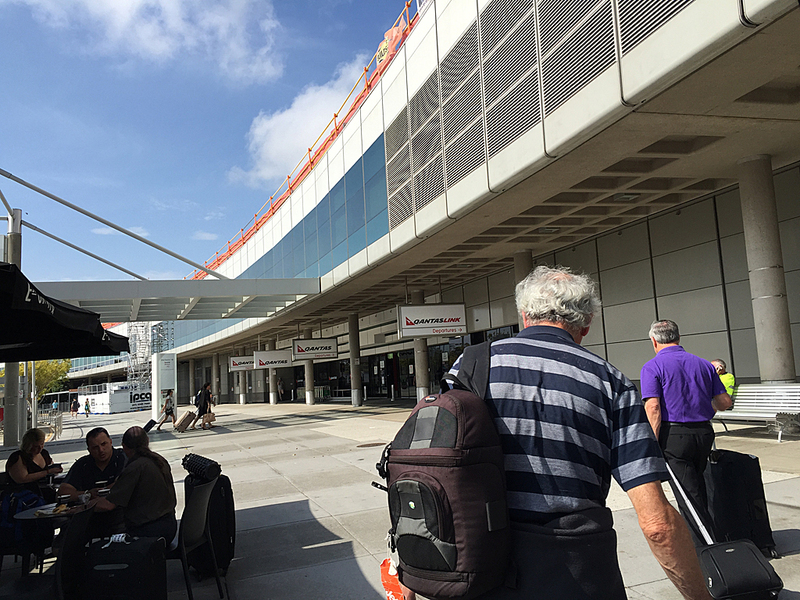 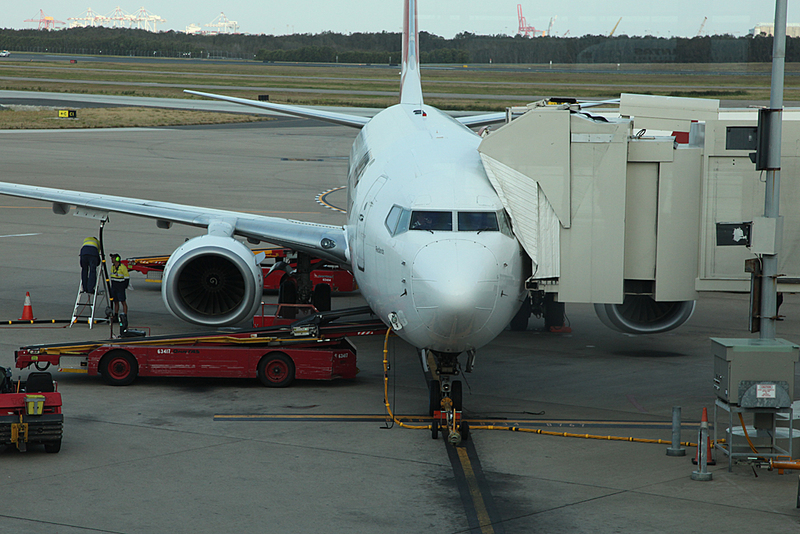 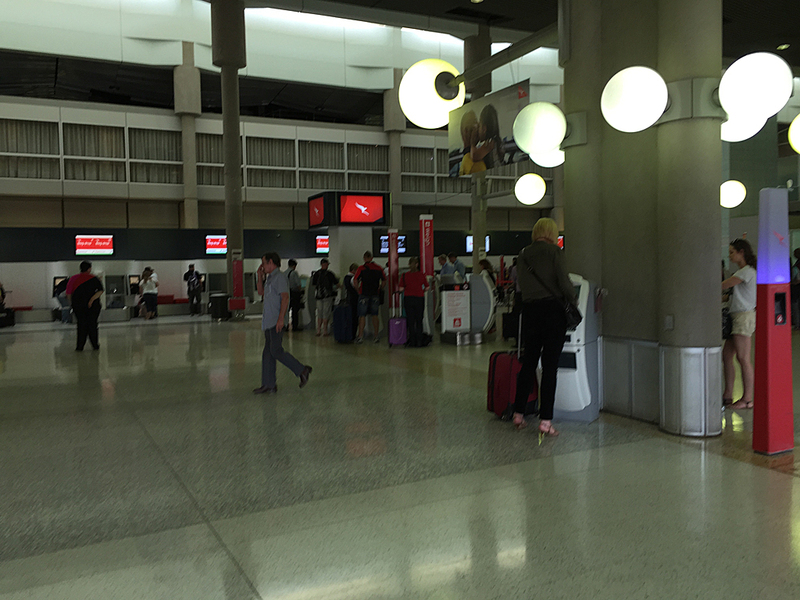 While some of the group are visiting the smaller airports over the weekend of November 15-16, some of us will stay around Brisbane airport for the whole time we are there. 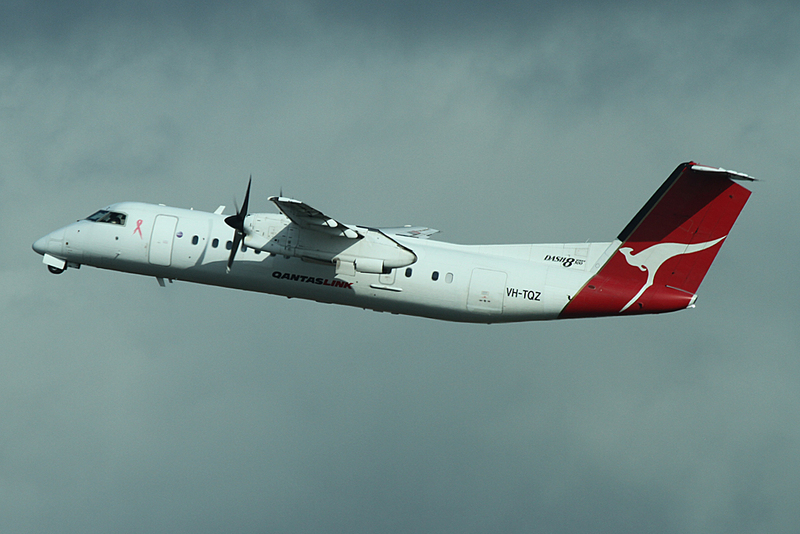 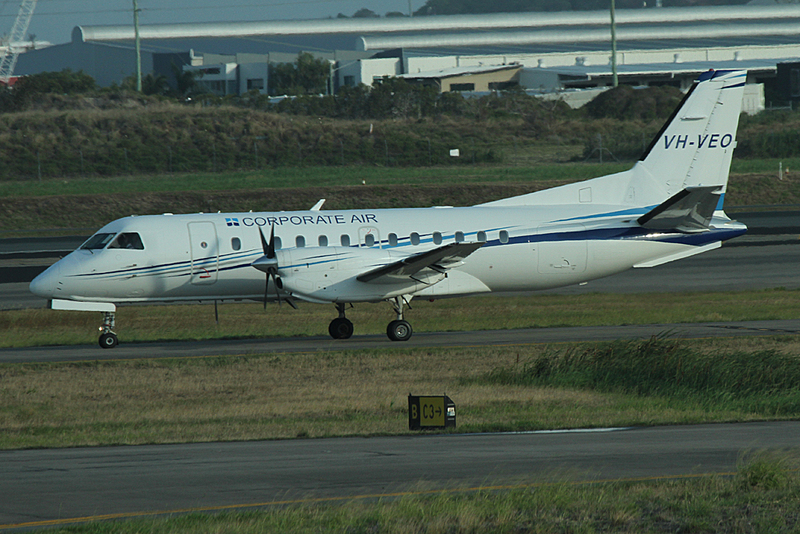 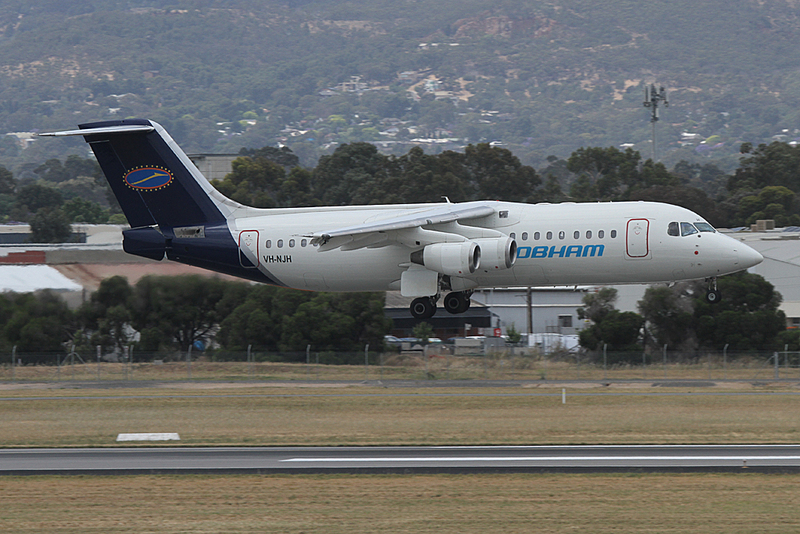 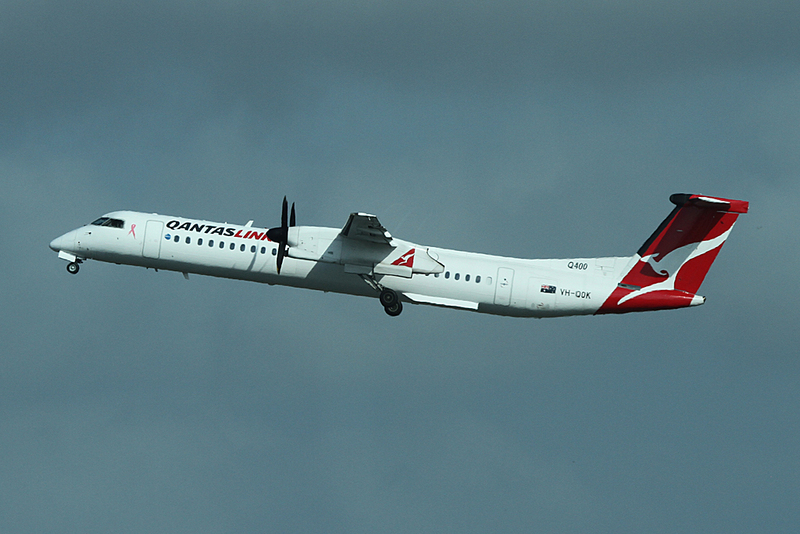 Dad and I will be flying out to Thargomindah on November 16 for the day on a Dash8-100 operated by Skytrans. 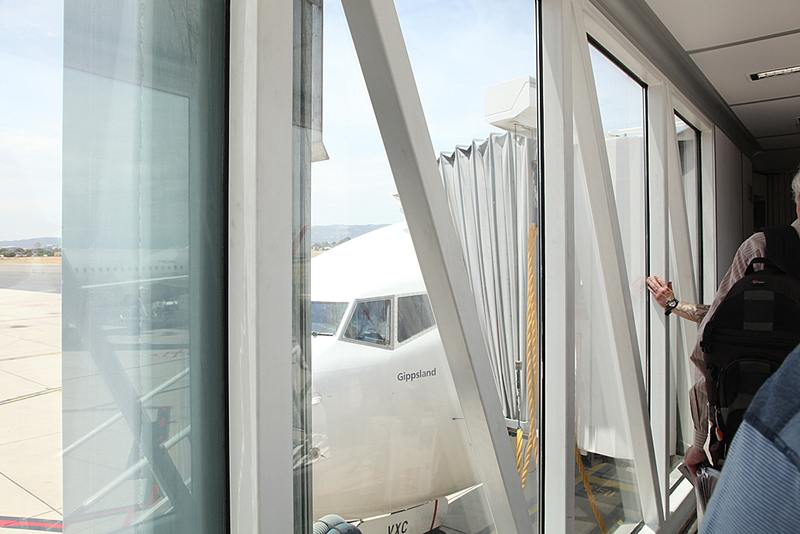 That flight will be detailed in a separate report. 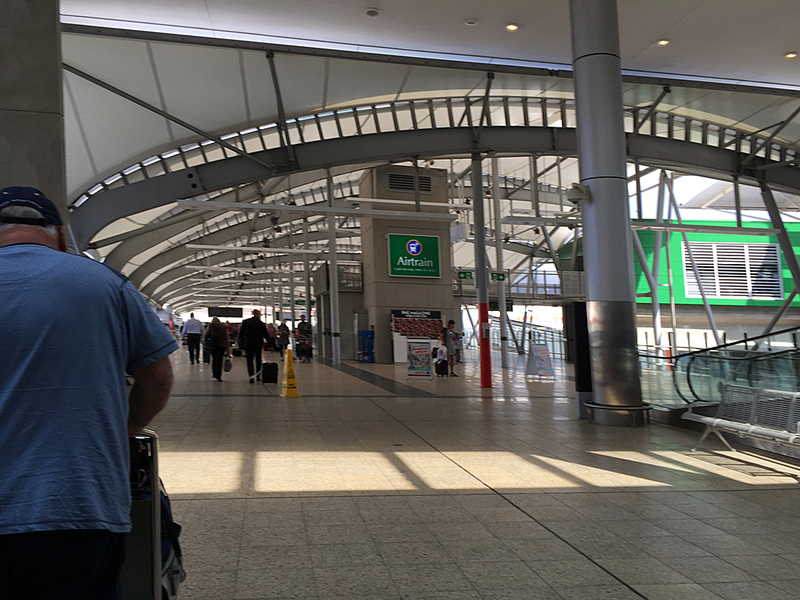 Got a friend to drop us off and we got to the airport with plenty of time to spare for our flight which leaves at 2 pm. 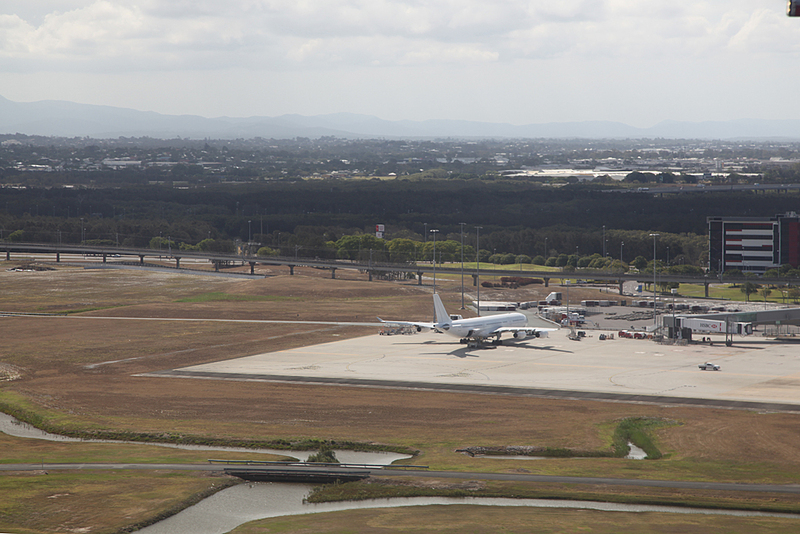 Thankfully the walk across the concrete desert between the drop of zone and terminal was not too bad today. 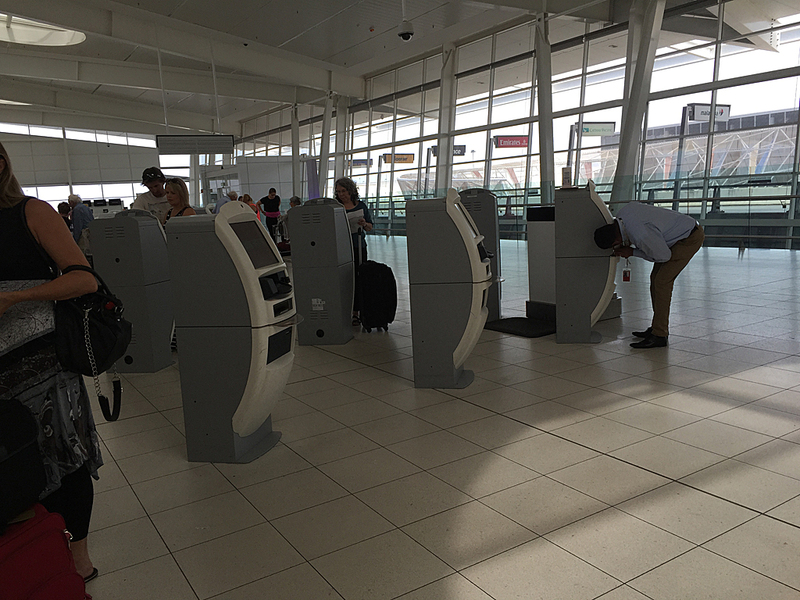 Self check in worked this time, but half the machines were not working. 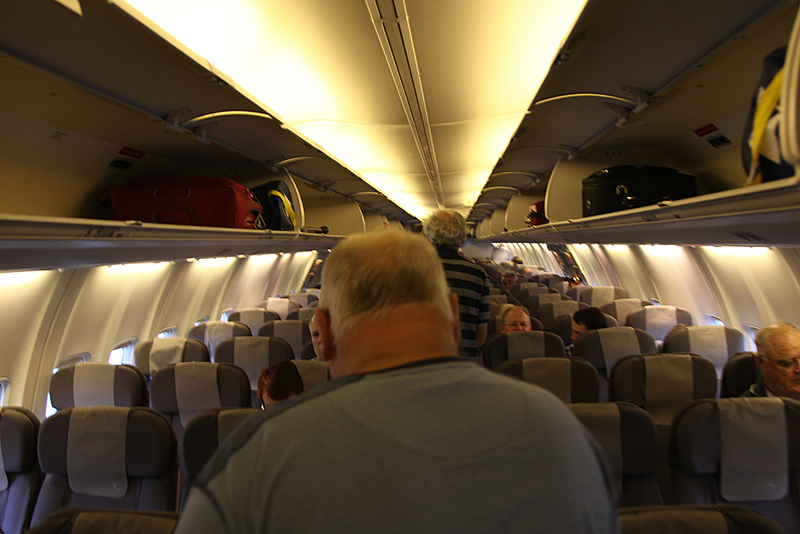 Apart the usual take the laptop out of the bag game, security was painless as neither dad or I made anything beep. 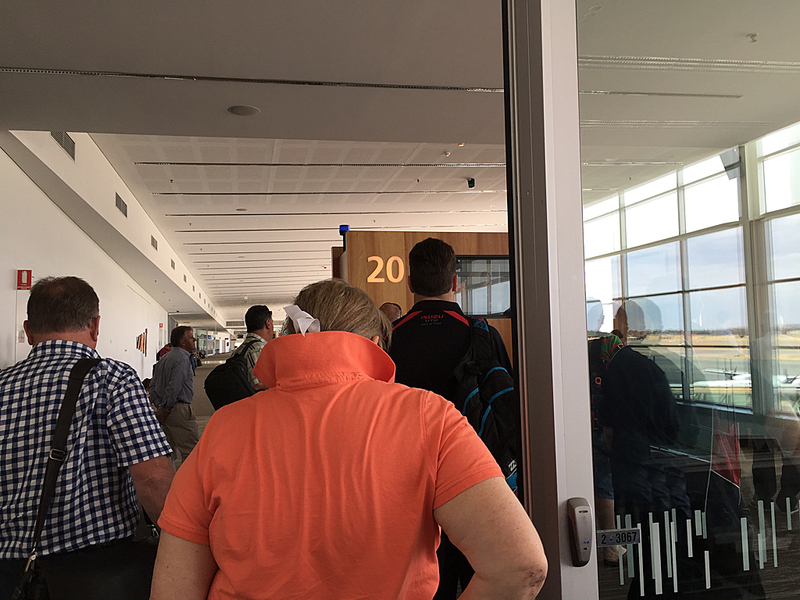 Made ourselves comfortable at gate 20 to wait. 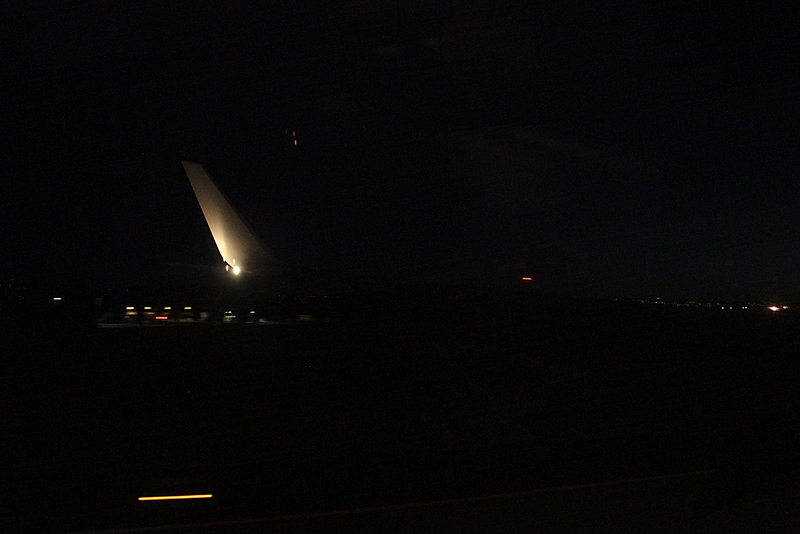 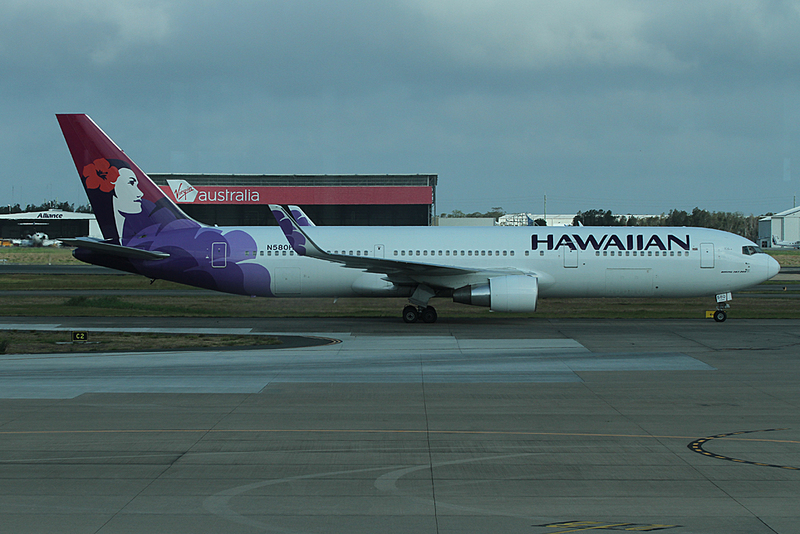 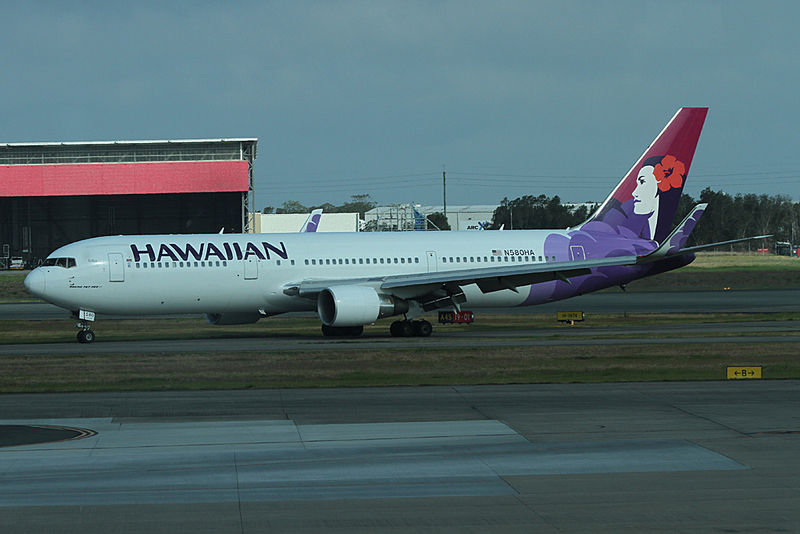 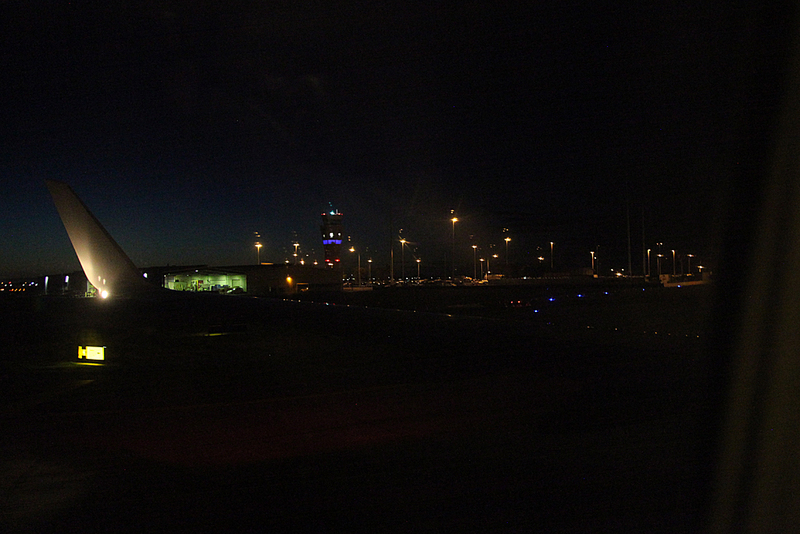 Spent the time until departure photographing the various movements around the airport. 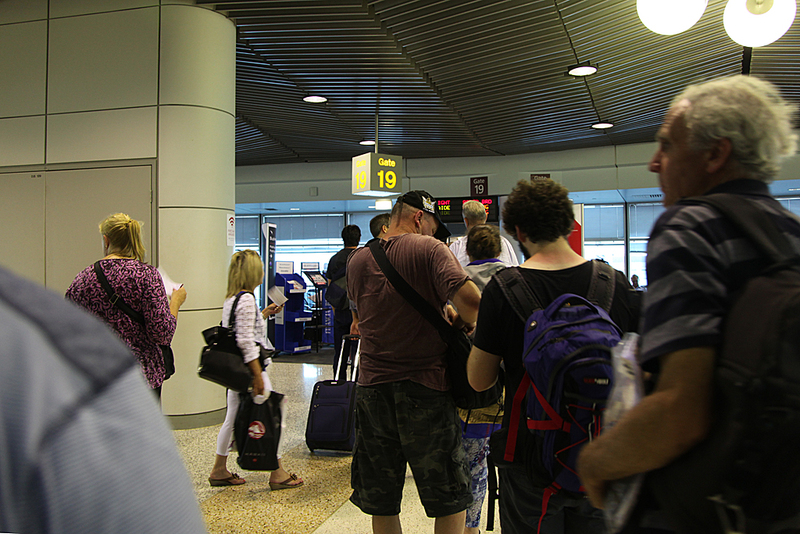 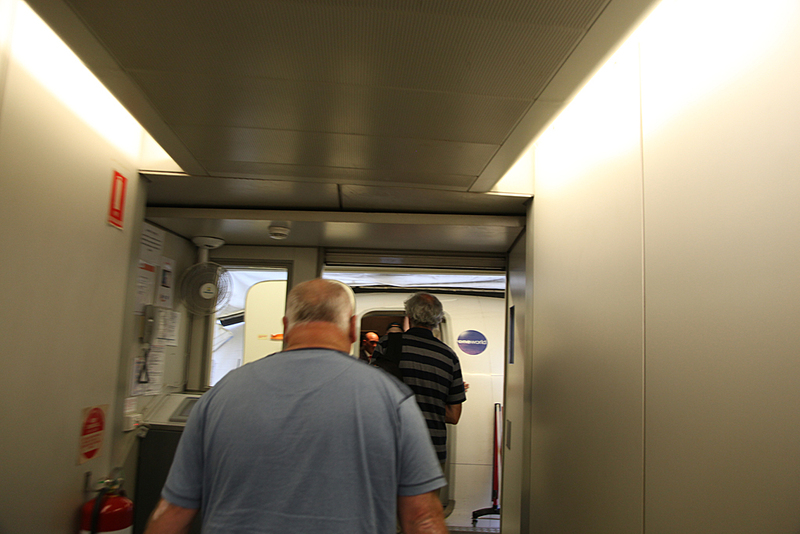 Boarding was called and was a orderly affair. 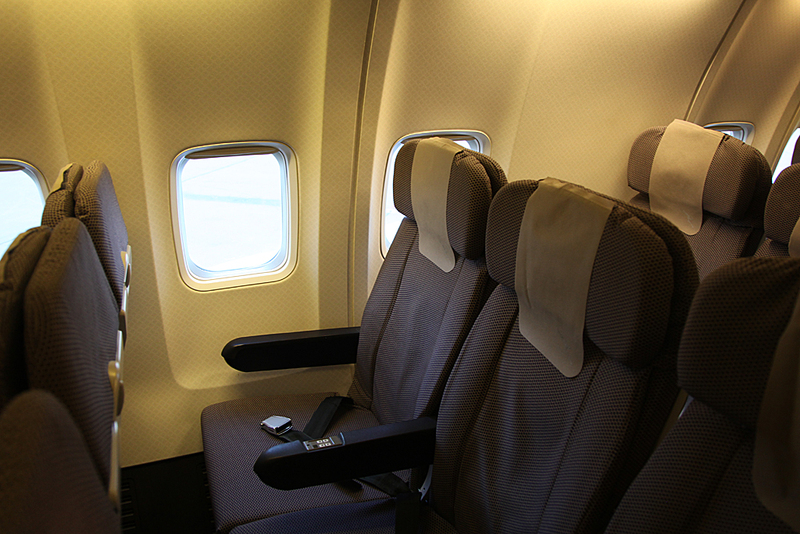 Dad had booked the seats so I had the window and he had the aisle. 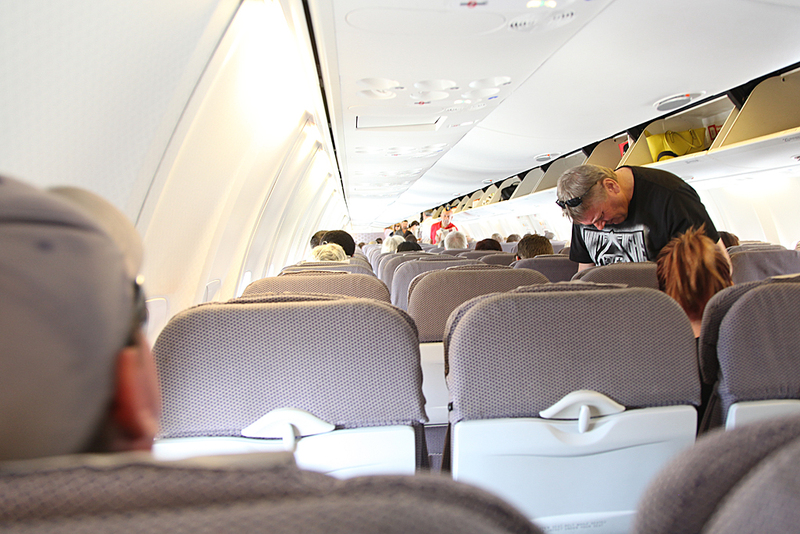 We were hoping no one would sit in the middle seat. 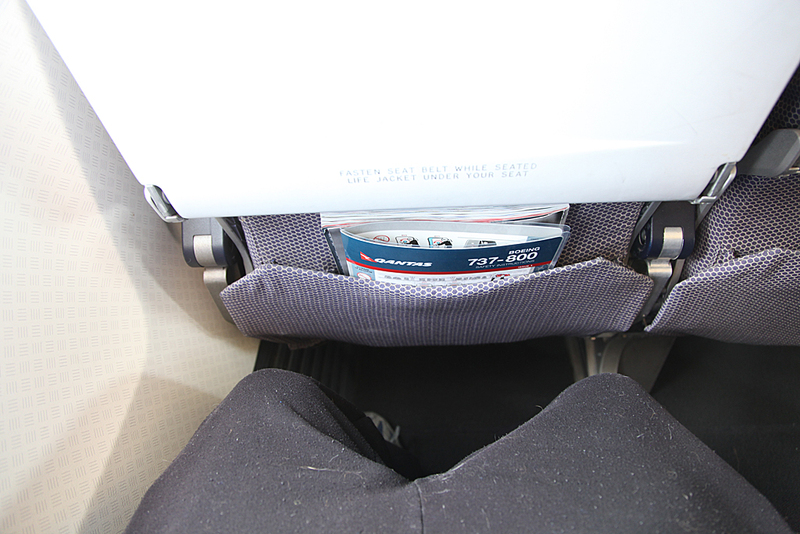 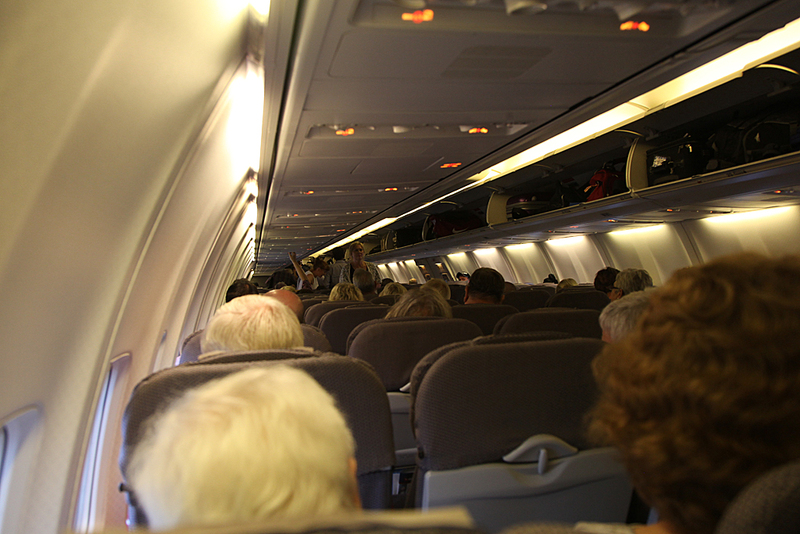 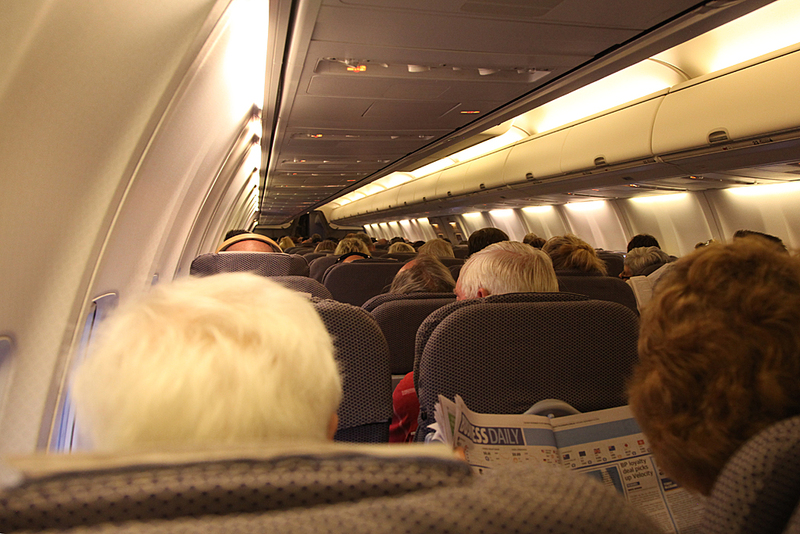 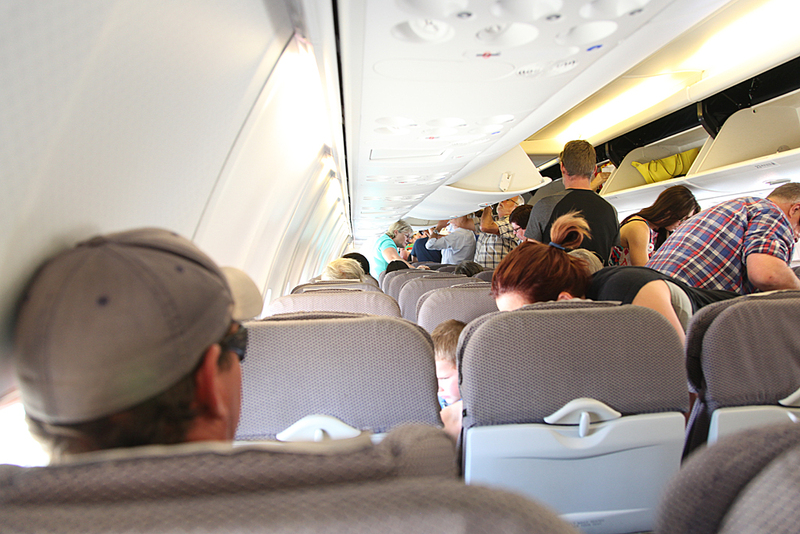 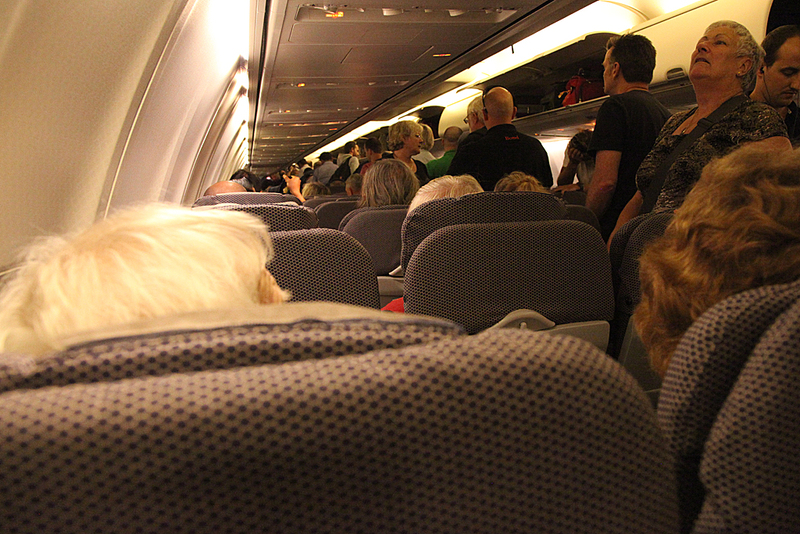 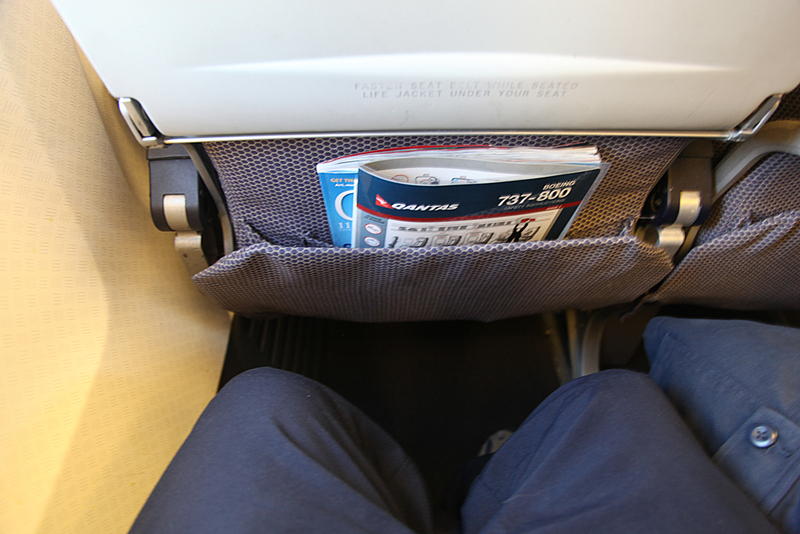 Although I guess the load to be 90% +, we were fortunate the middle seat remained empty. 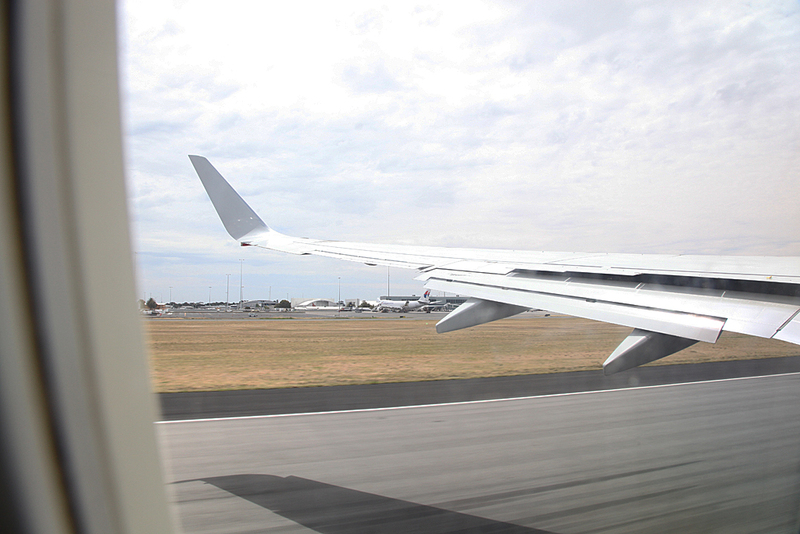 Pushback and taxi to runway 05. 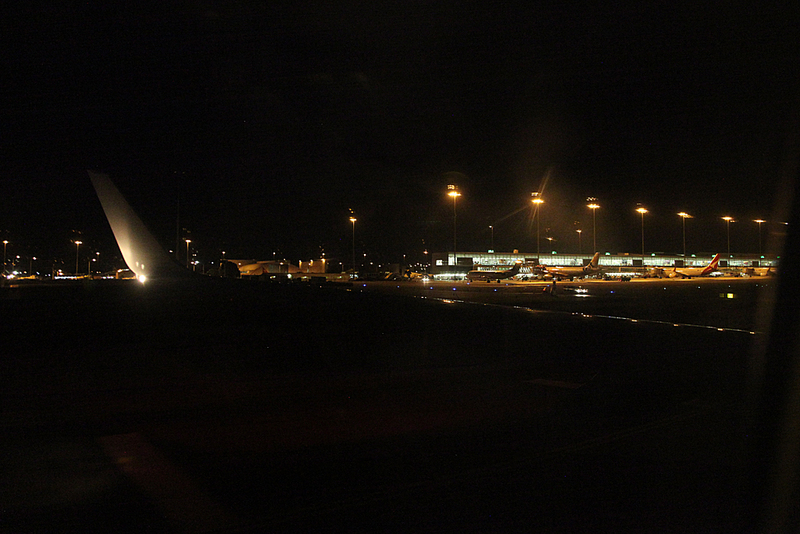 Runway 12/30. 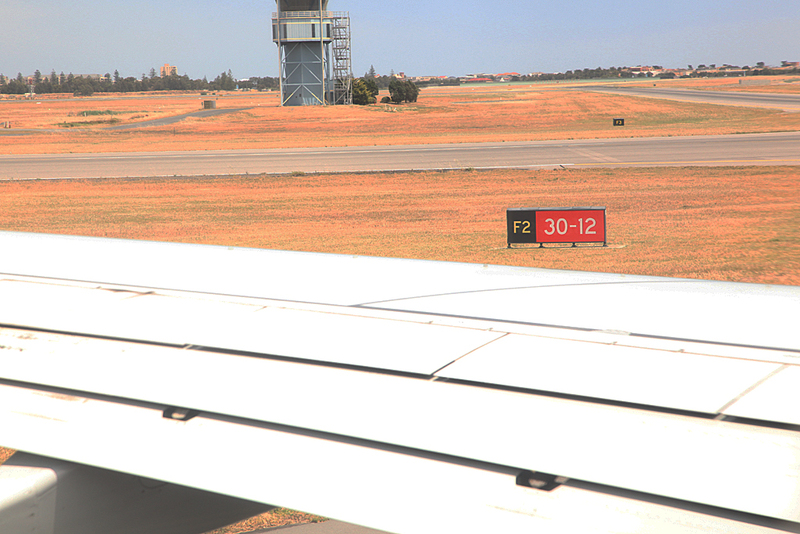 Smaller aircraft mainly use this runway. 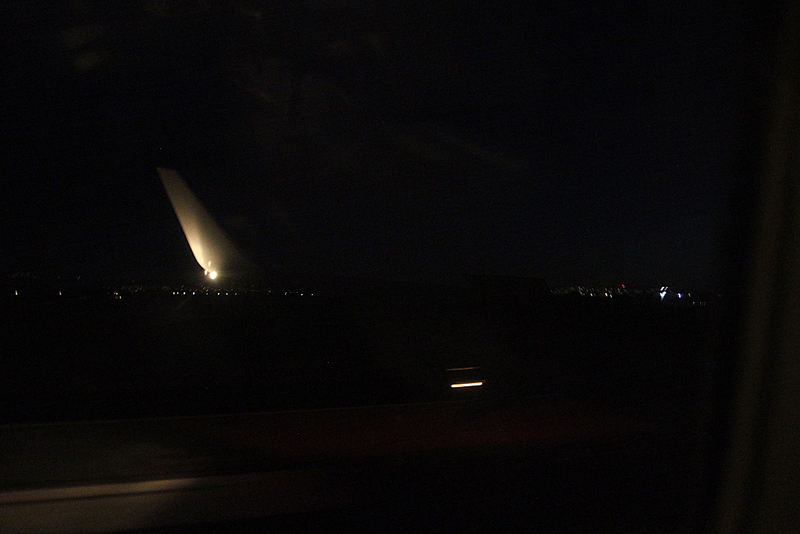 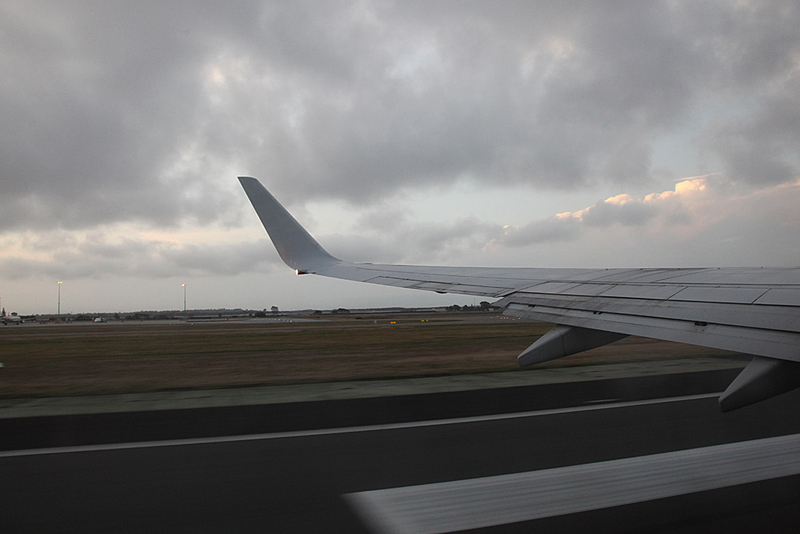 Take off was from runway 05. 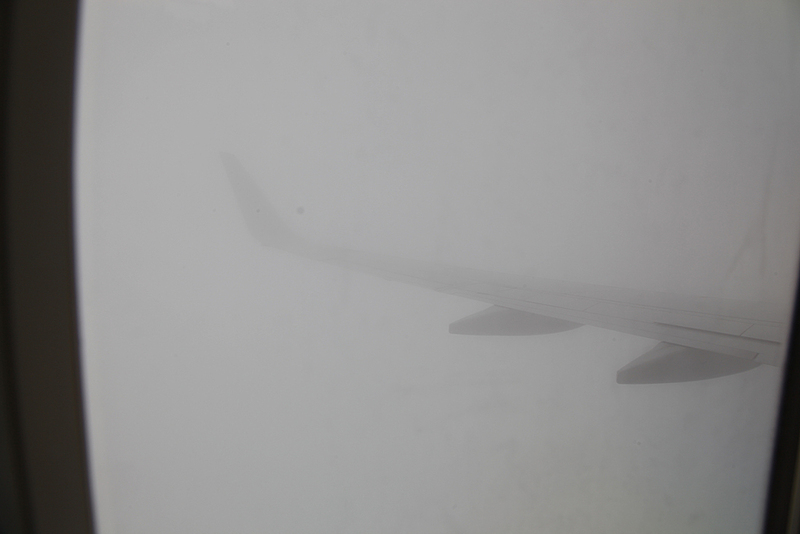 It was quite turbulent during take off. 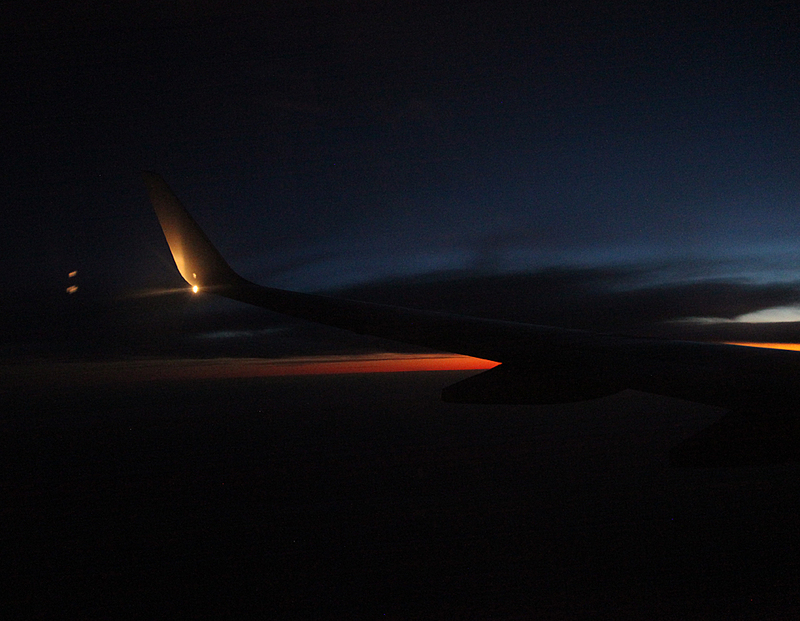 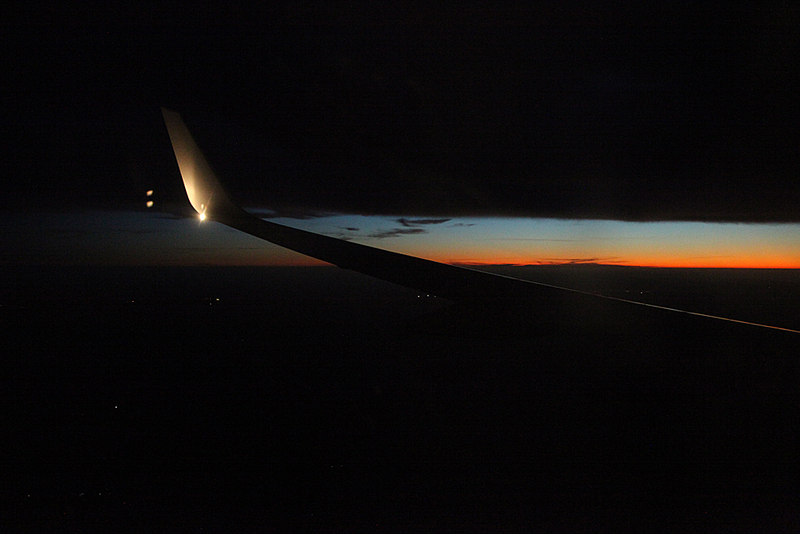 However it did smooth out at altitude. 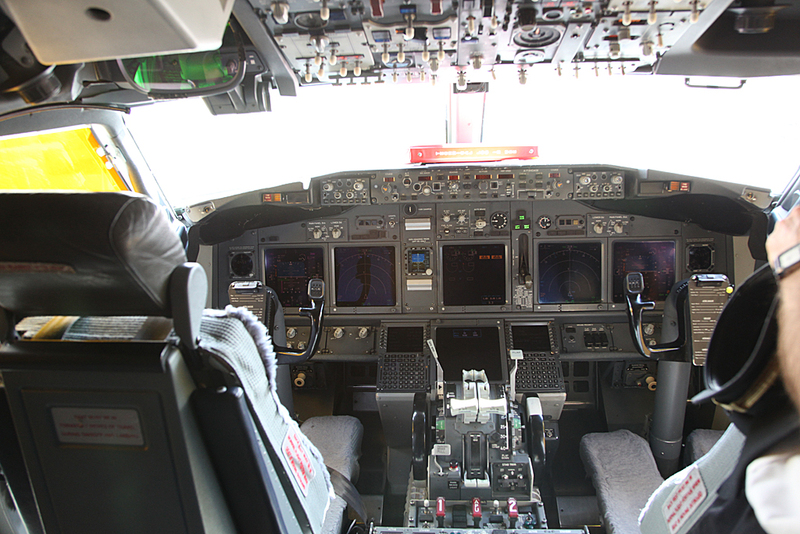 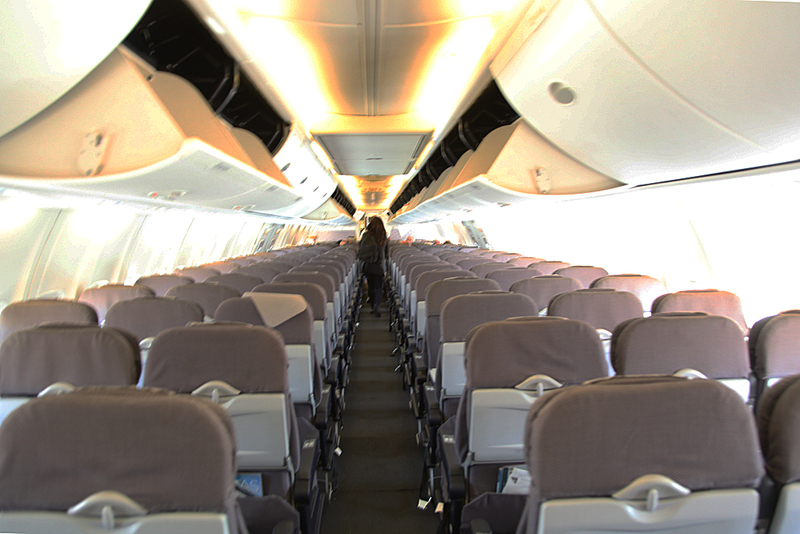 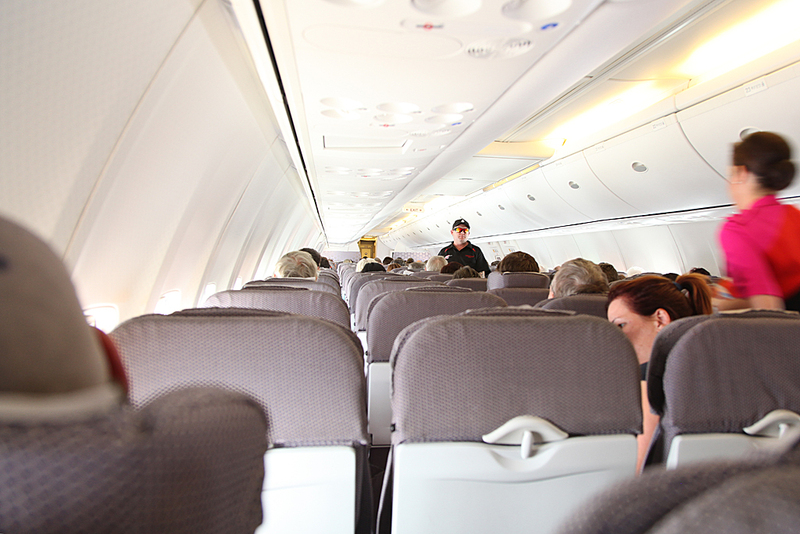 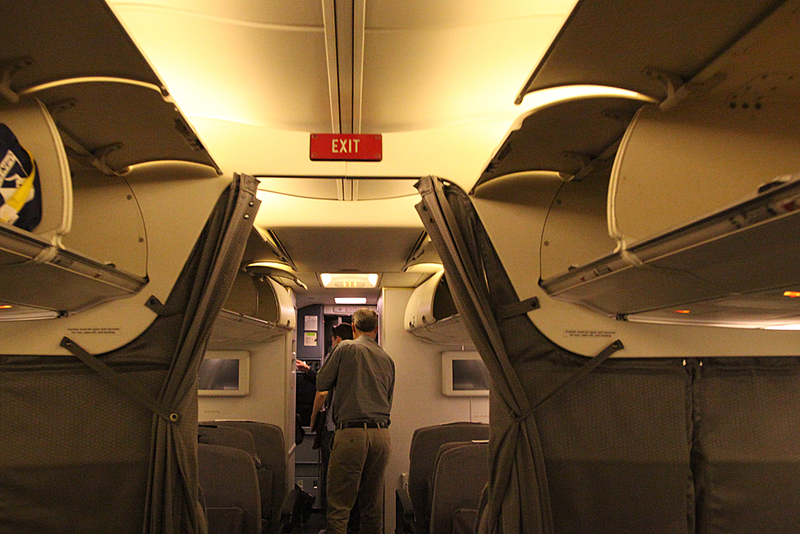 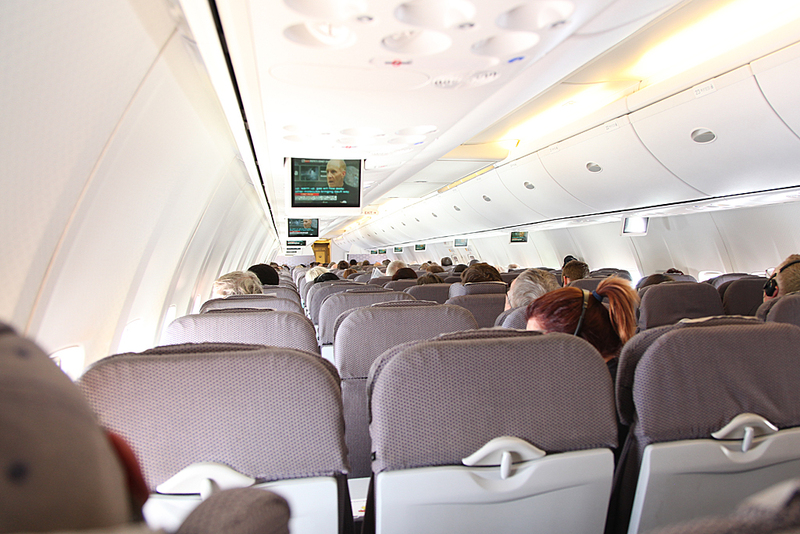 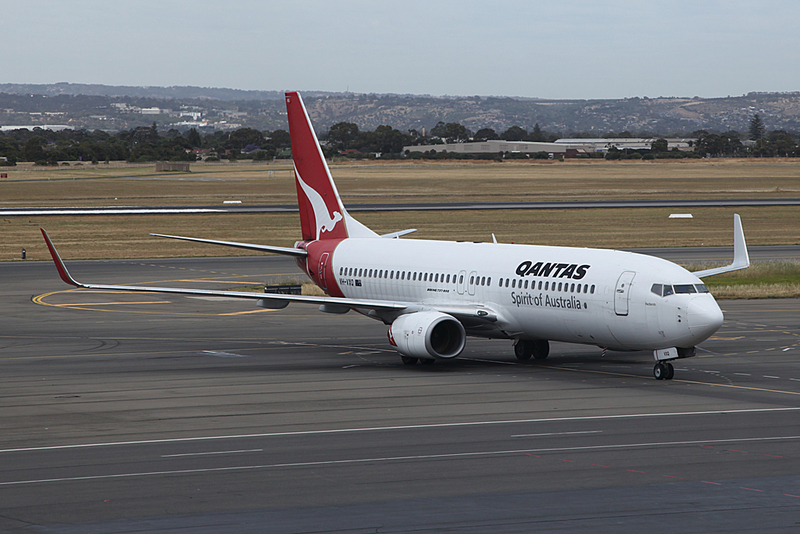 Since this aircraft is one of the first 737-800s that was delivered to Qantas in the early 2000s it does not have the new Boeing Sky Interior or PTV screens in the back of the seats, only drop down over head screens. 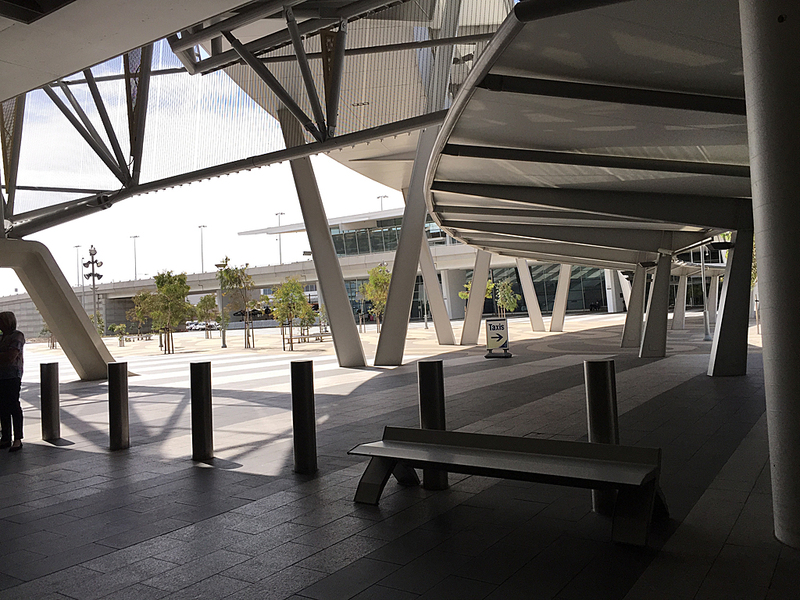 Lunch was a choice of a hot chicken and pumpkin roll or cold egg and celery panini. 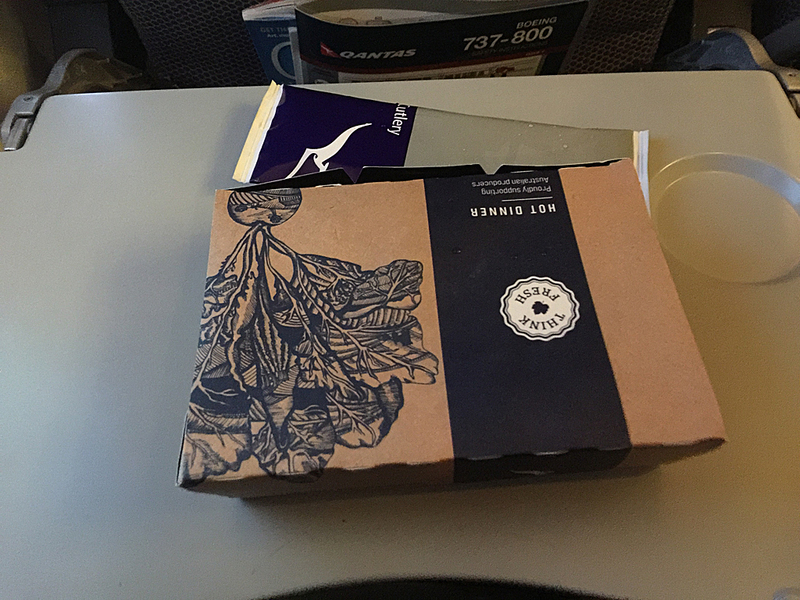 I had the chicken while dad the panini. 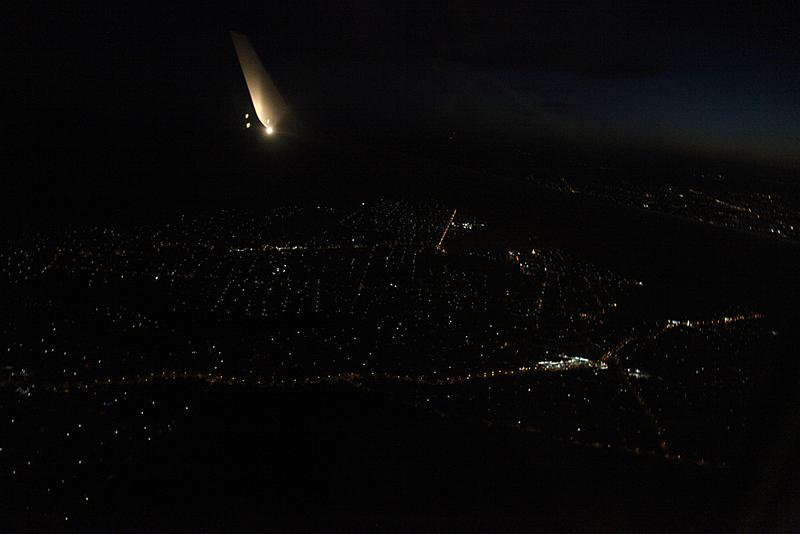 Quite nice although I wished the drinks came at the same time as the chicken roll was piping hot. 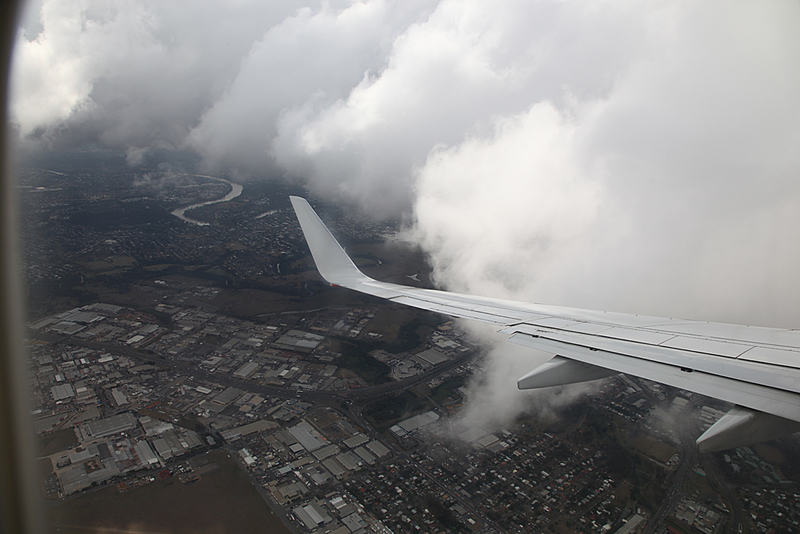 Descent started out smooth, but once in cloud, it became quite turbulent. 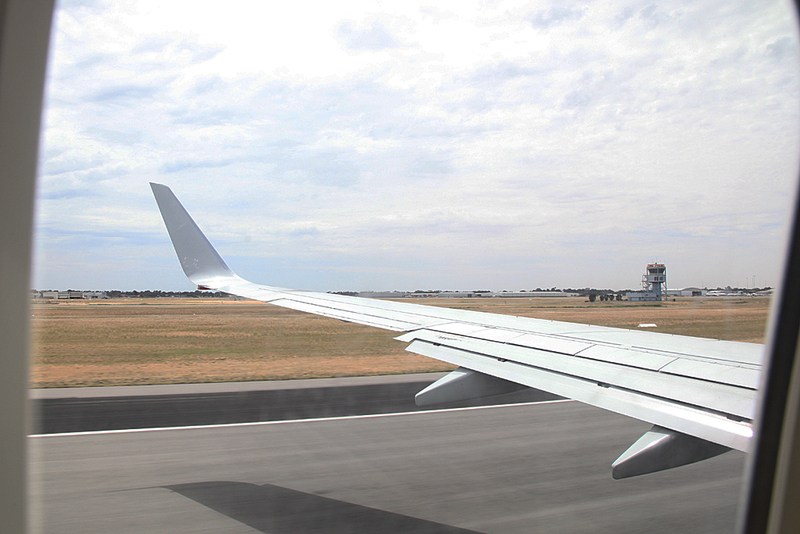 Landing was firm. 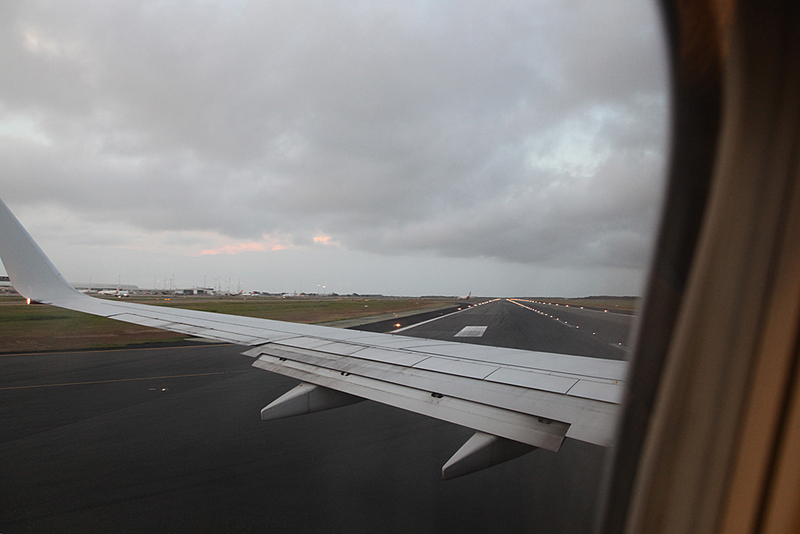 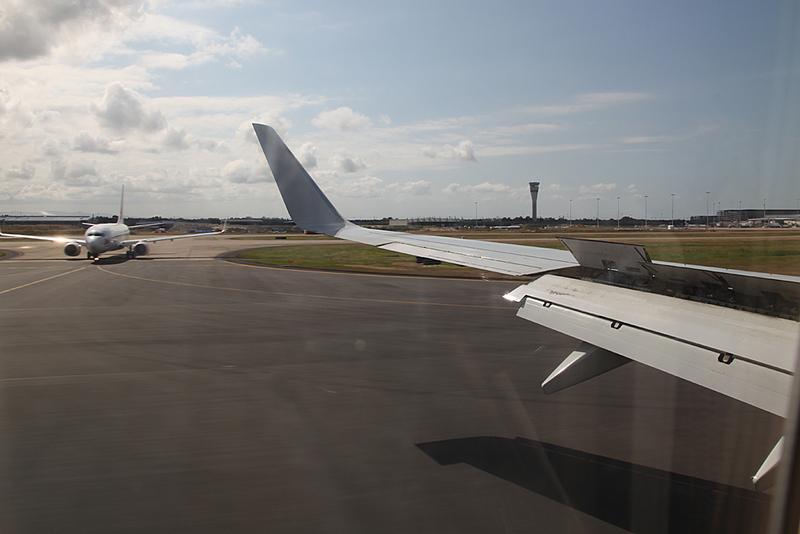 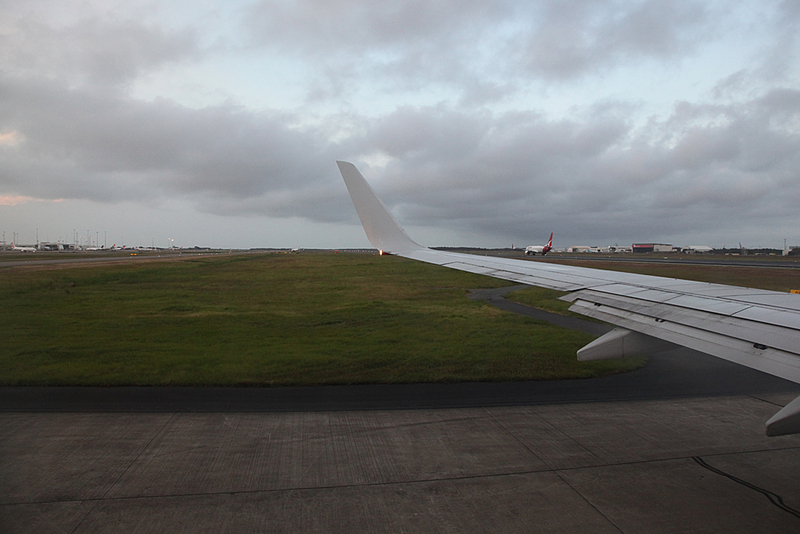 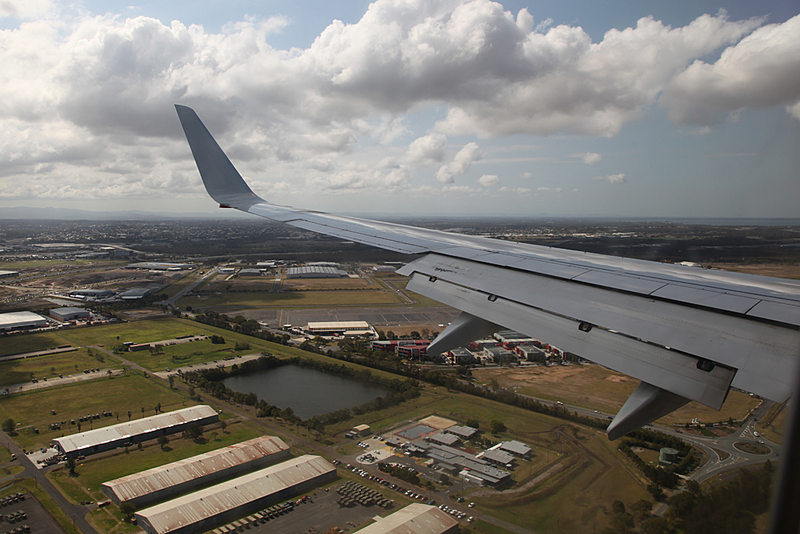 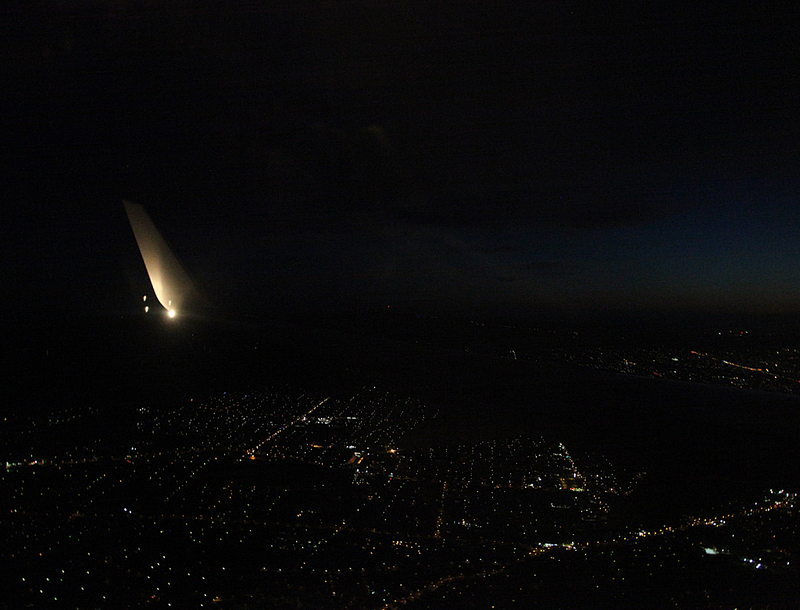 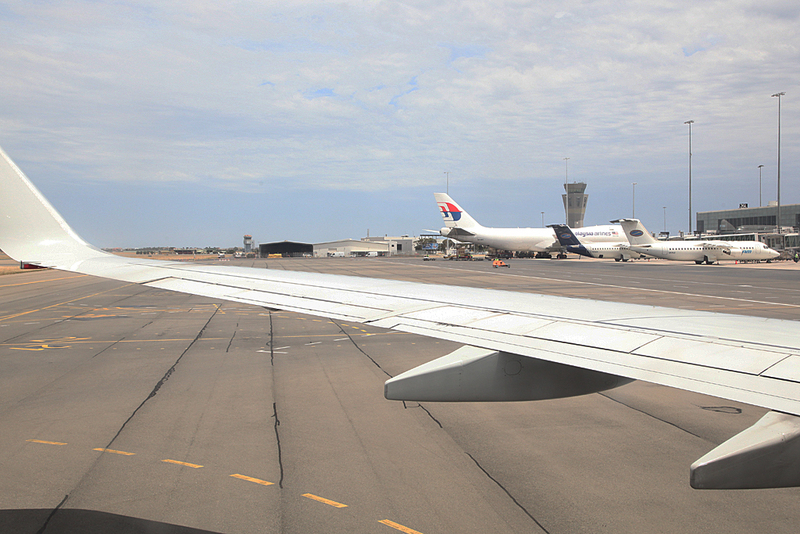 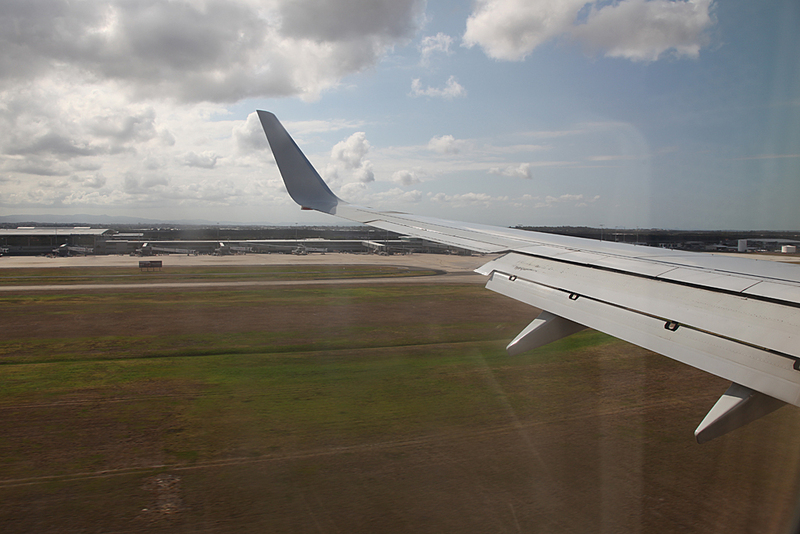 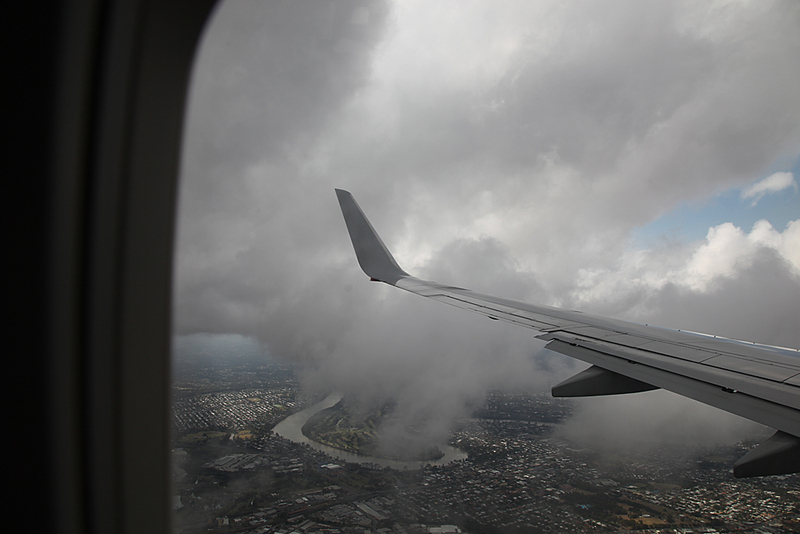 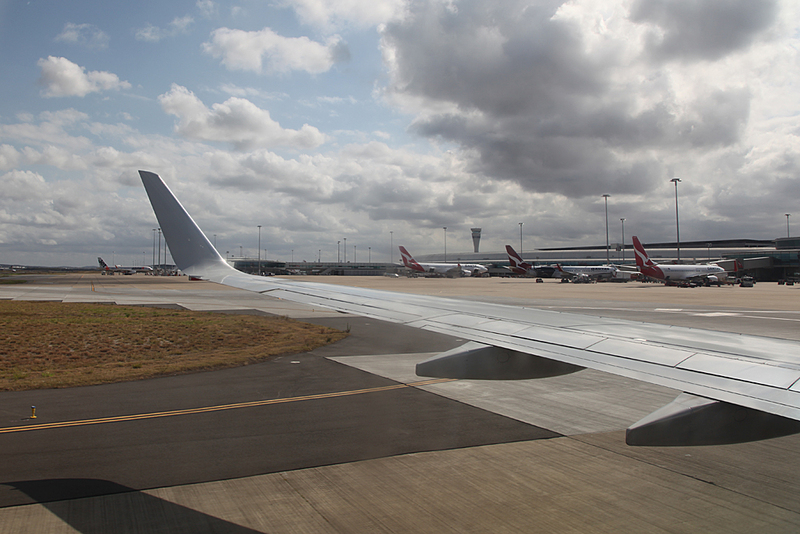 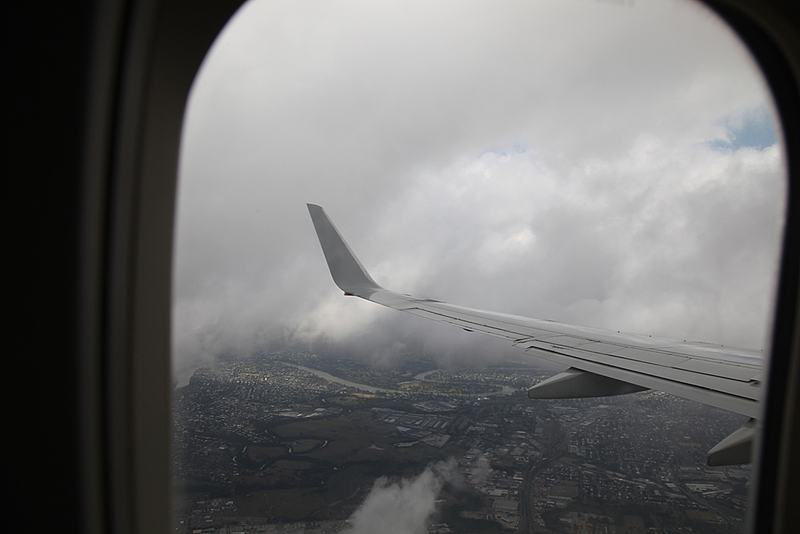 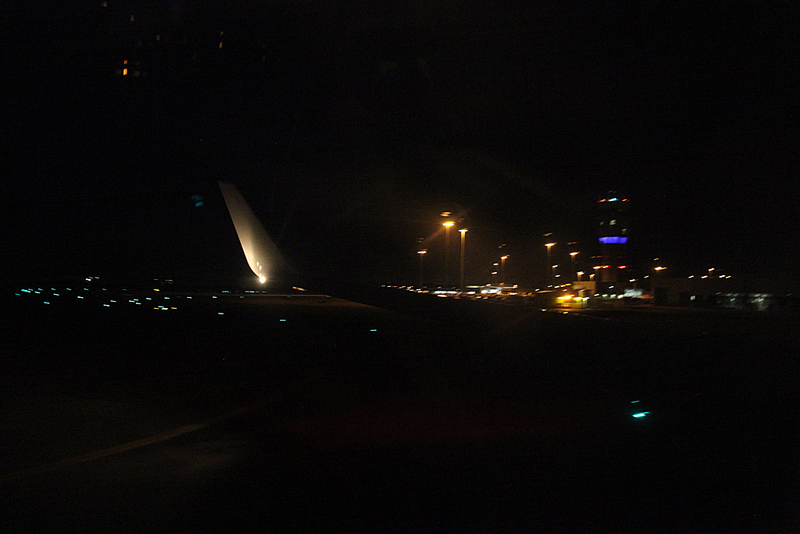 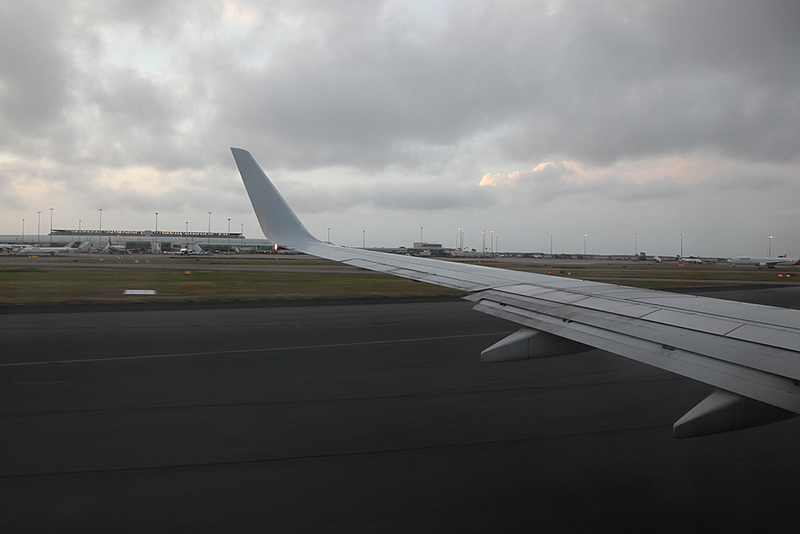 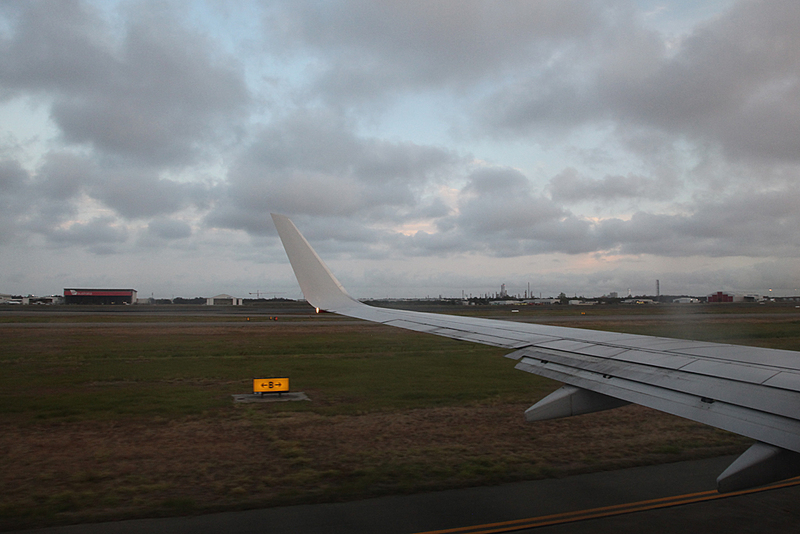 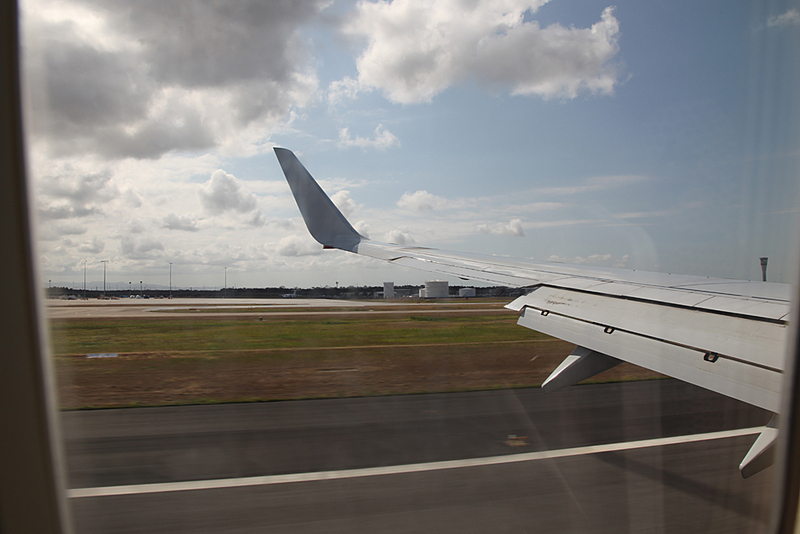 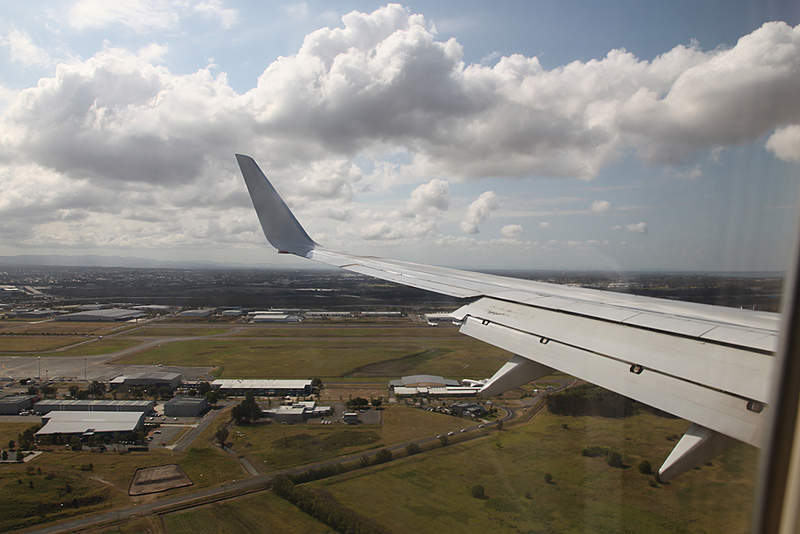 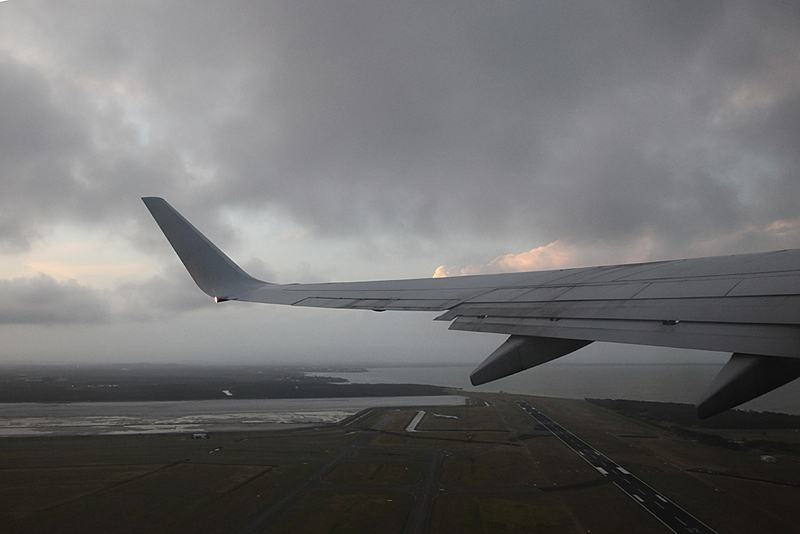 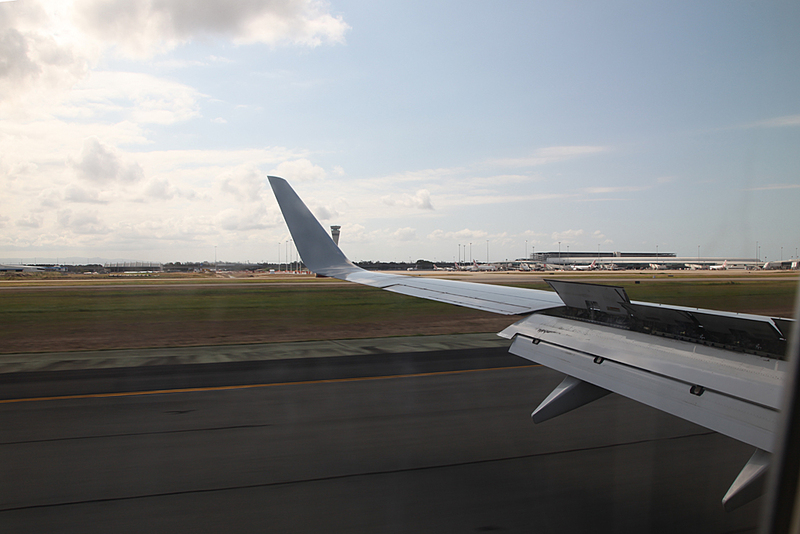 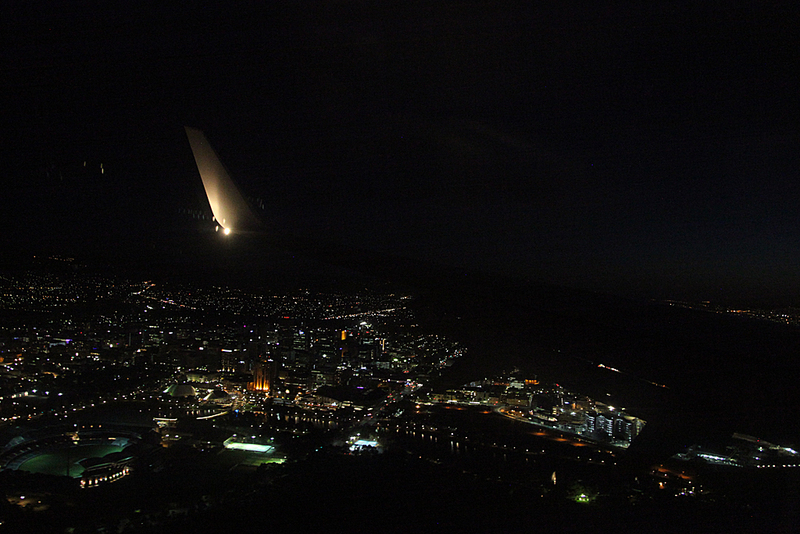 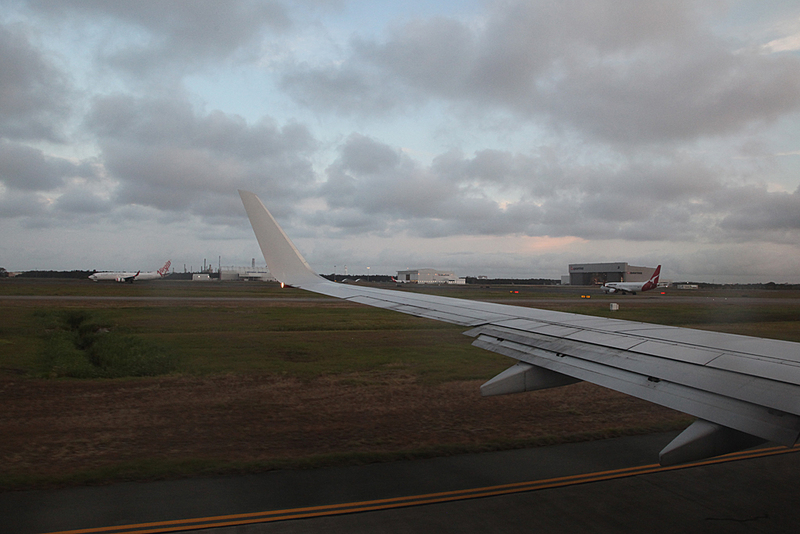 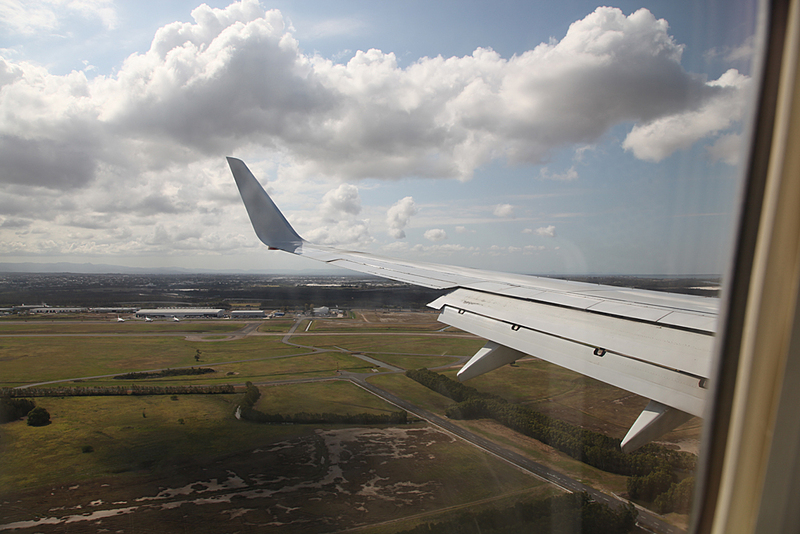 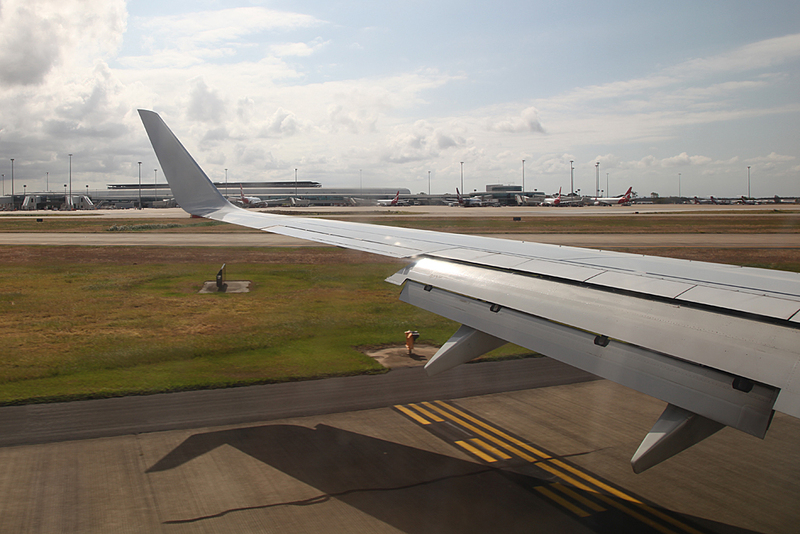 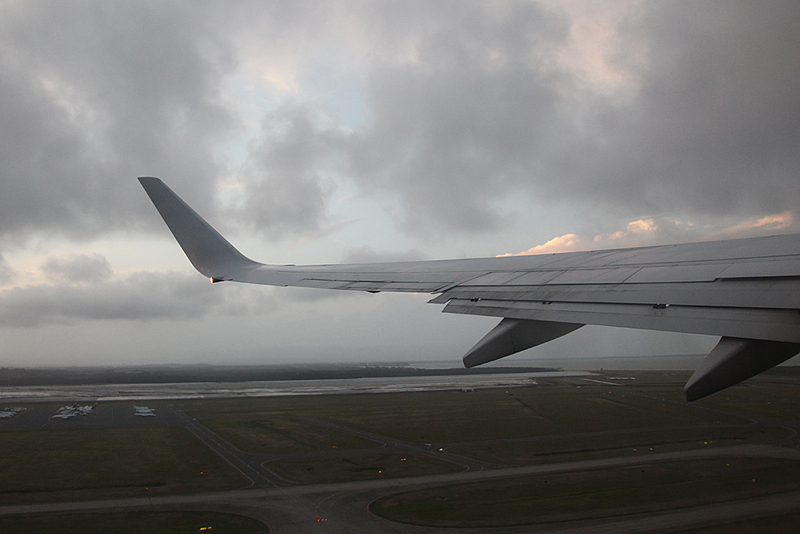 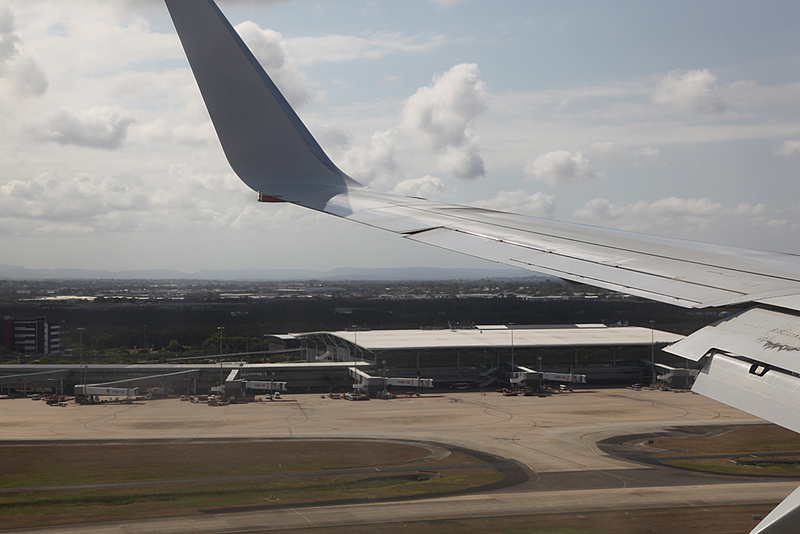 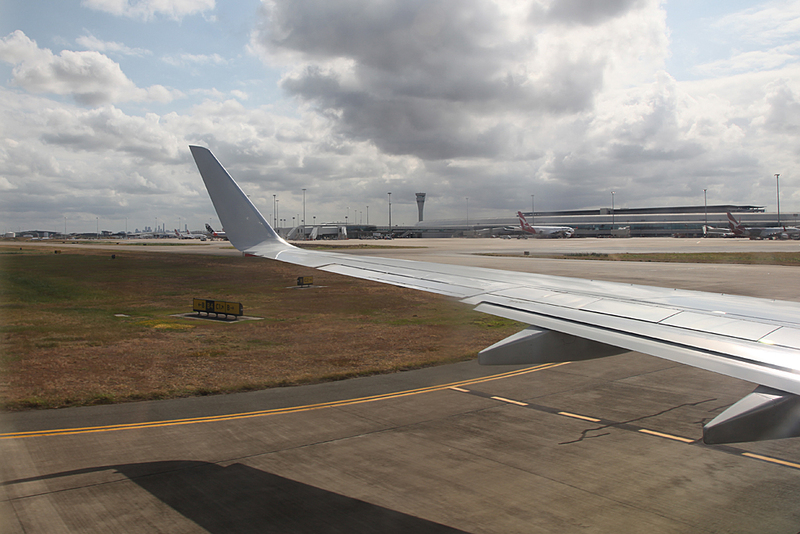 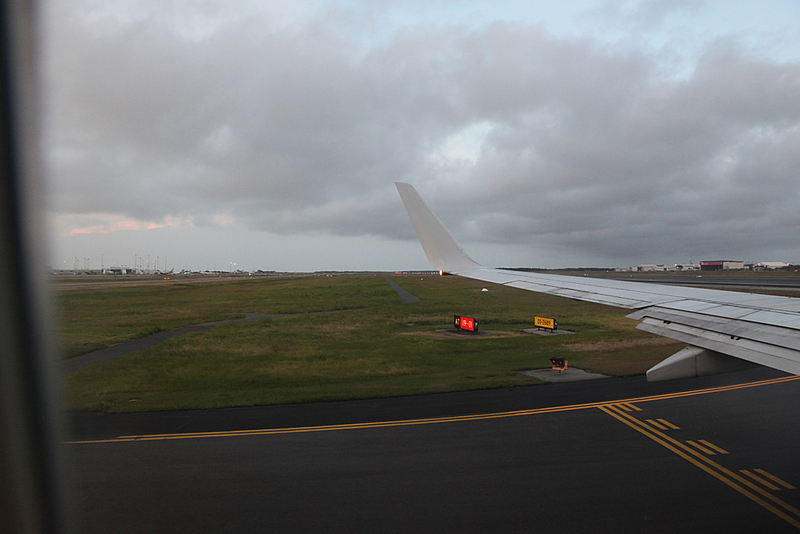 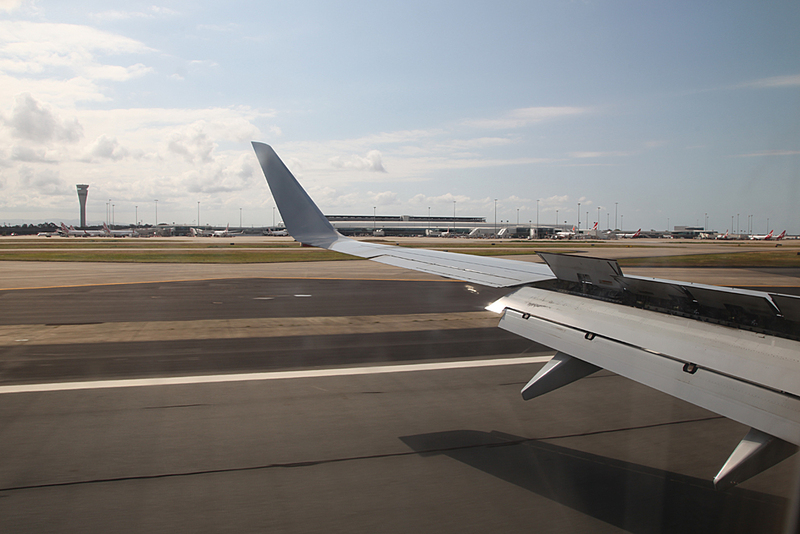 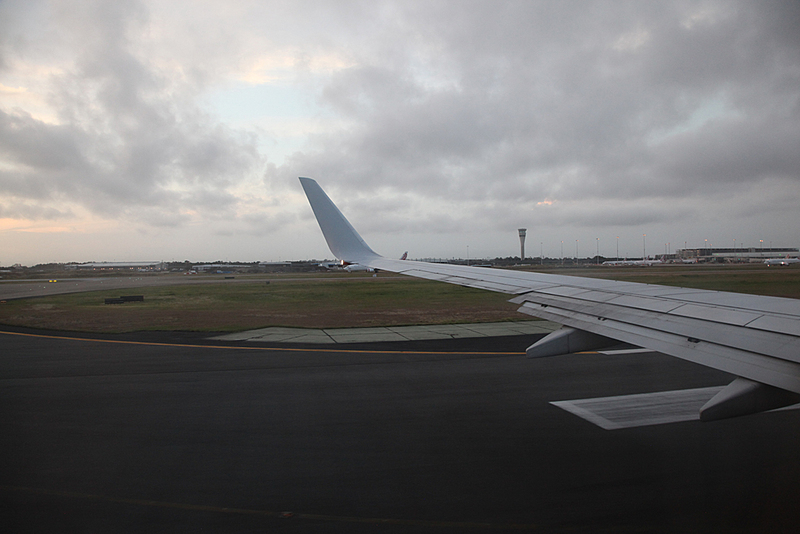 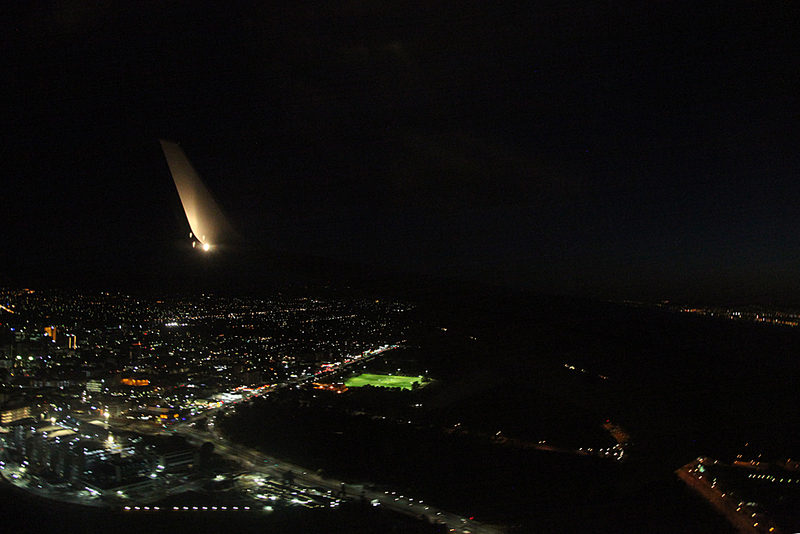 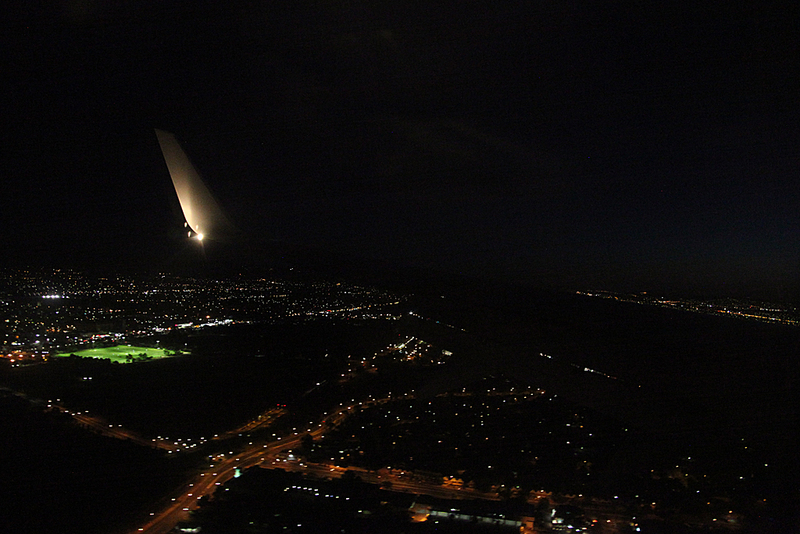 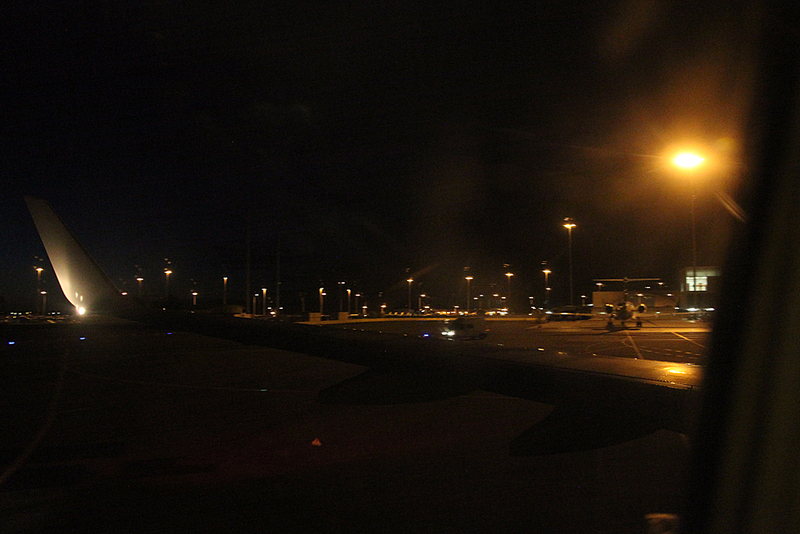 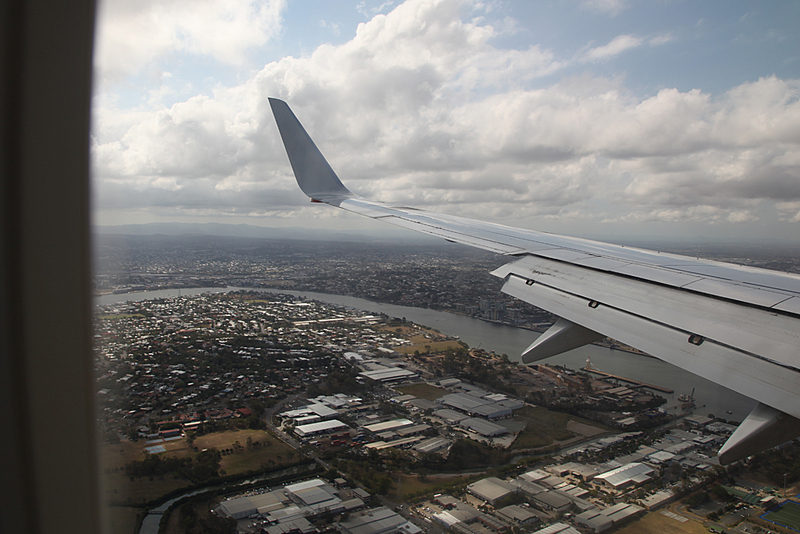 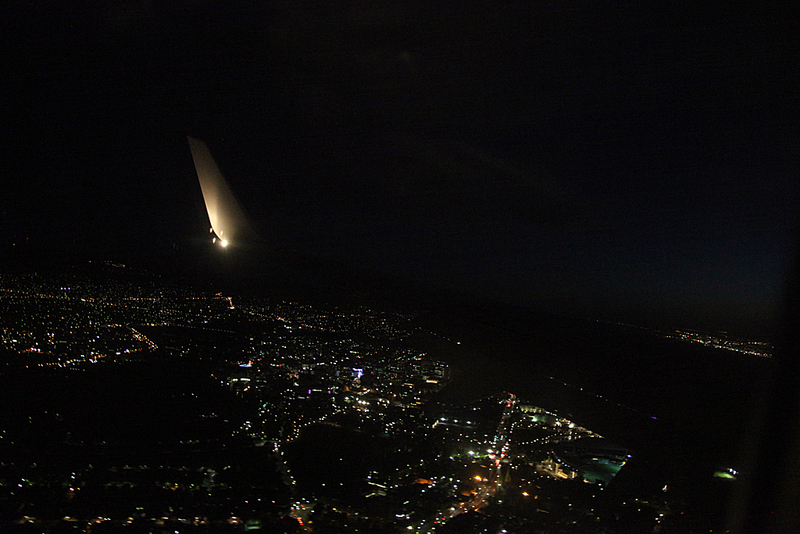 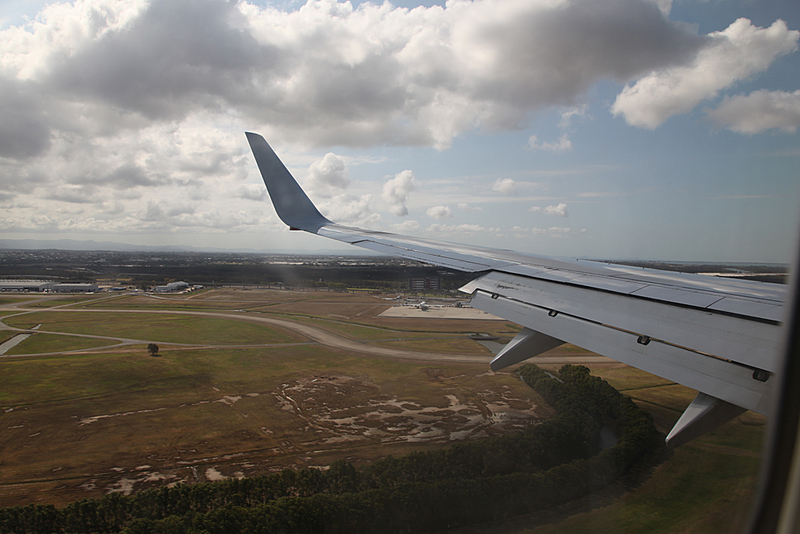 Landed on runway 01 in brisbane. 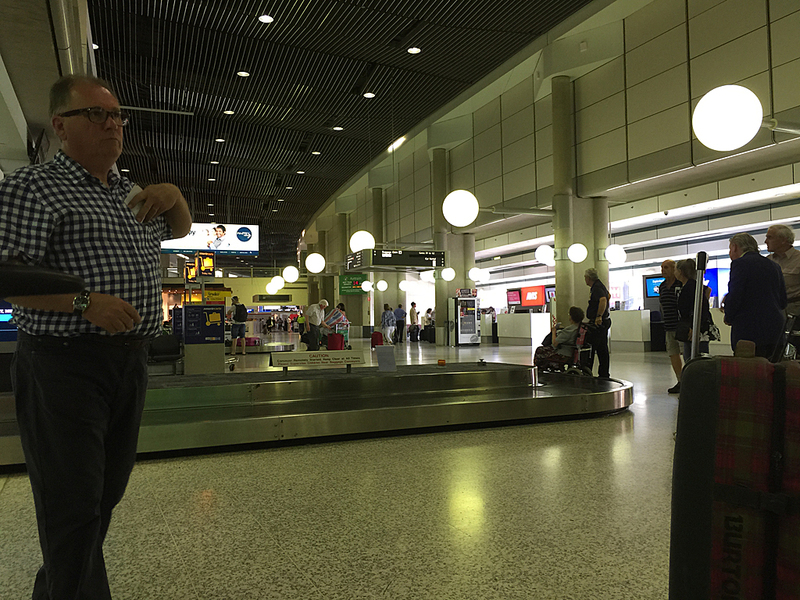 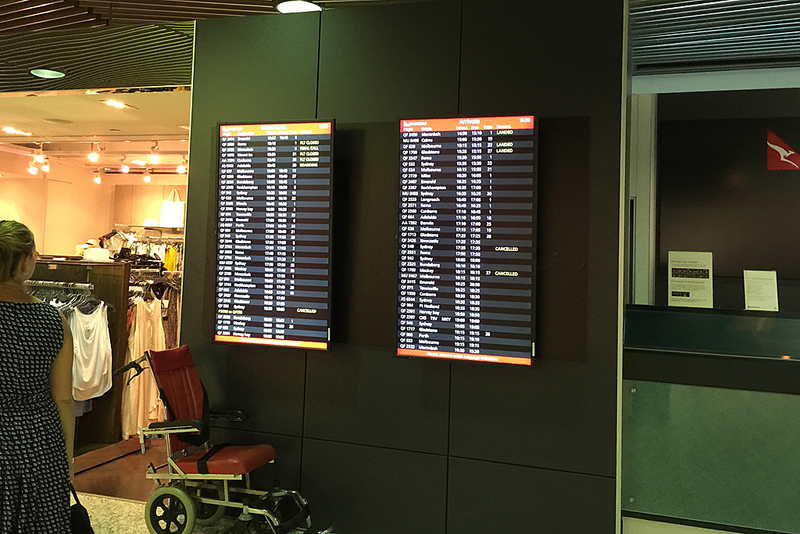 Not that familiar with brisbane airport. 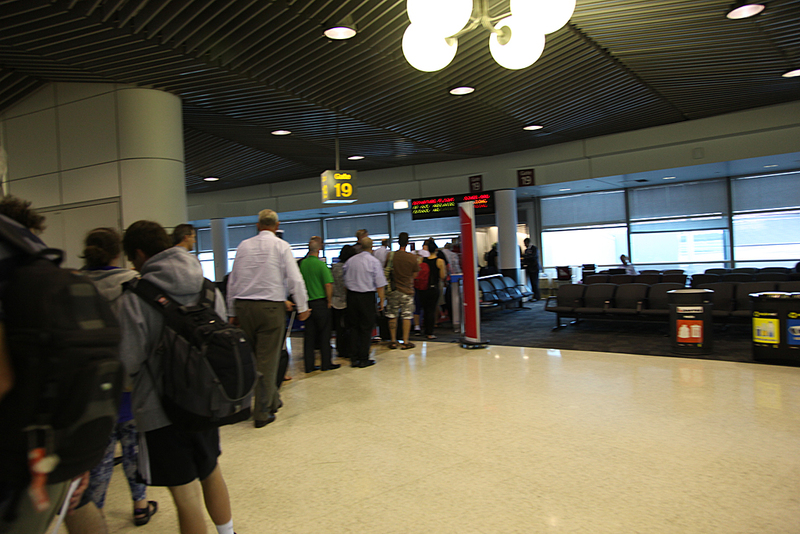 The impatient crowd trying to get out. 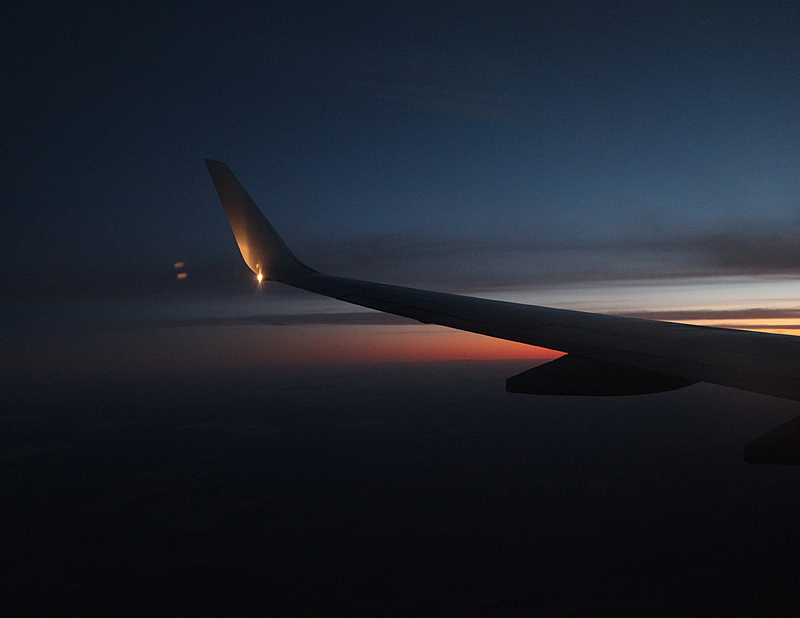 Since I was willing to wait. 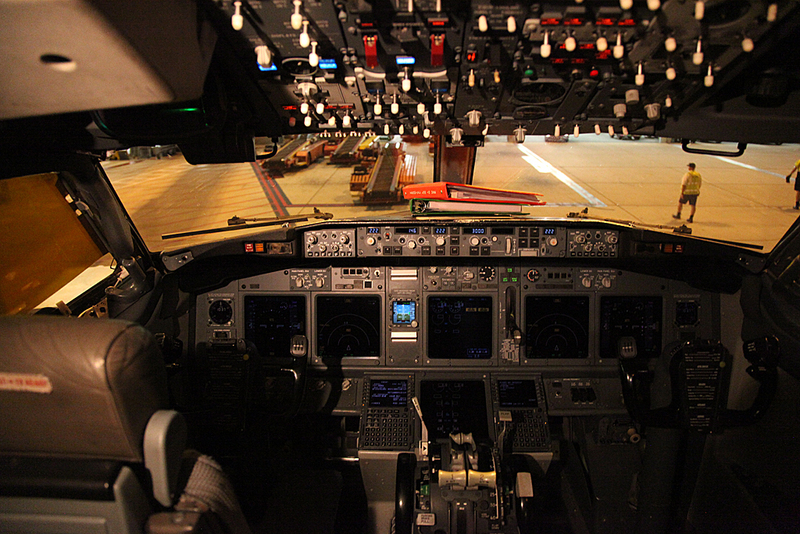 Once the crowd had cleared, a quick photo of the flight deck on the way out. 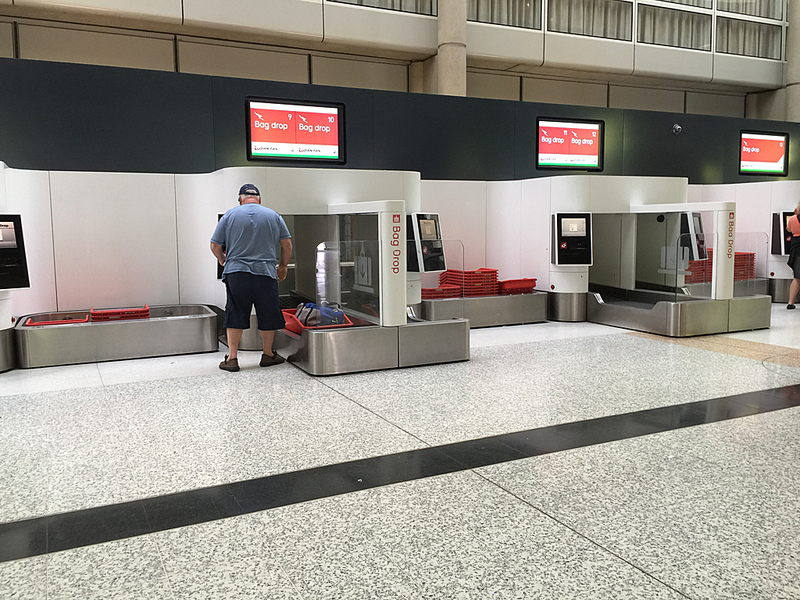 Baggage reclaim area looking a bit dated I think. 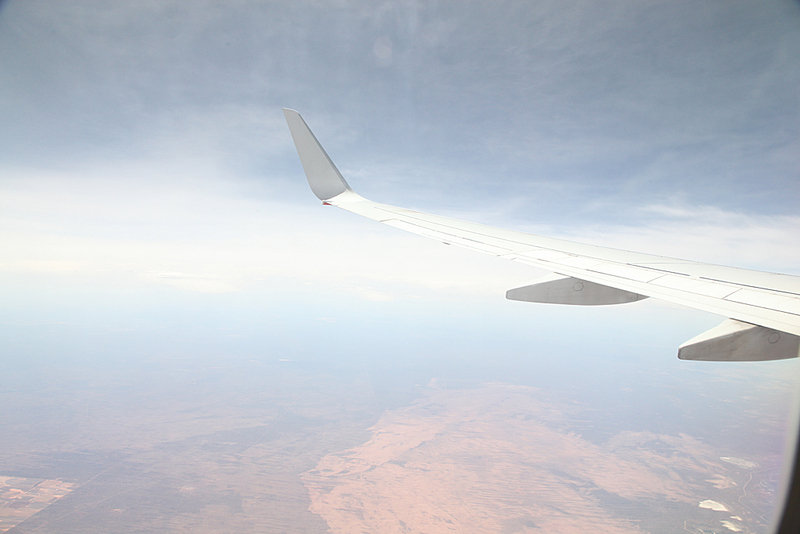 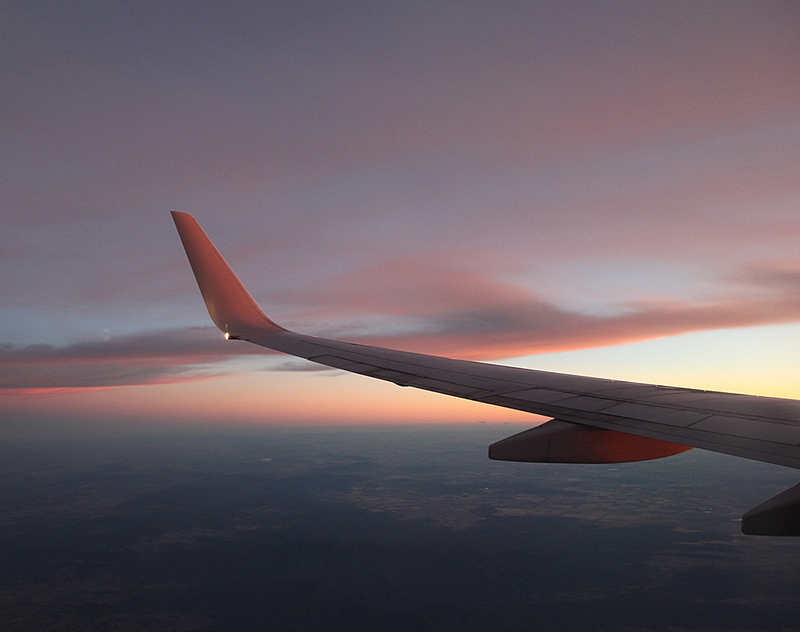 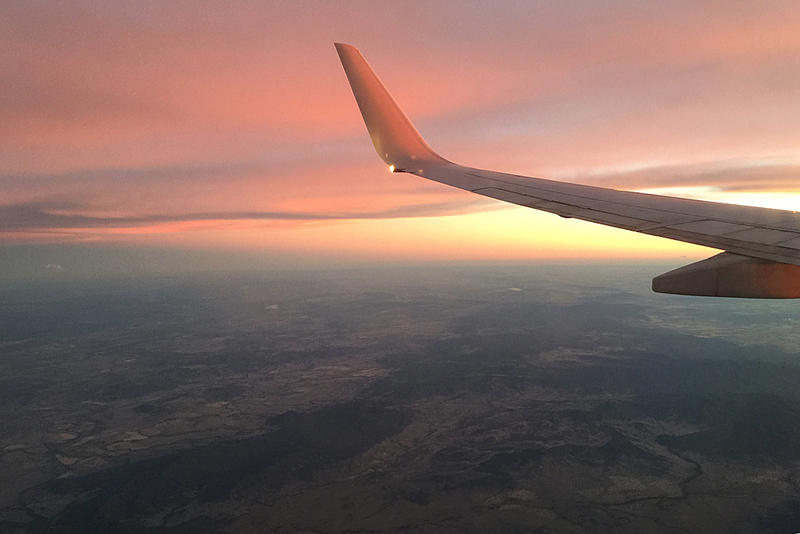 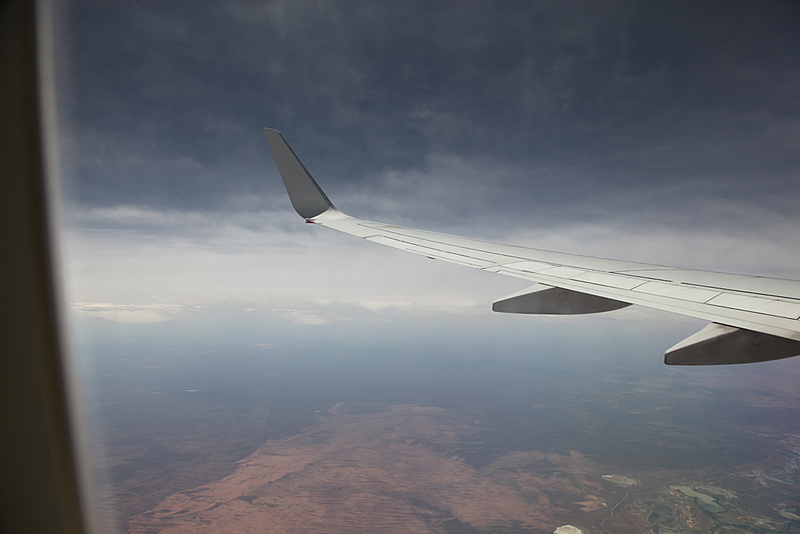 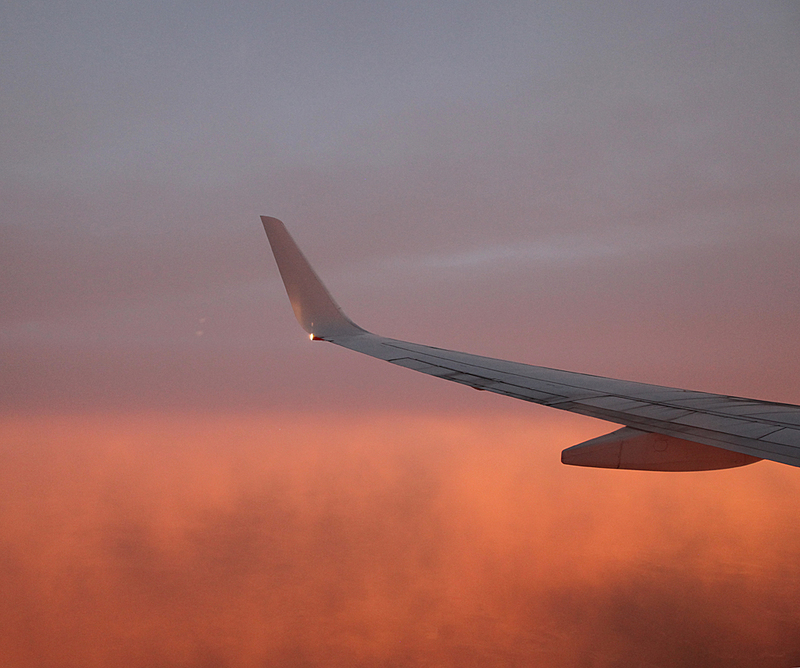 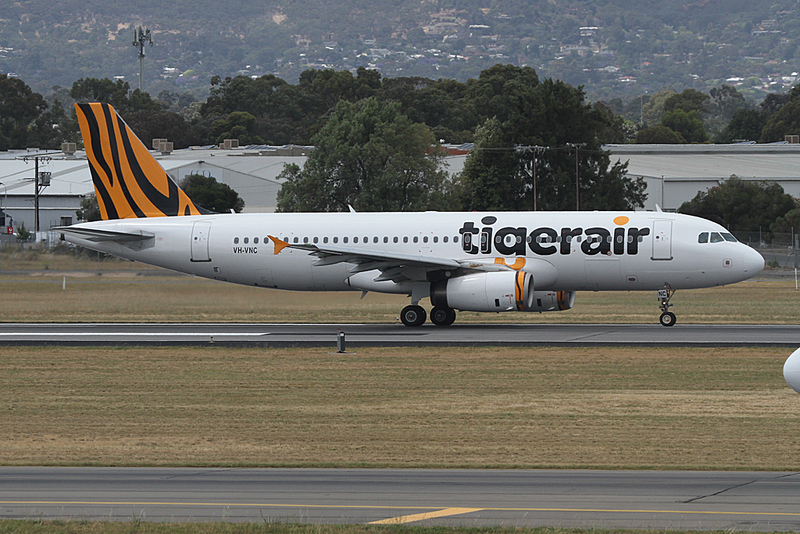 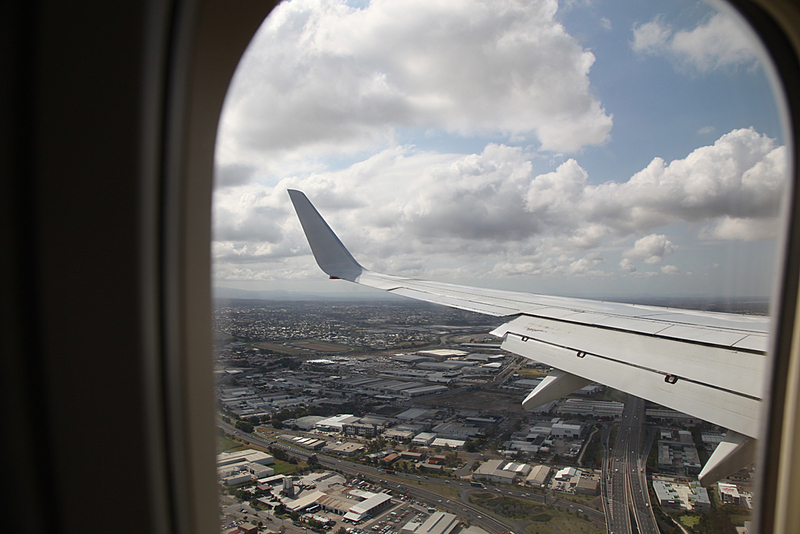 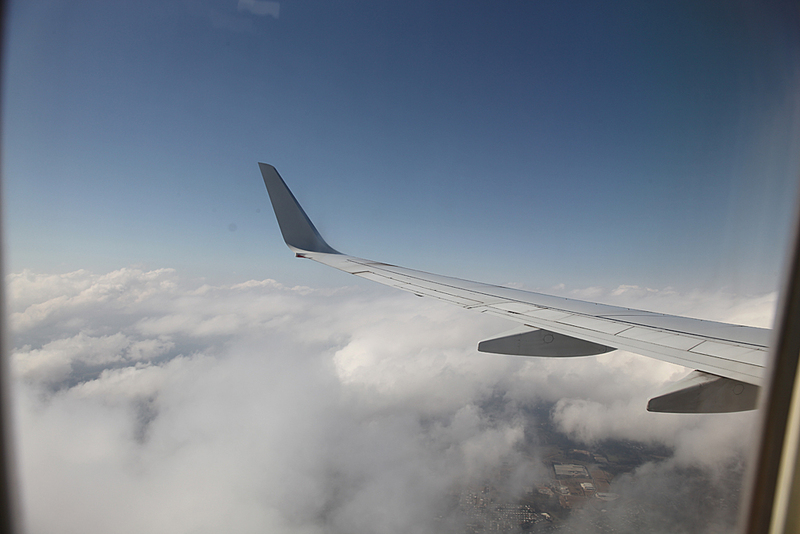 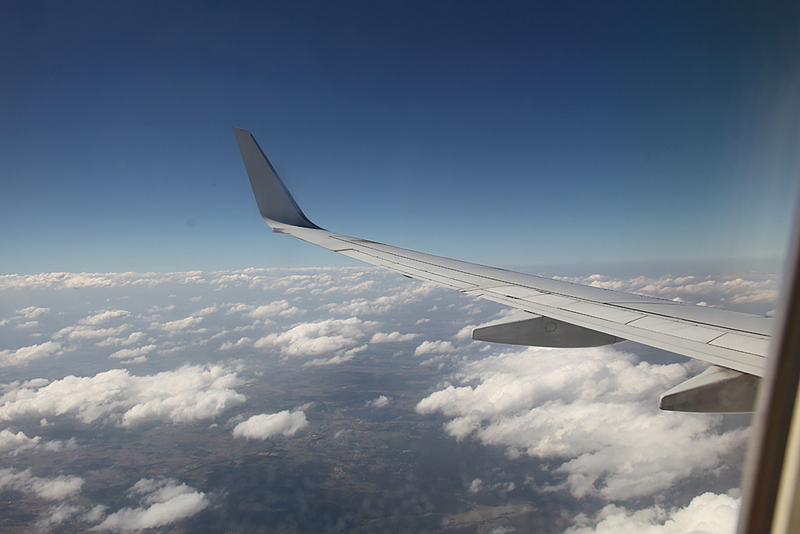 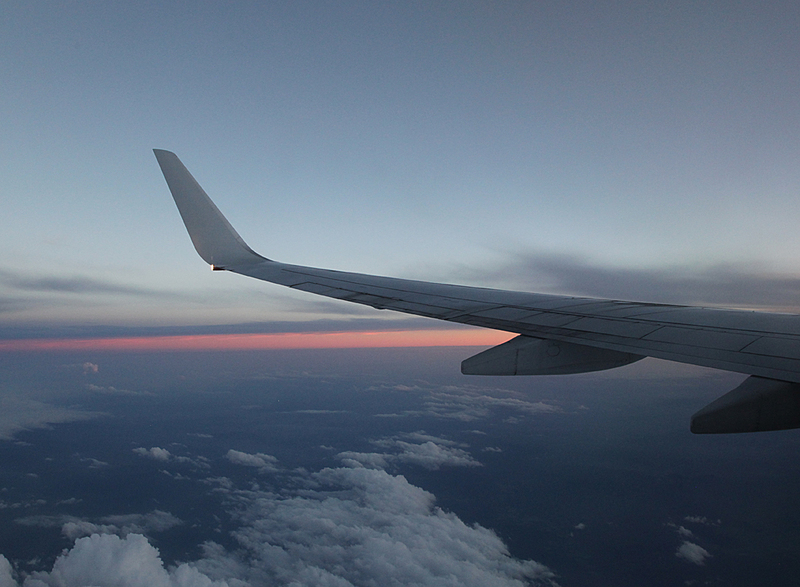 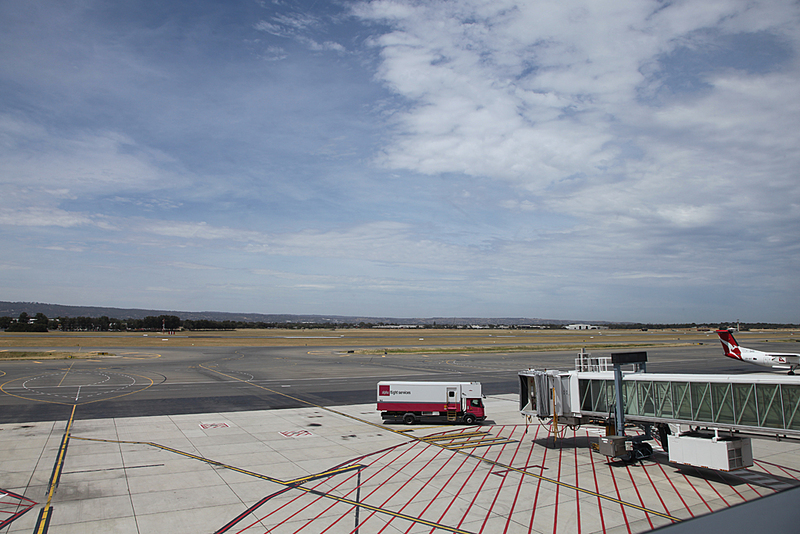 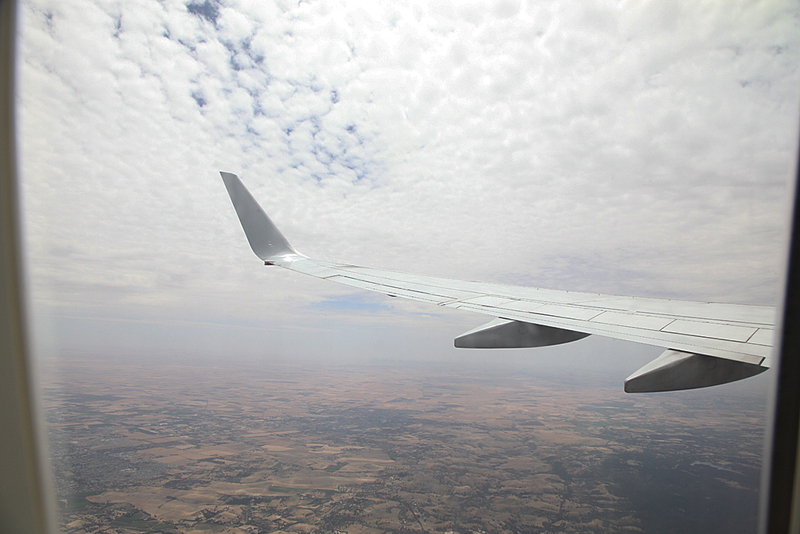 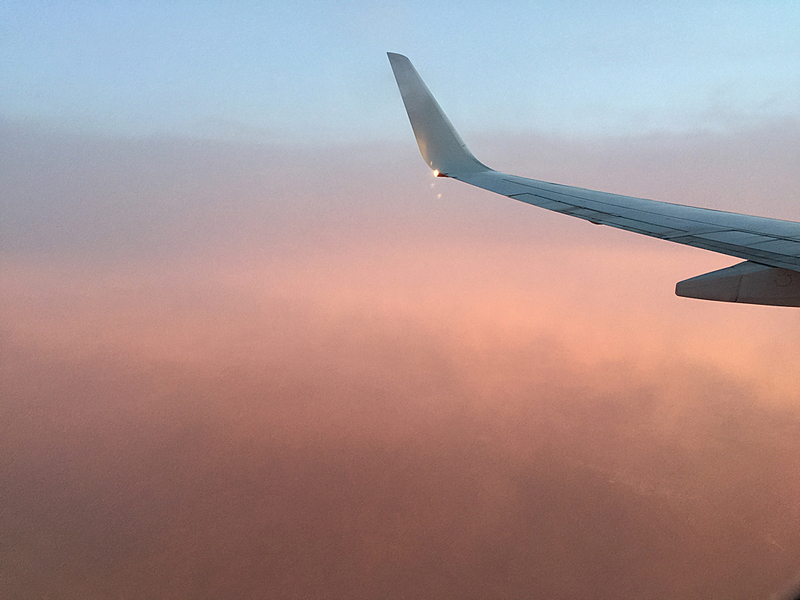 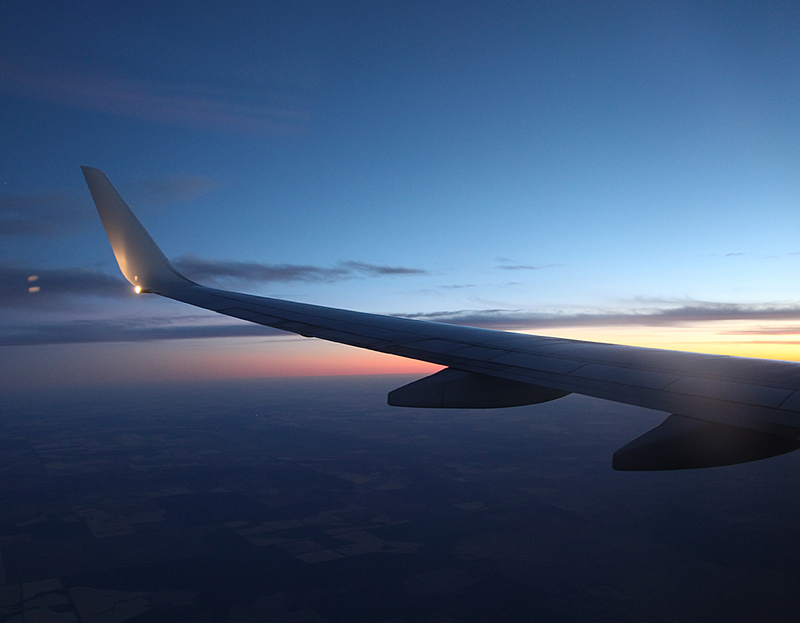 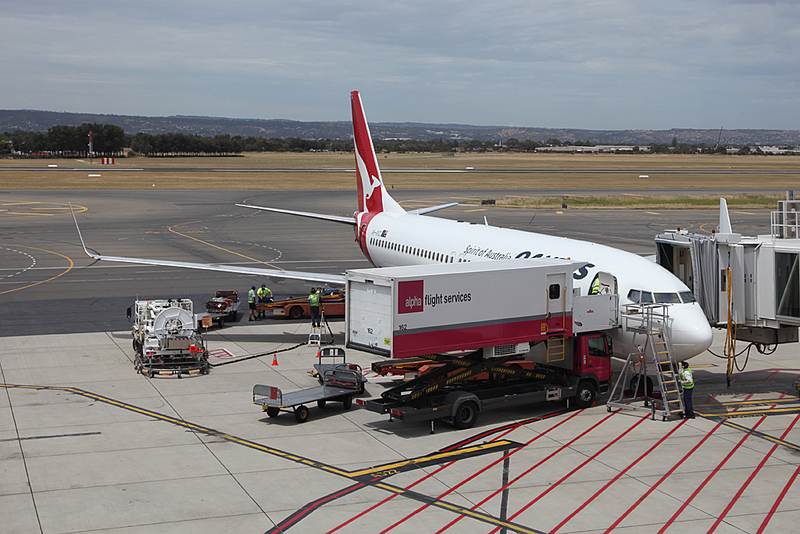 The trip out to Thargomindah and back and return flight back to Adelaide will be coming soon. 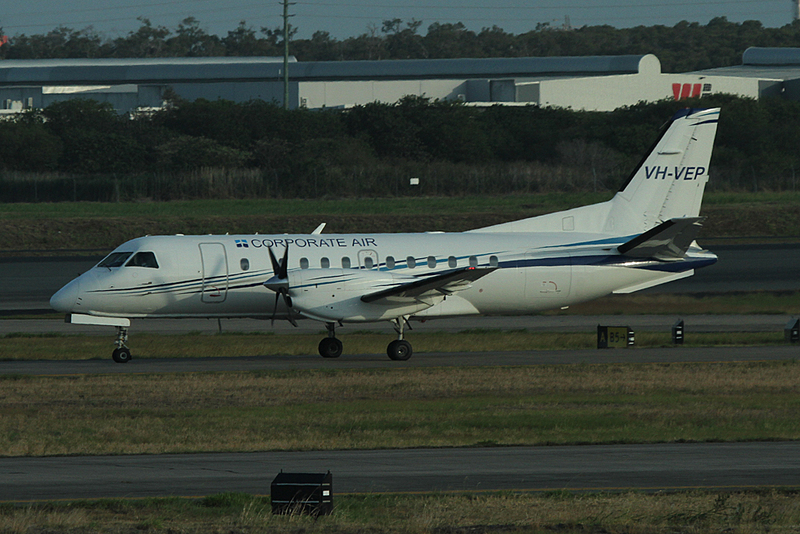 Flight on Skytrans Dash8-100 to Thargomindah. 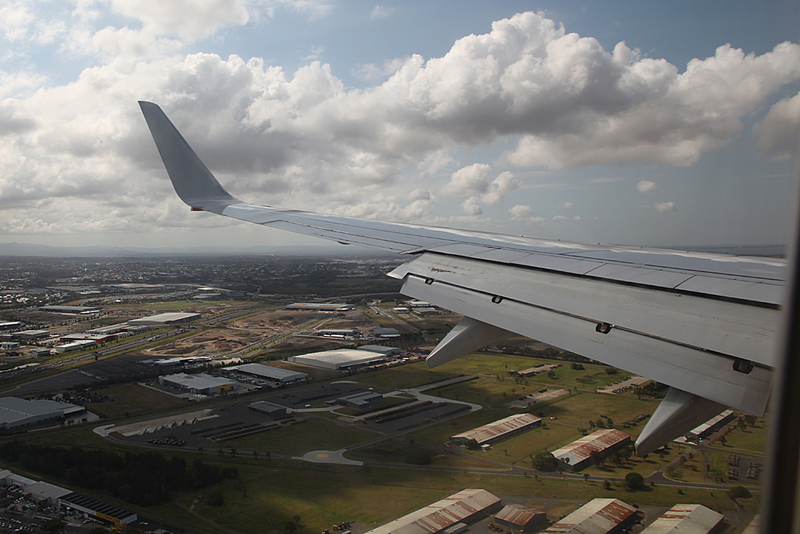 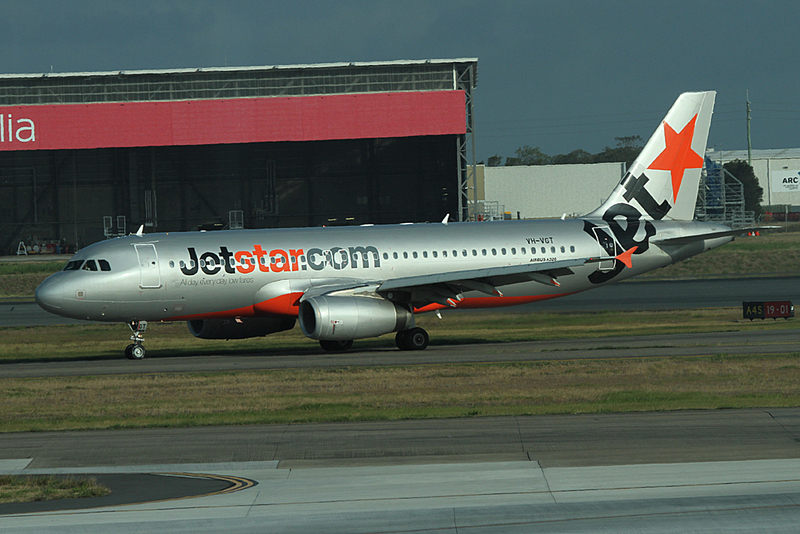 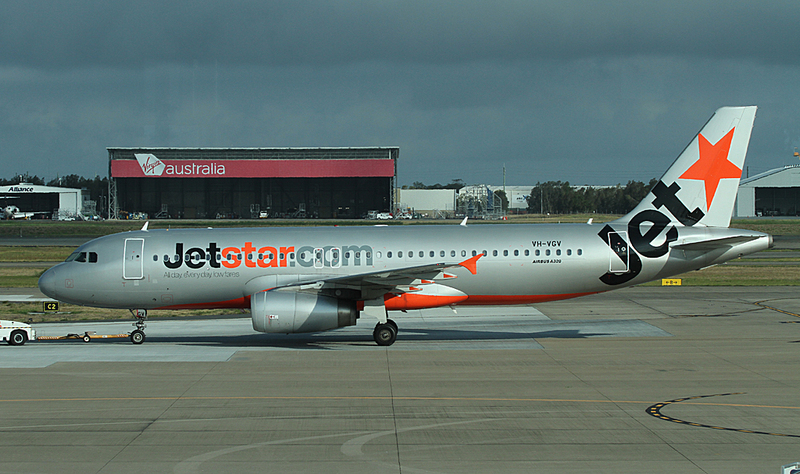 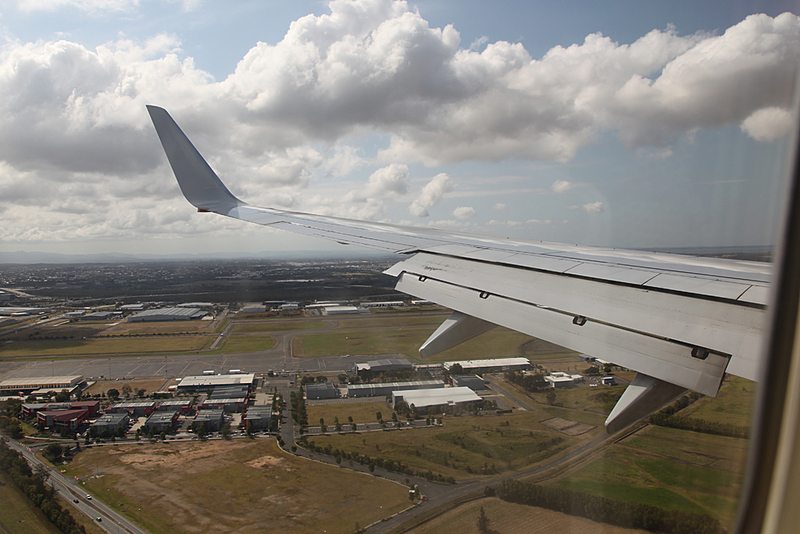 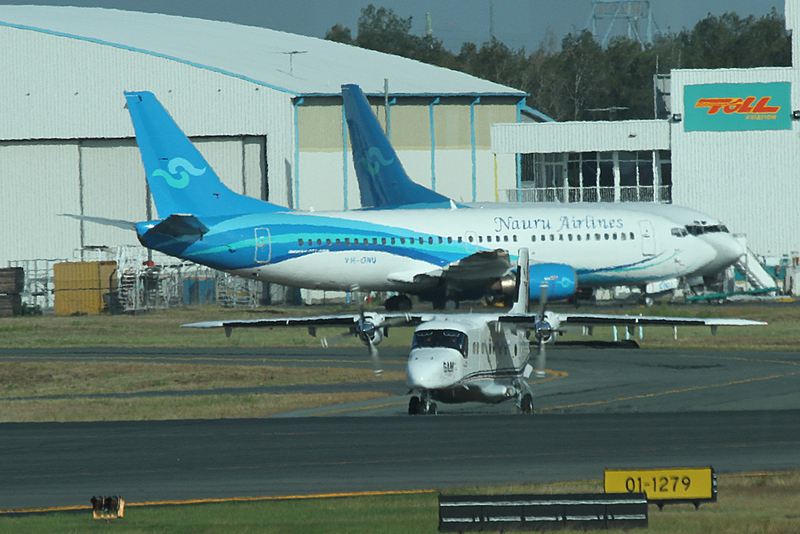 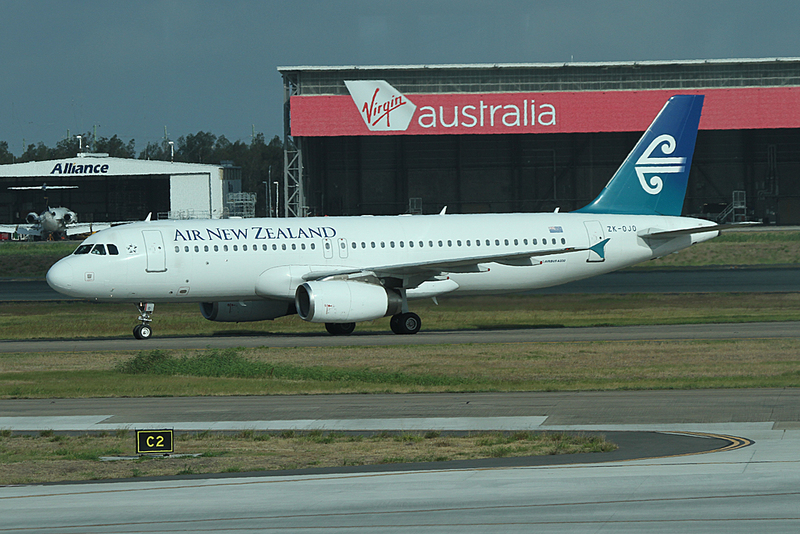 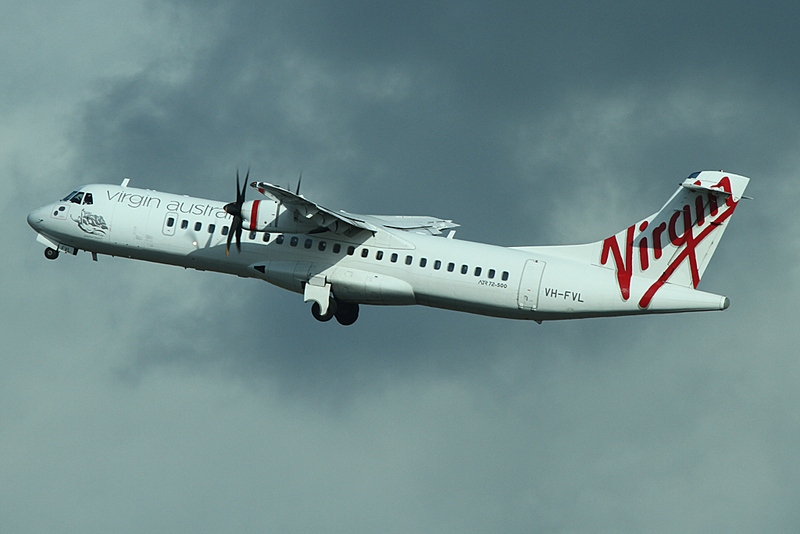 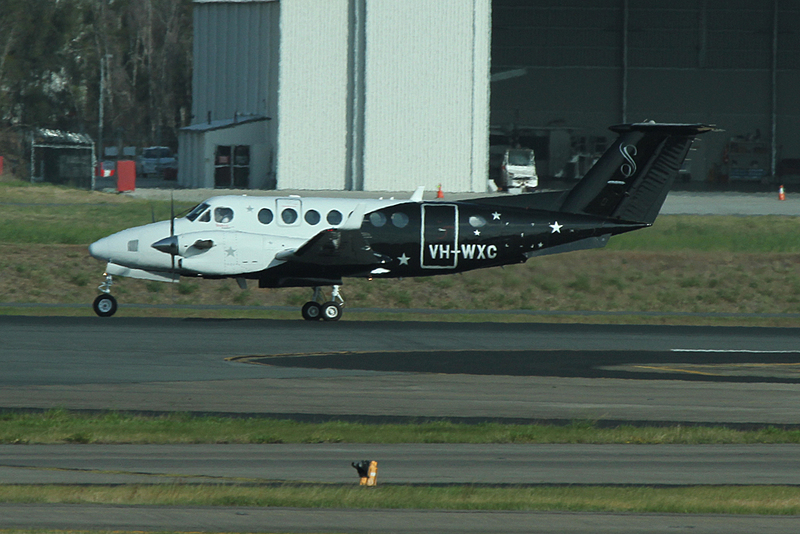 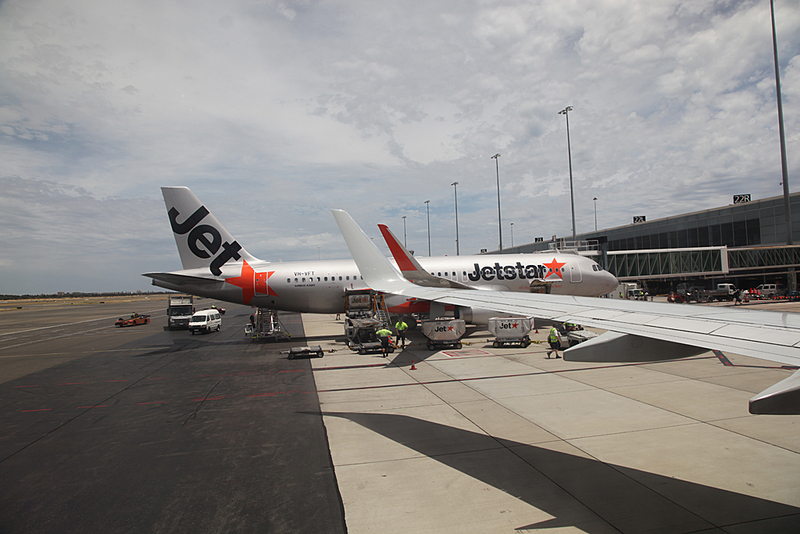 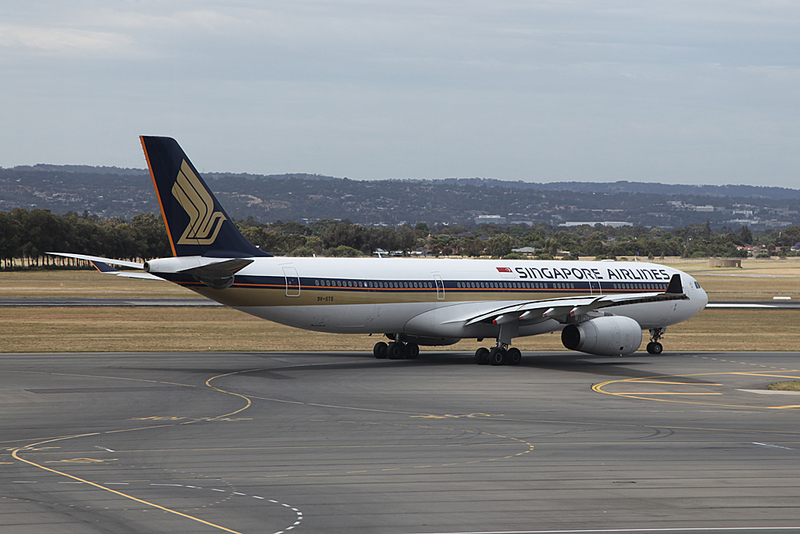 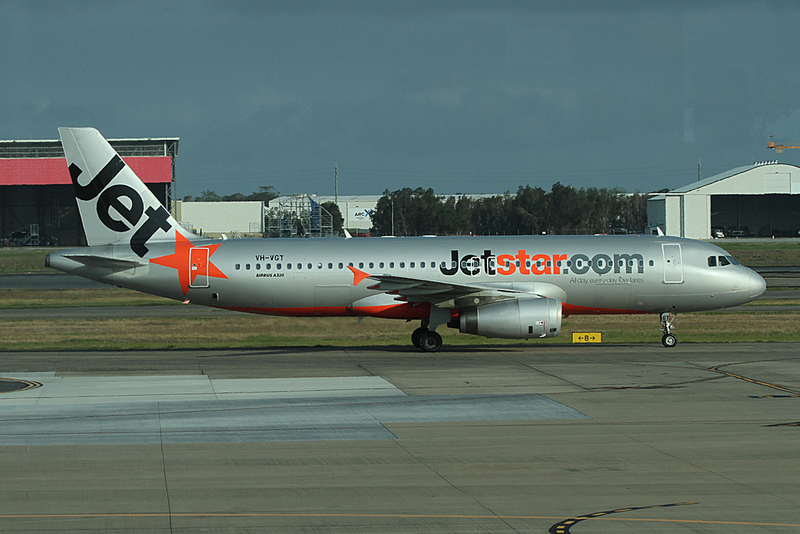 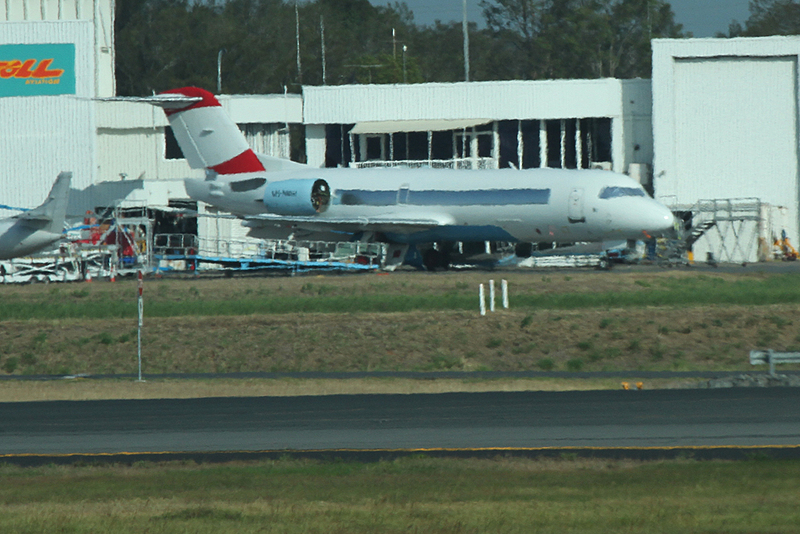 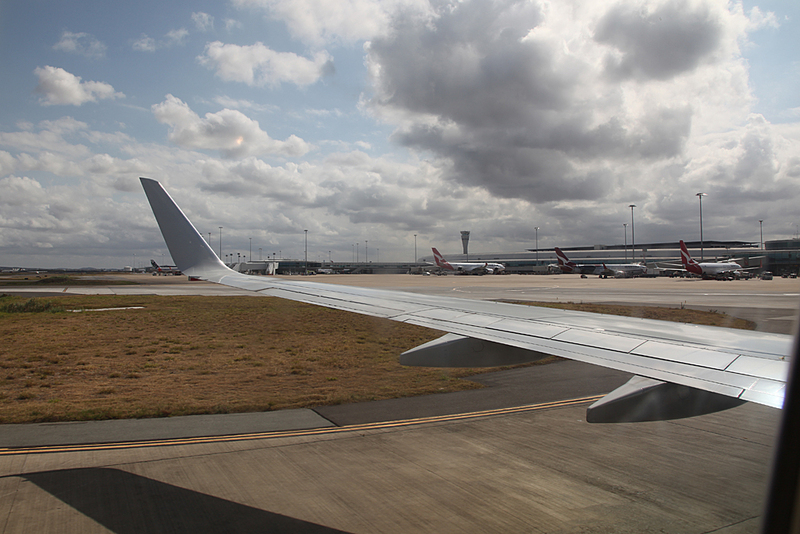 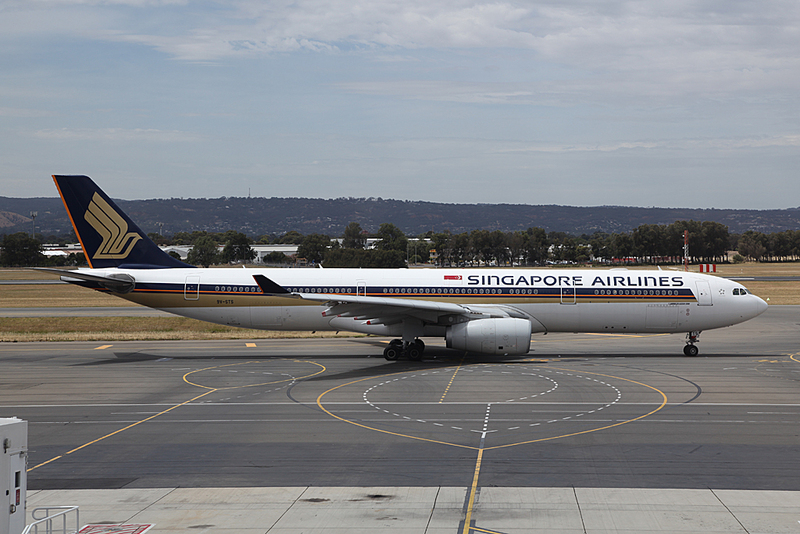 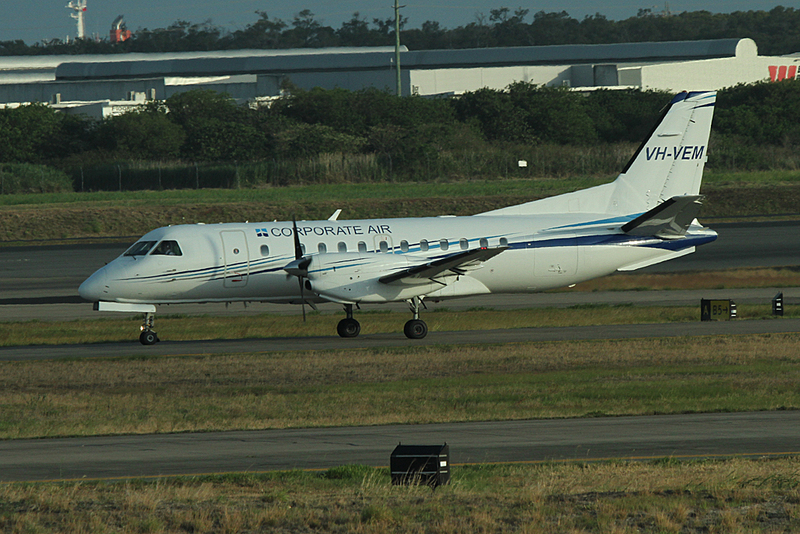 Spent the morning photographing aircraft around Brisbane airport. 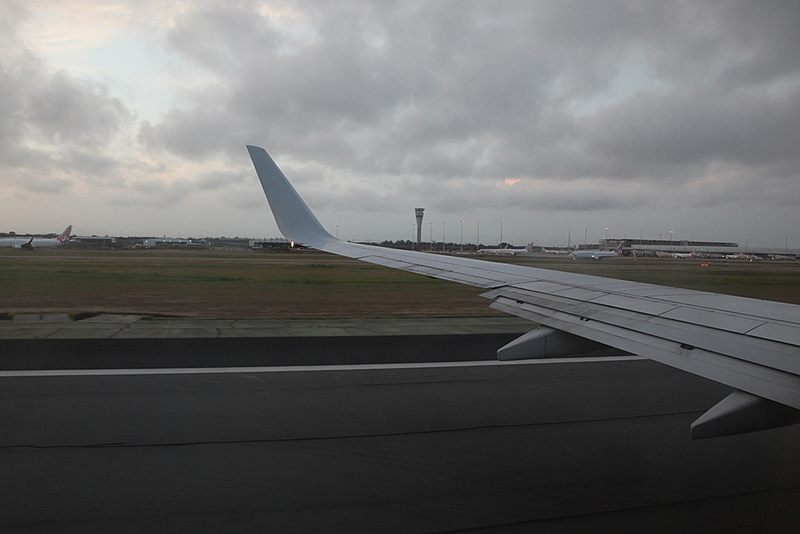 Returned hire car about 2:30 PM. 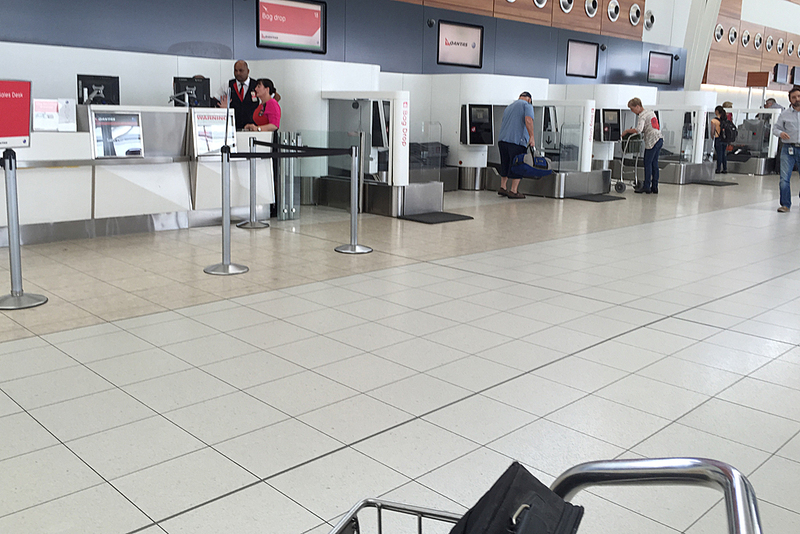 Self check in worked this time. 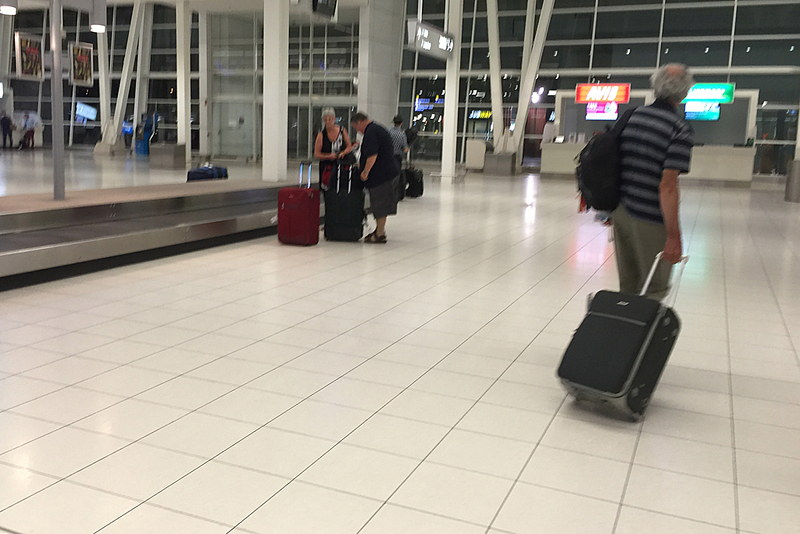 The usual take the laptop out of the bag security theatre. 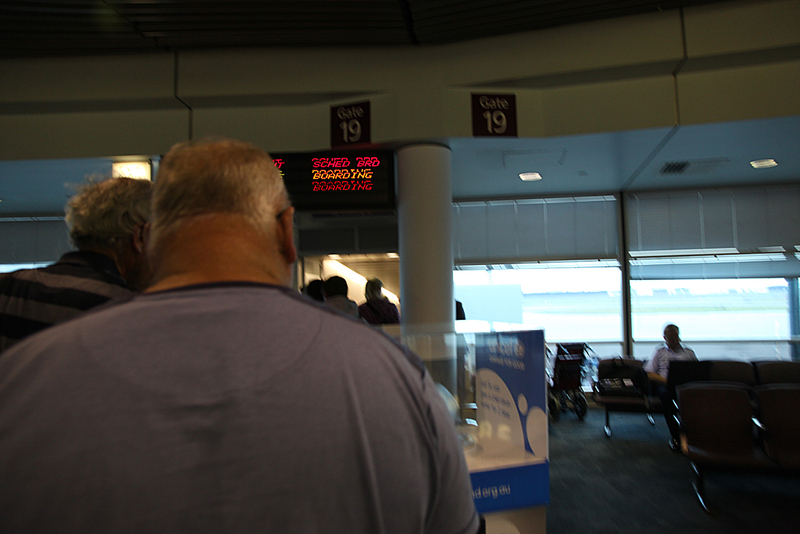 What did I do to deserve the extra explosives check?. 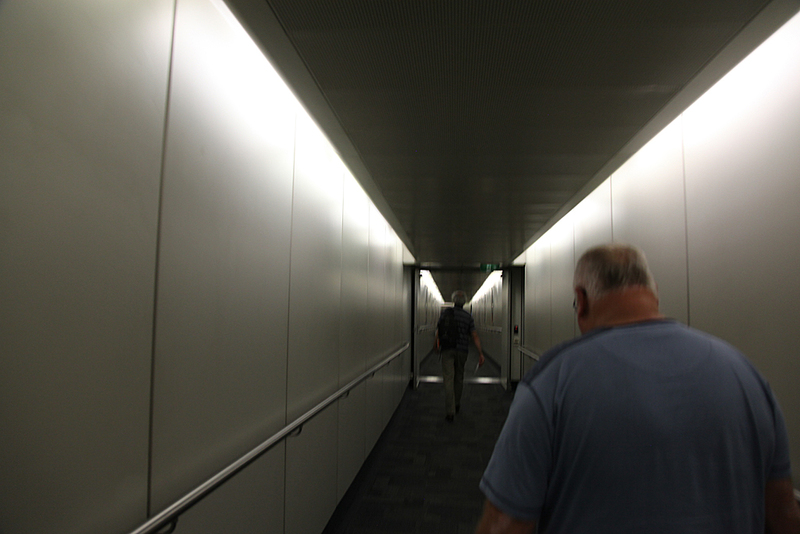 Dad didn't get it but I did. 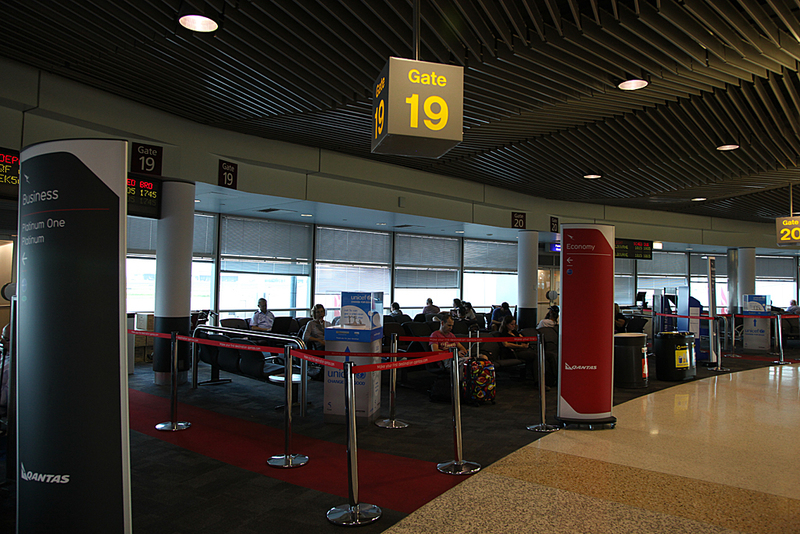 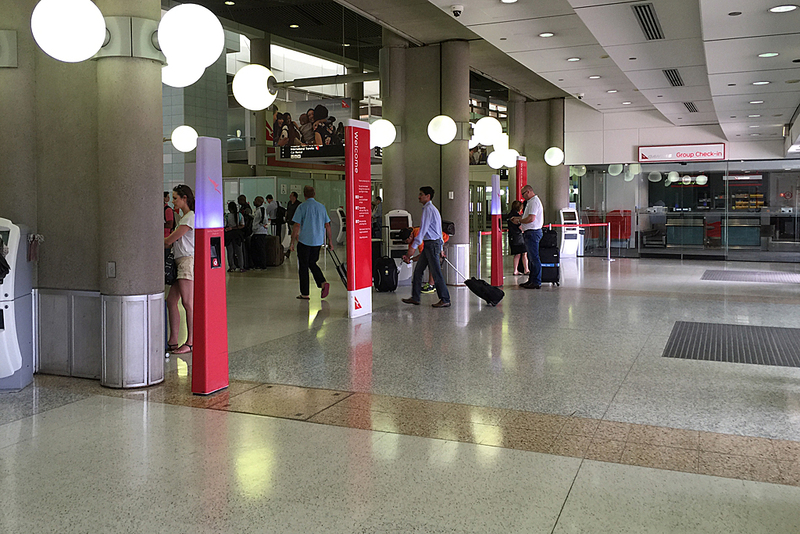 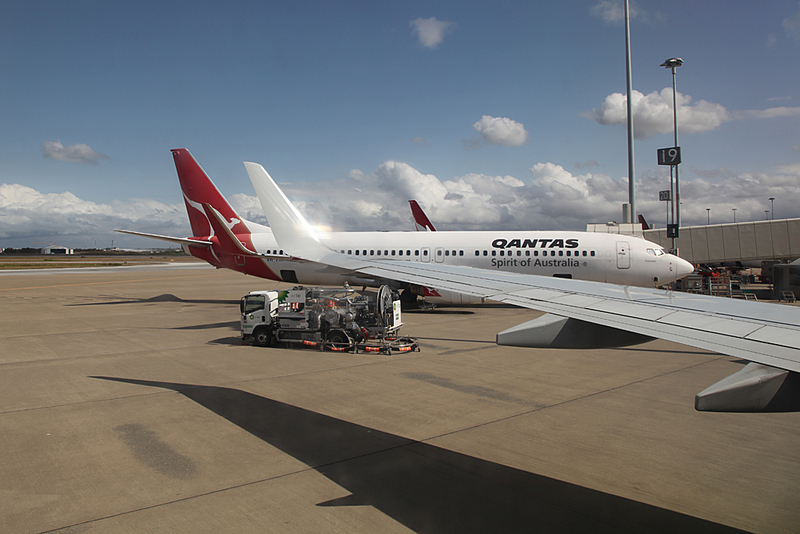 Grabbed some lunch and then made our way to the Qantas part of the terminal. 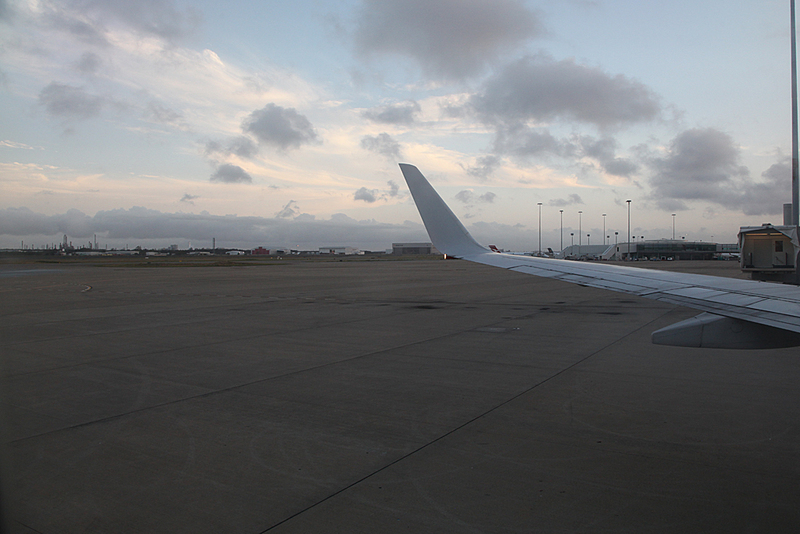 Watched the action for the next couple of hours. 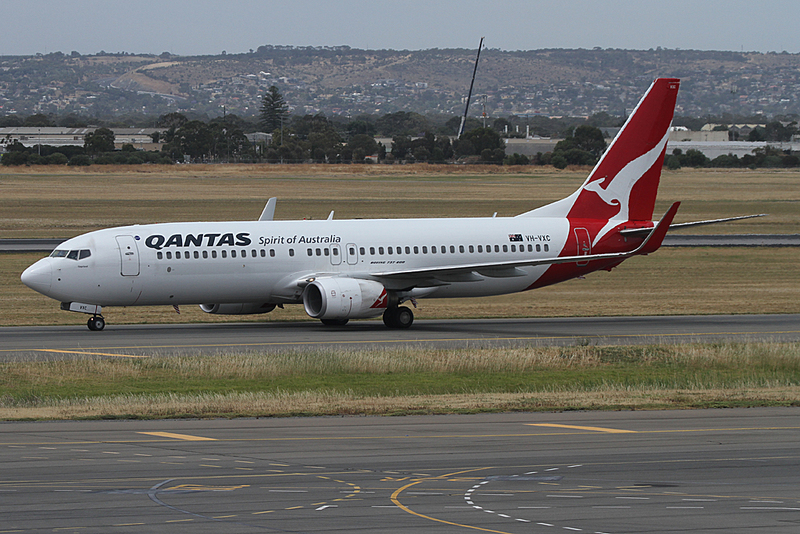 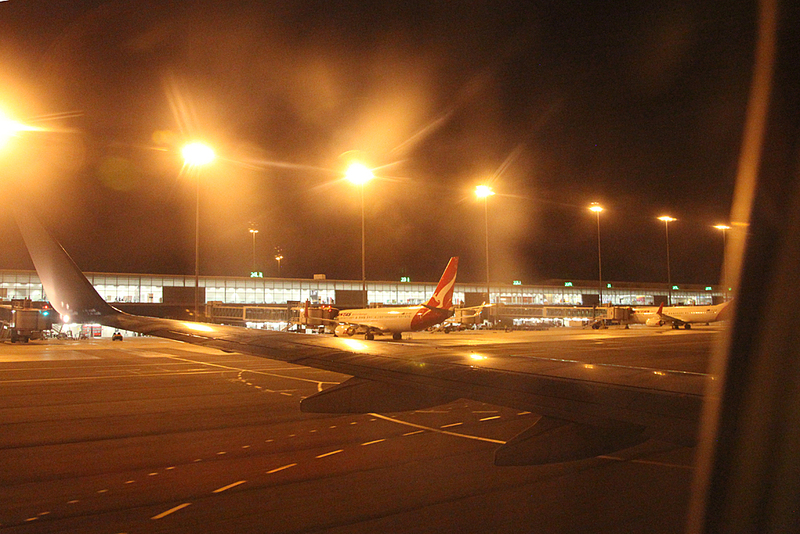 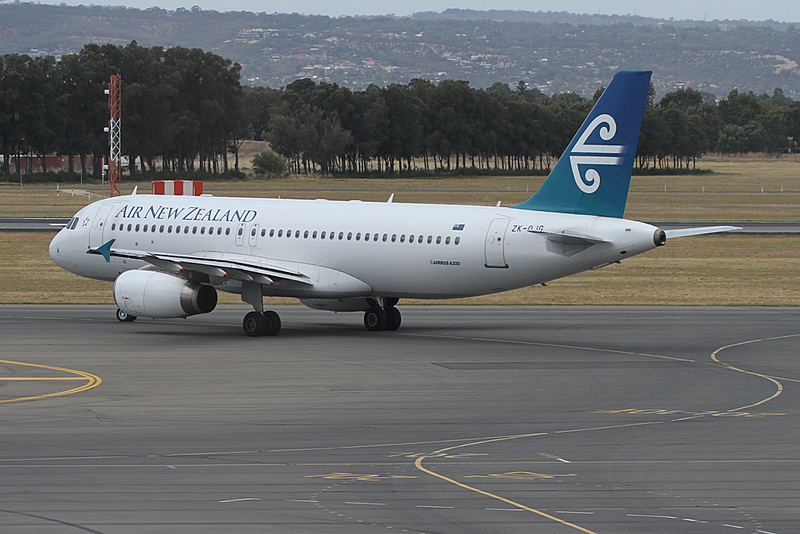 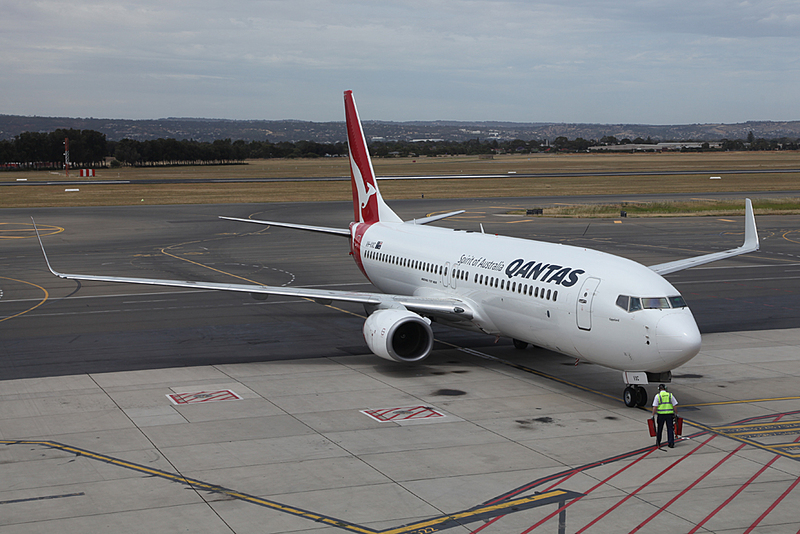 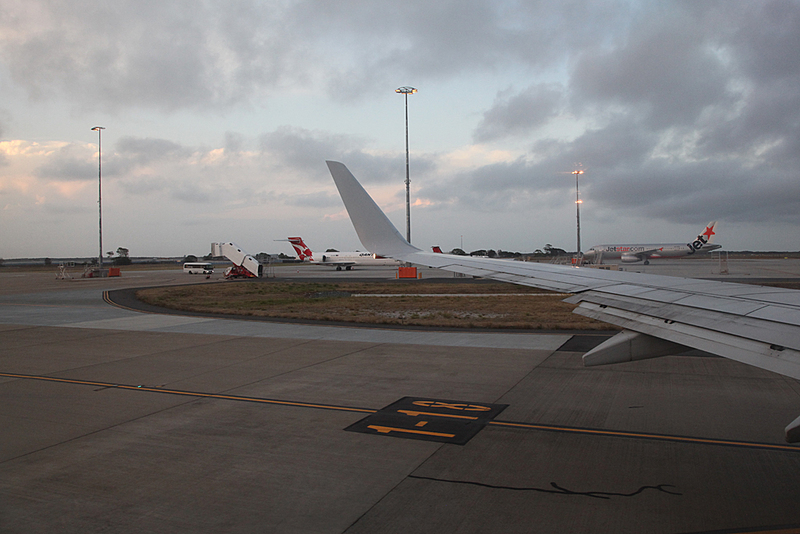 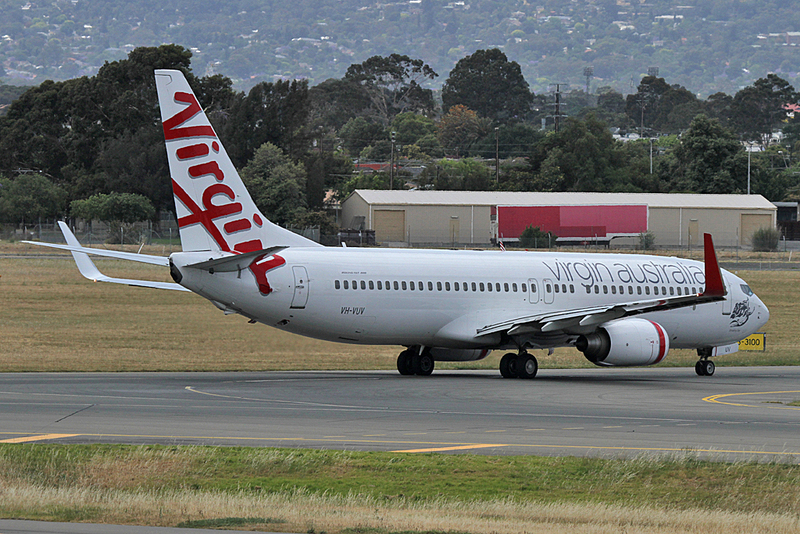 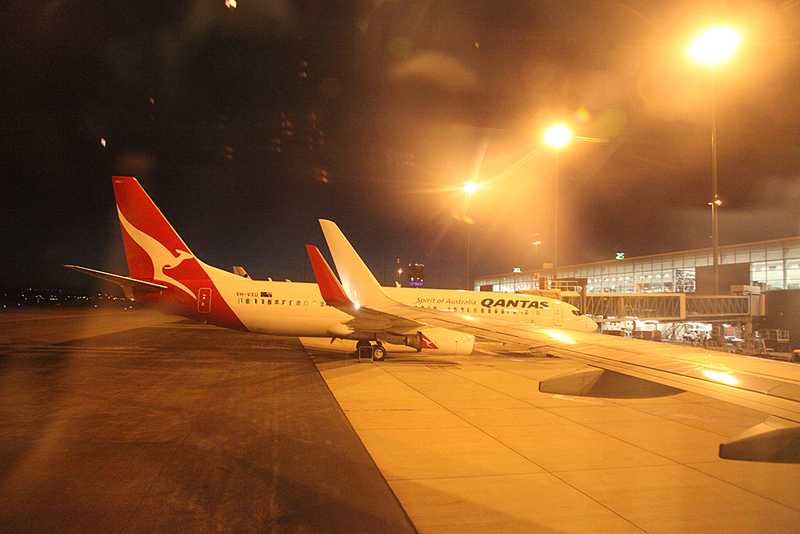 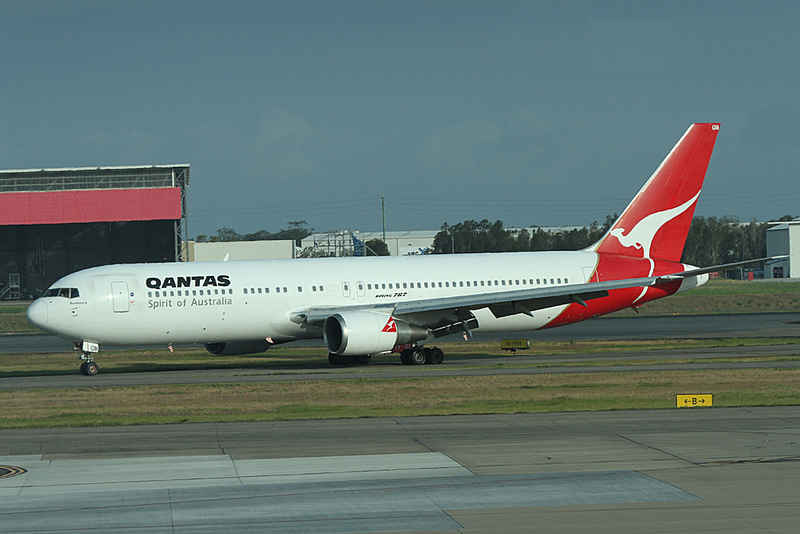 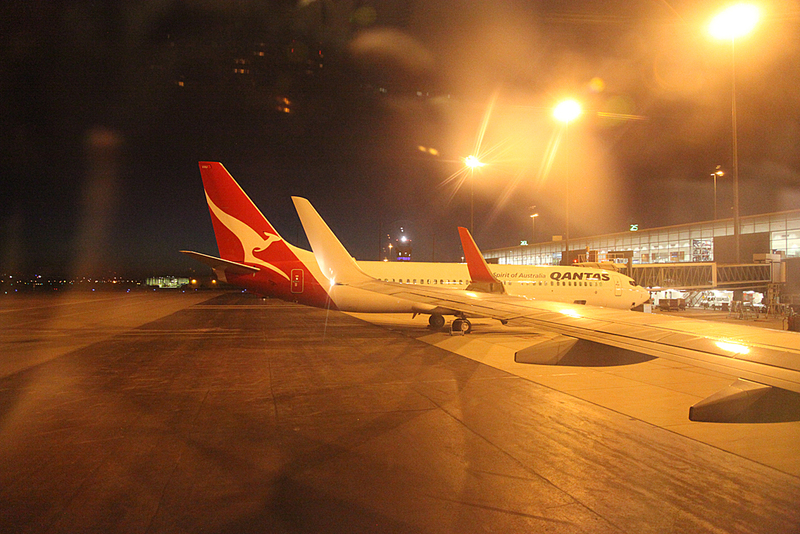 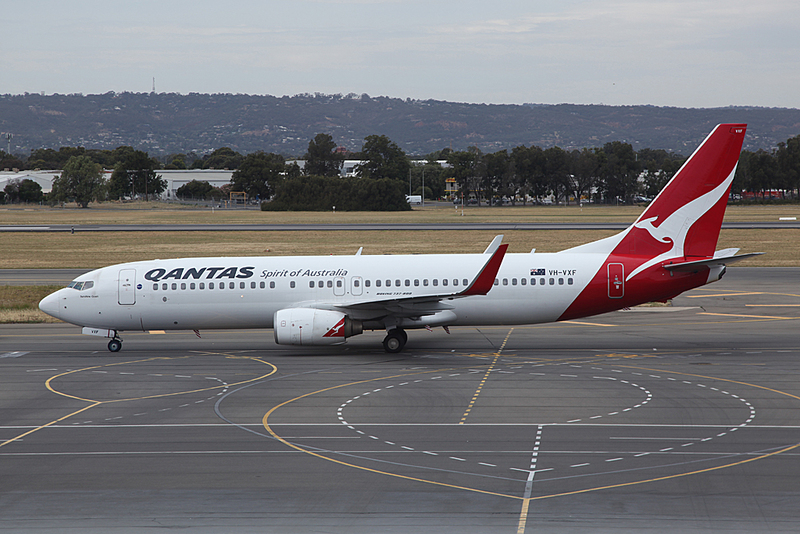 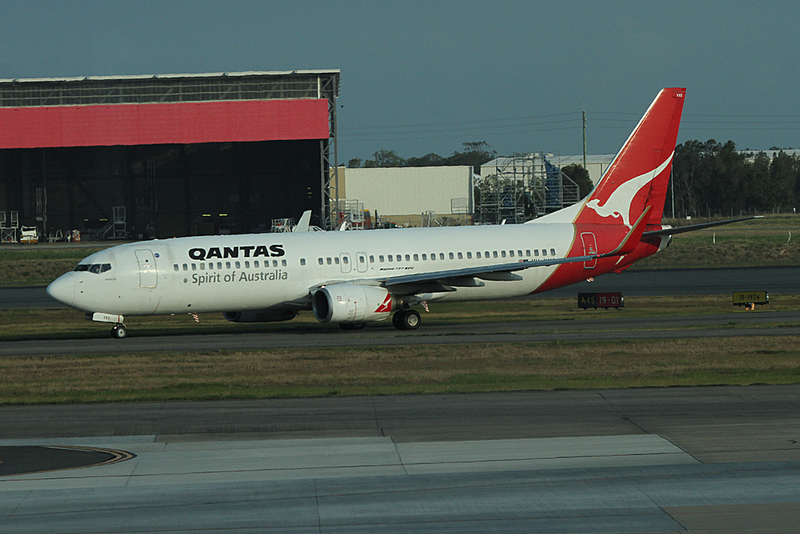 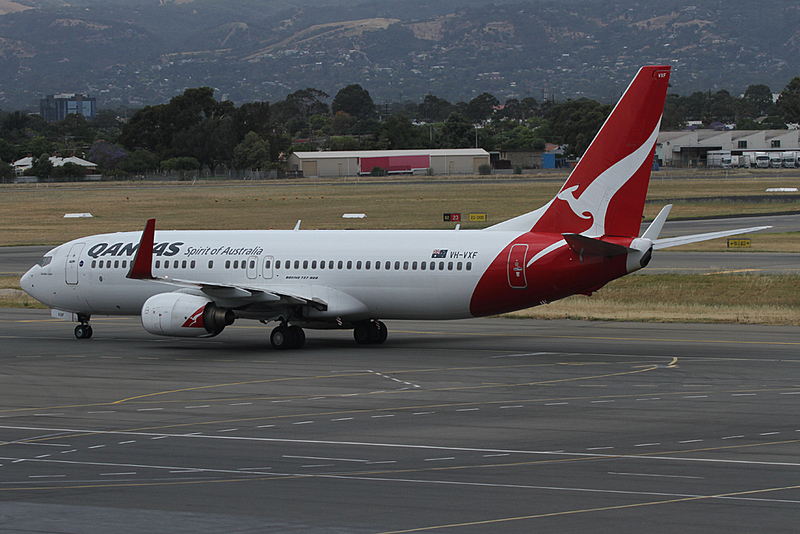 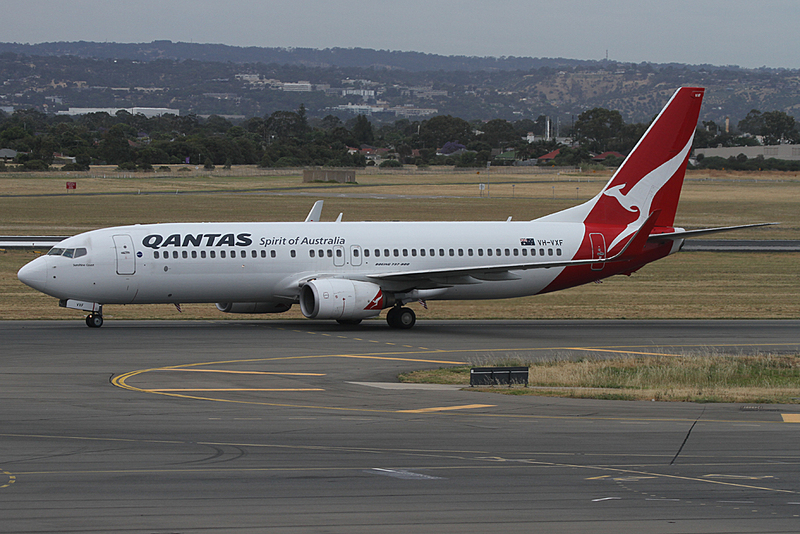 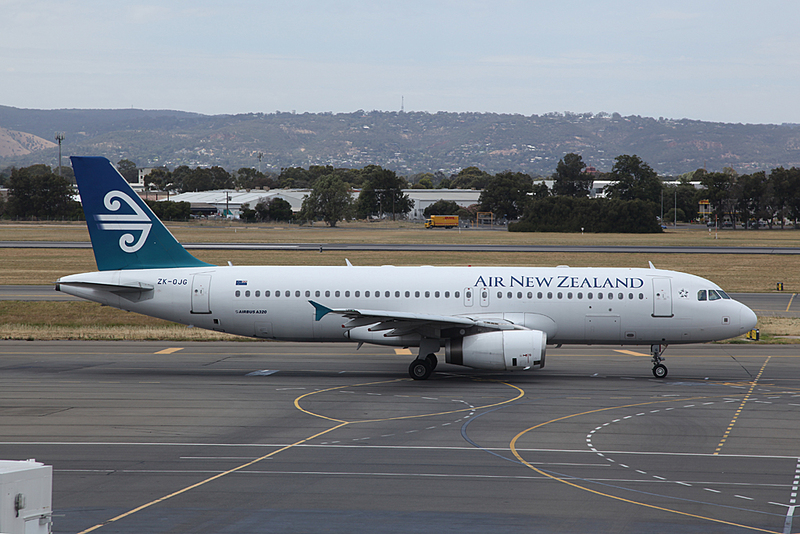 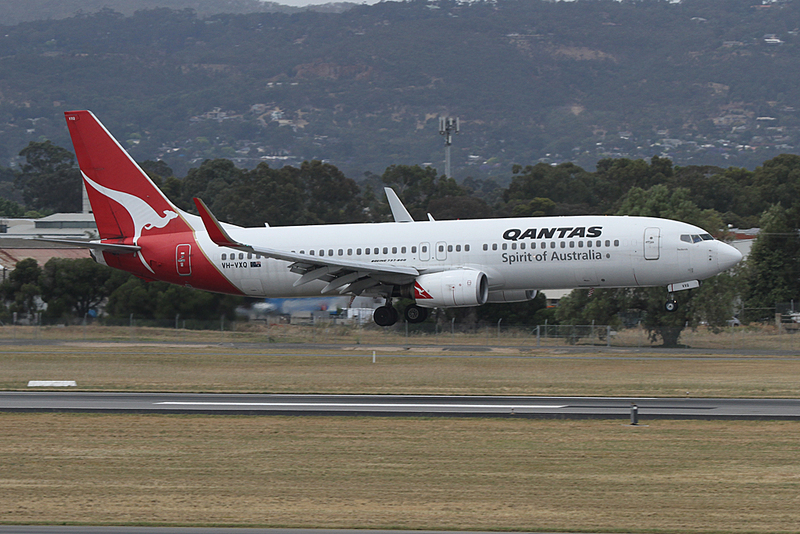 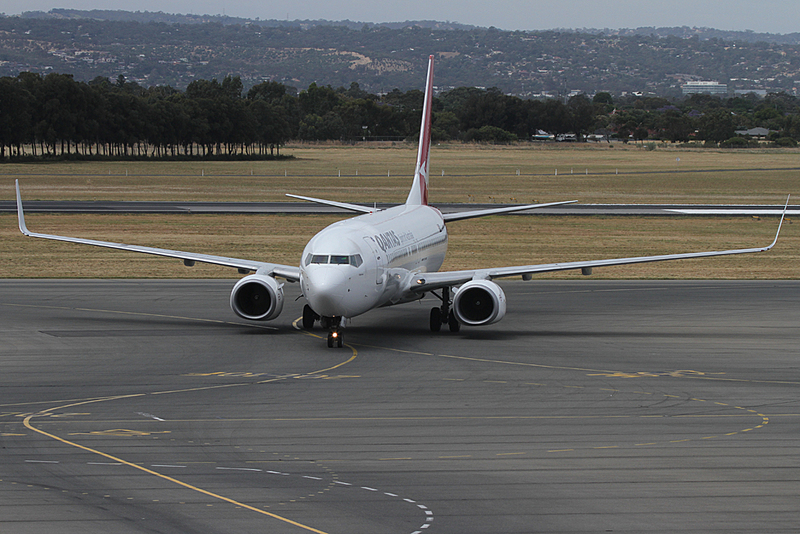 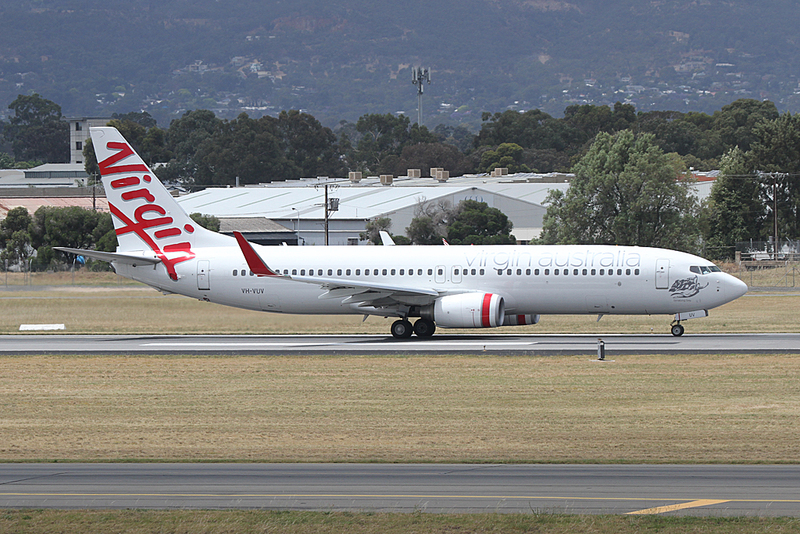 Tonight's aircraft is VH-VXQ, one of the earlier 737-800s delivered to Qantas. 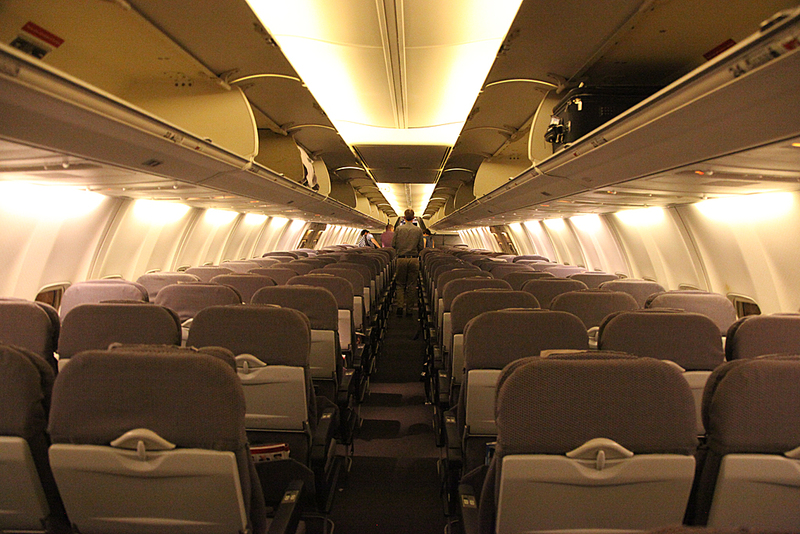 Again no flashy interior and It's a full flight today so dad and I didn't get the empty middle seat. 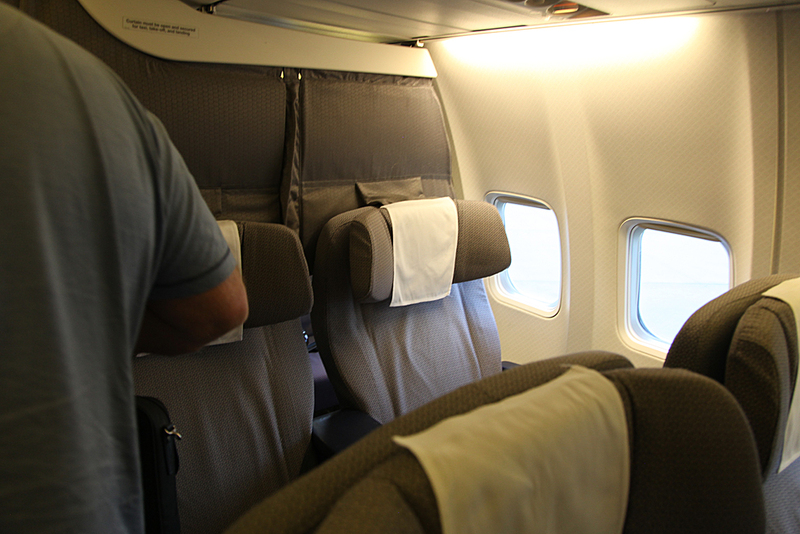 However our seat mate is the wife one of the people dad and I go flying model aircraft once a month, so that isn't a problem sharing the row with. 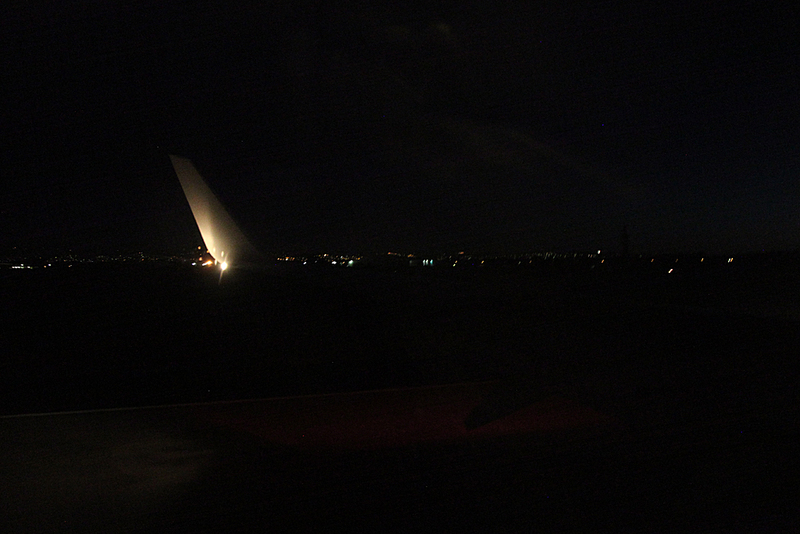 Take off was on runway 01, we did not got right to the end. 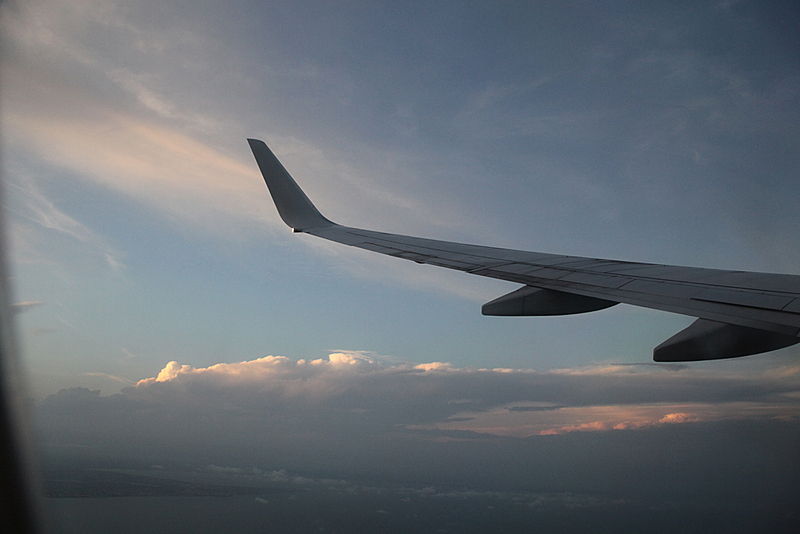 Quite smooth with very little turbulence. 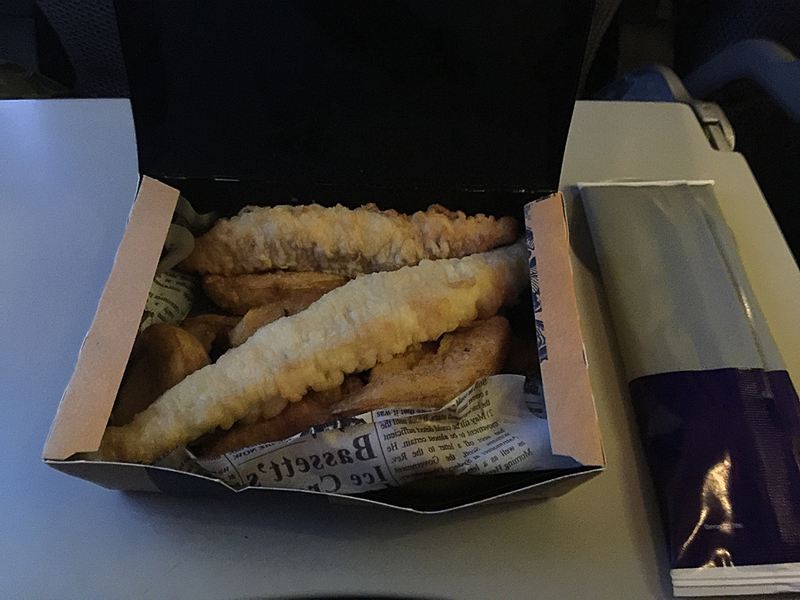 Meal options are a hot option of fish and chips or a cold option of Thai salad. 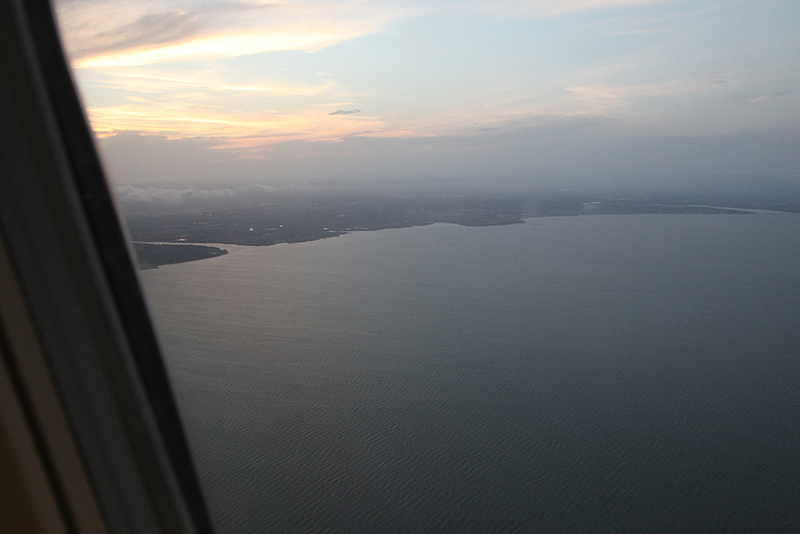 Both dad and I had the fish. 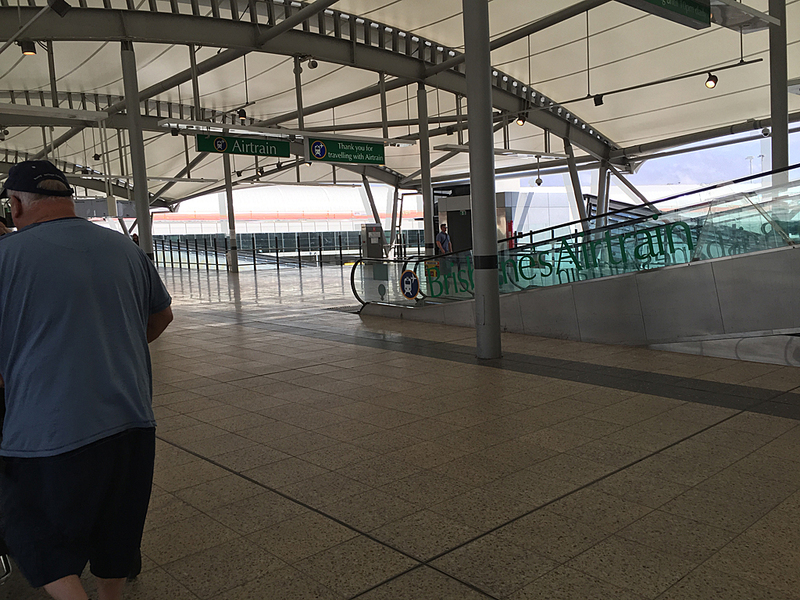 Quite nice and wasn't so hot that I couldn't start eating until the drinks came. 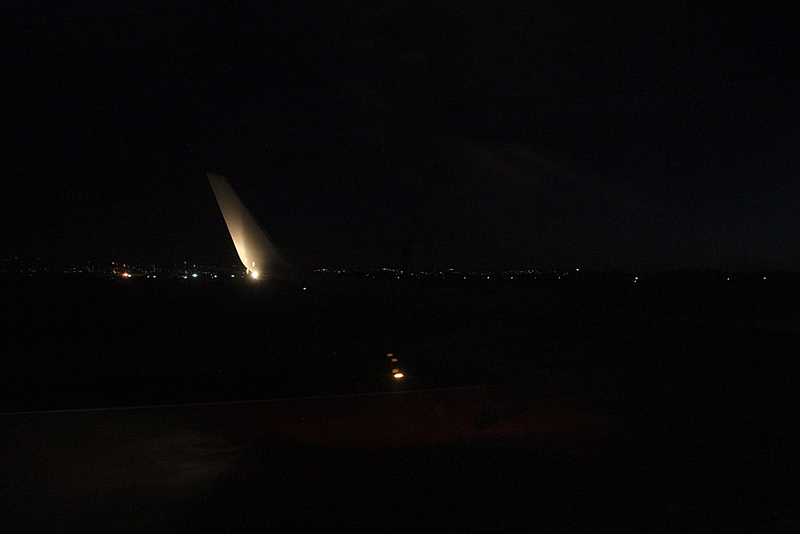 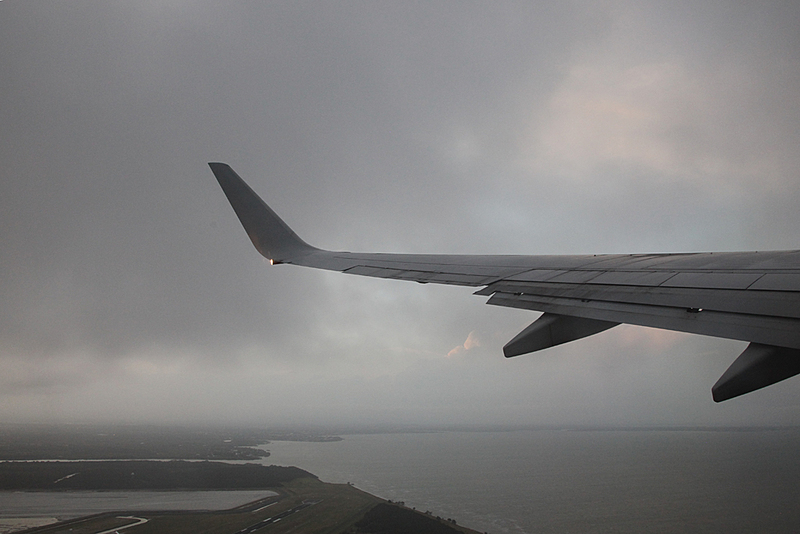 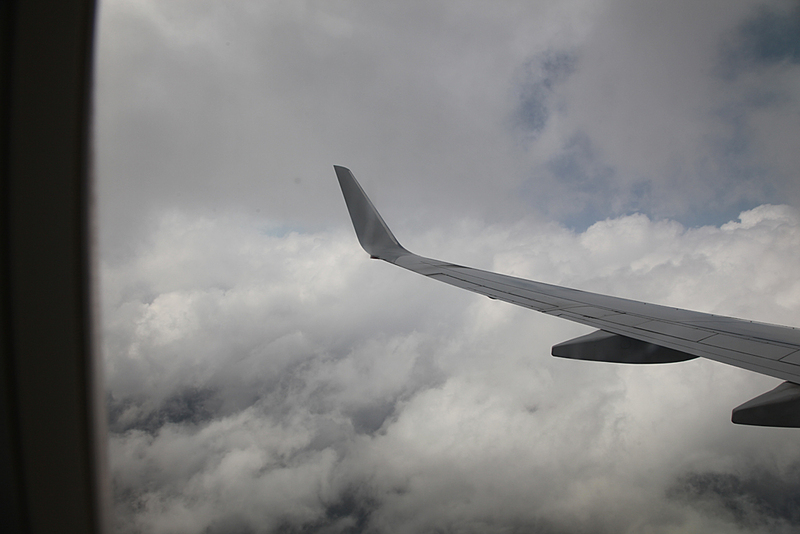 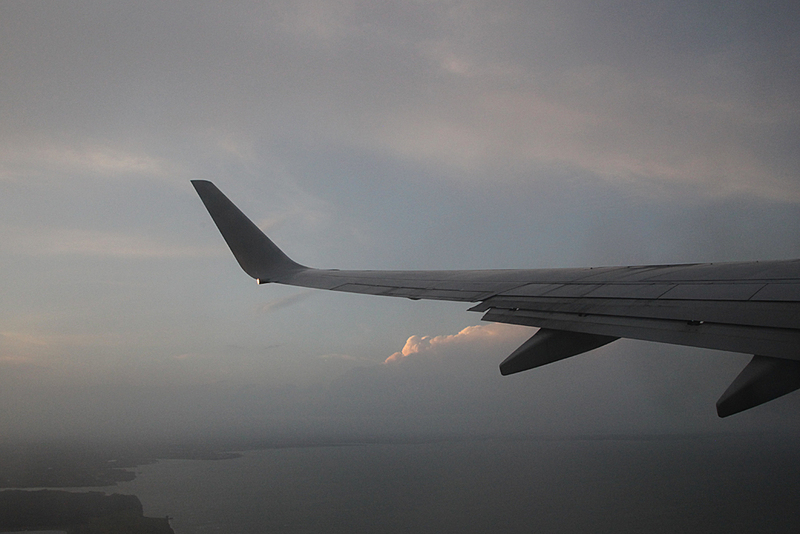 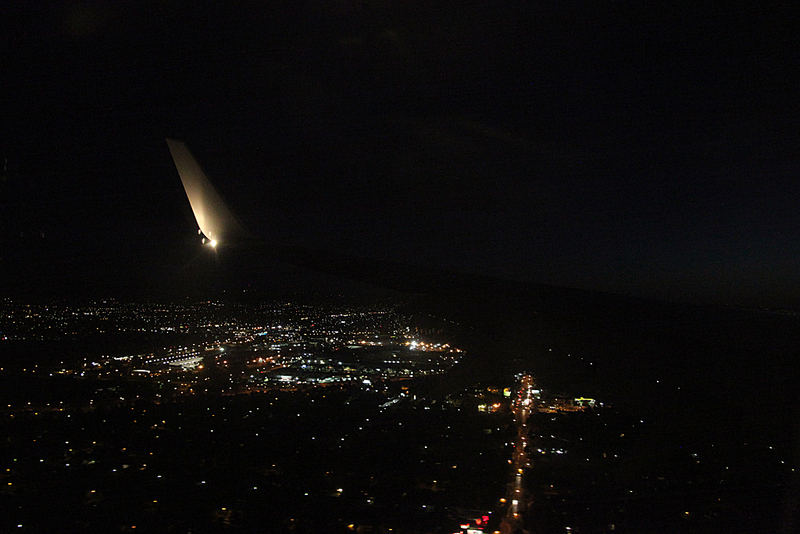 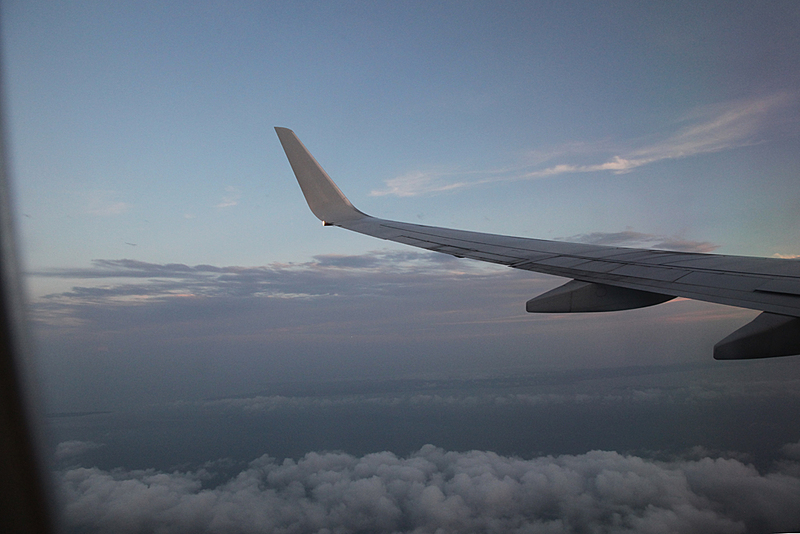 Uneventful flight, very light turbulence here and there. 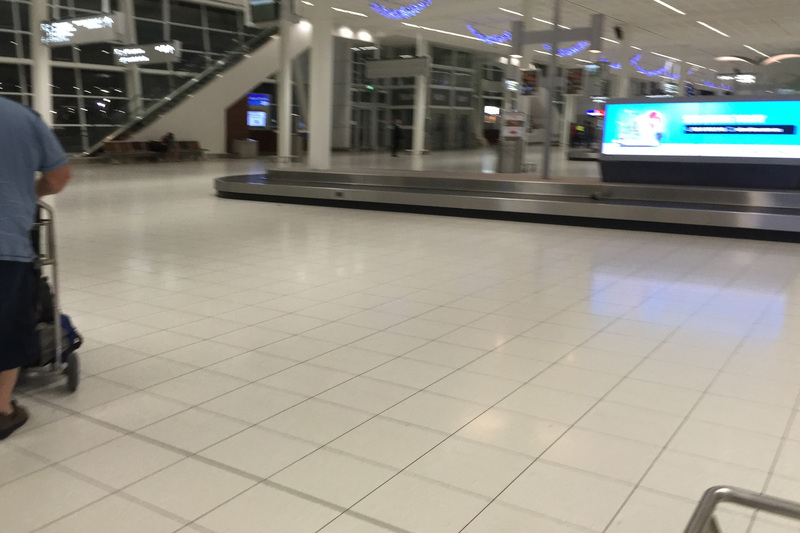 Talking to the person we knew made the time go quickly. 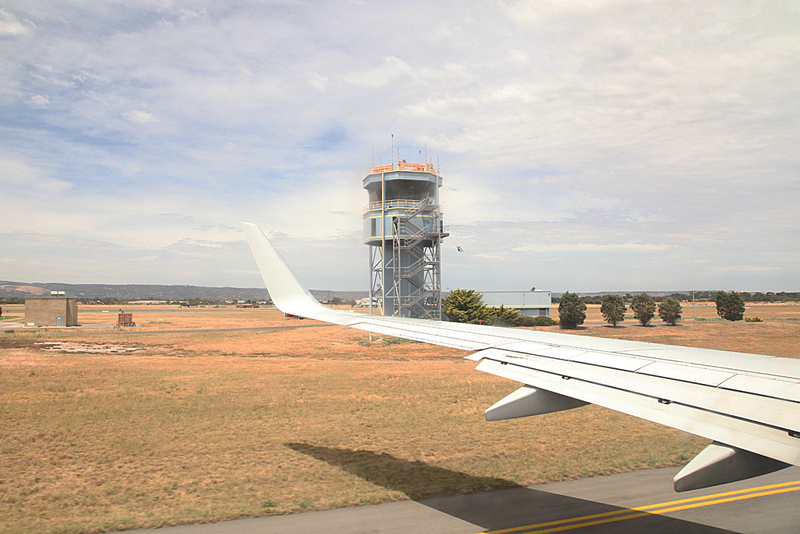 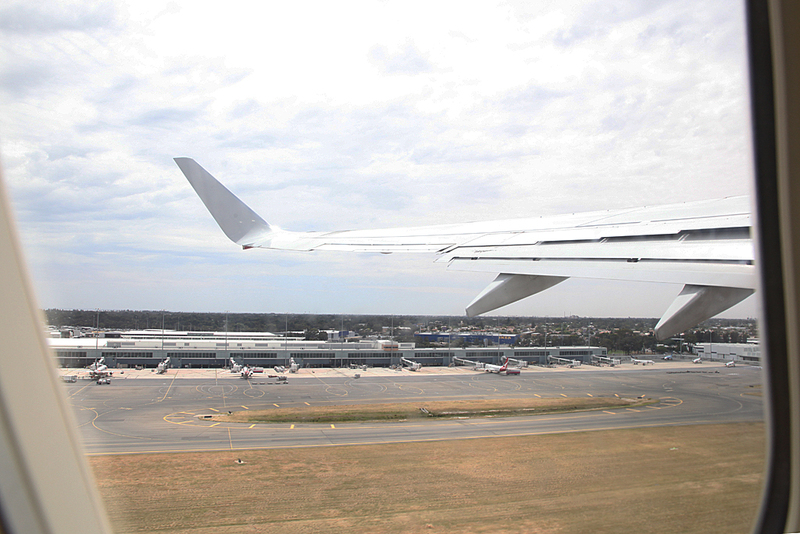 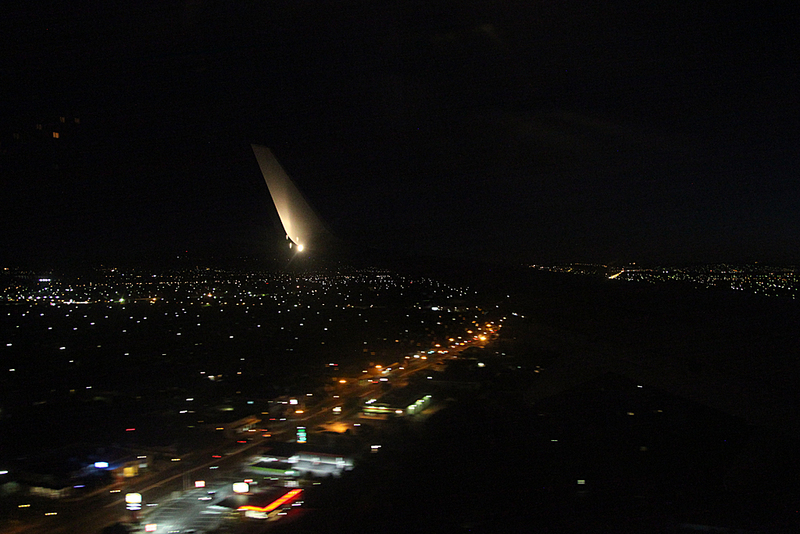 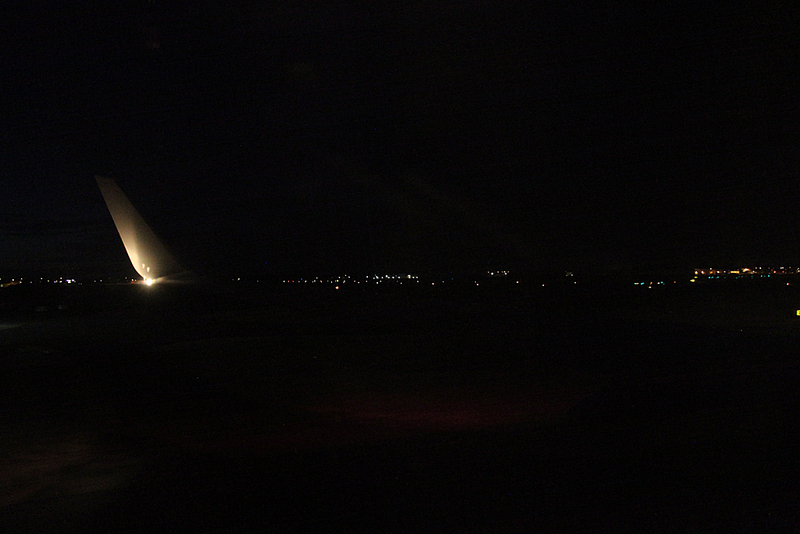 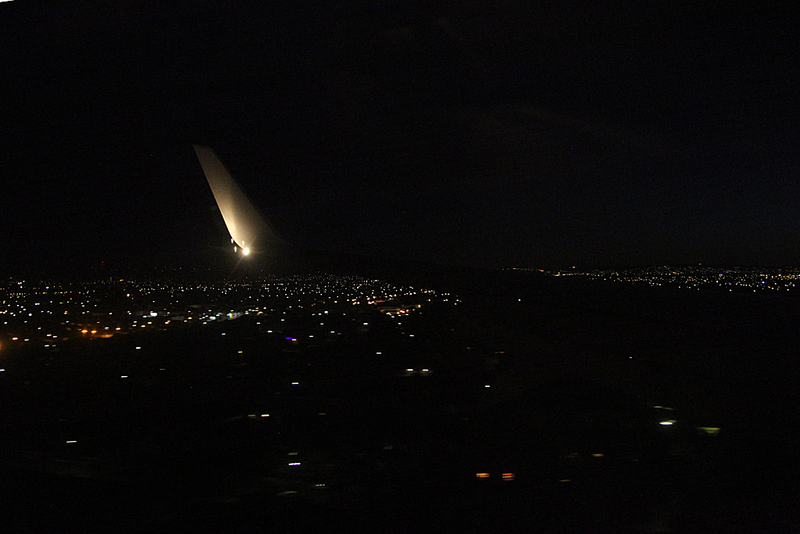 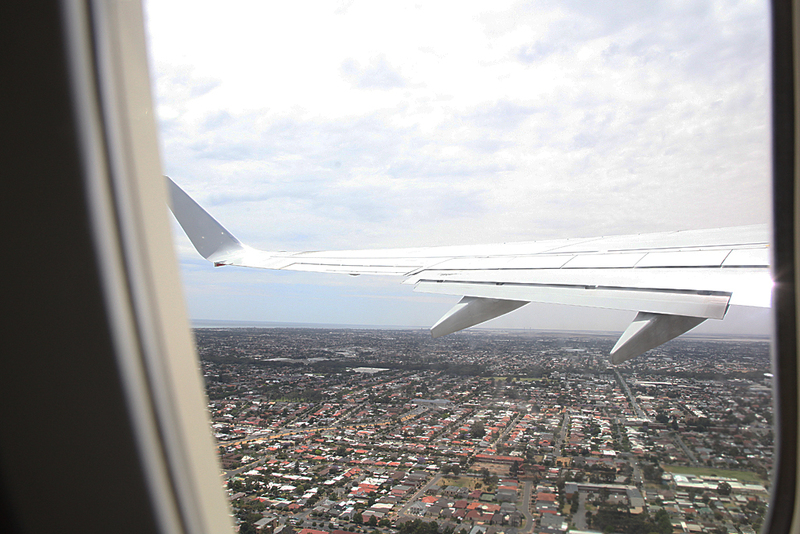 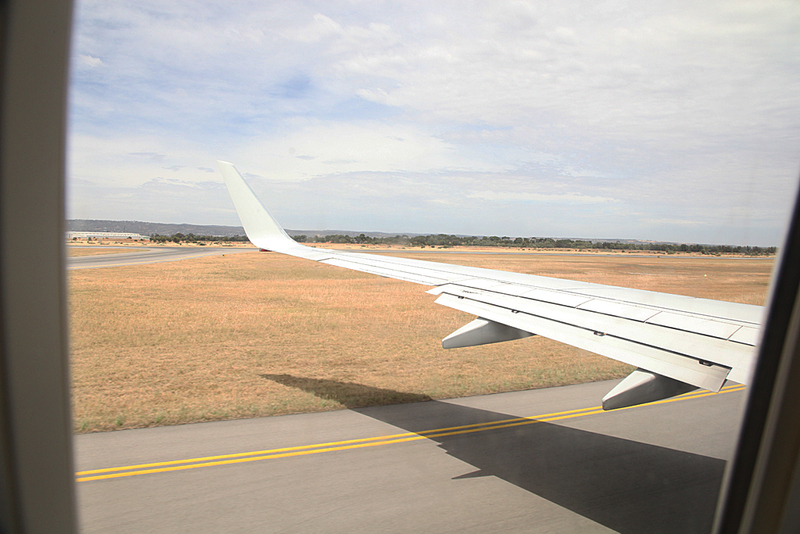 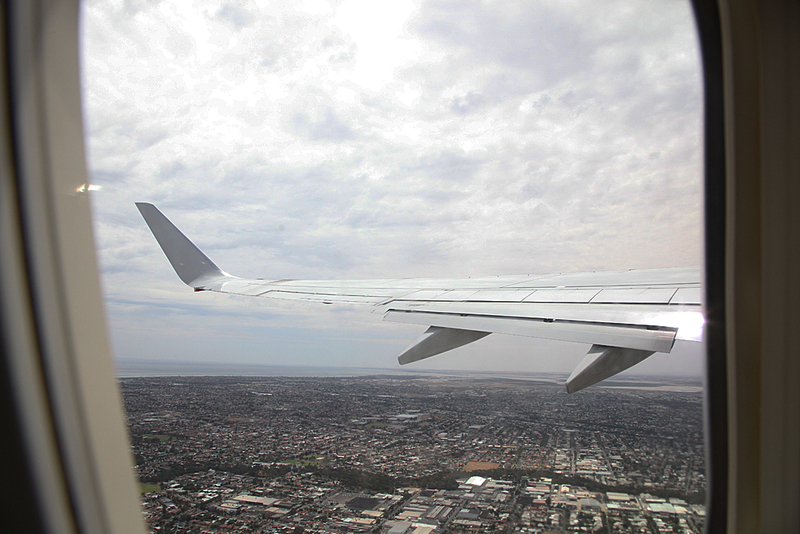 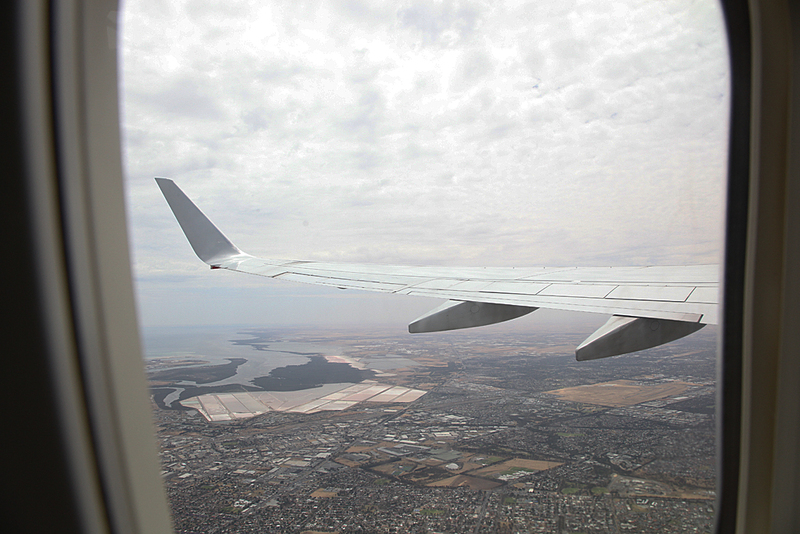 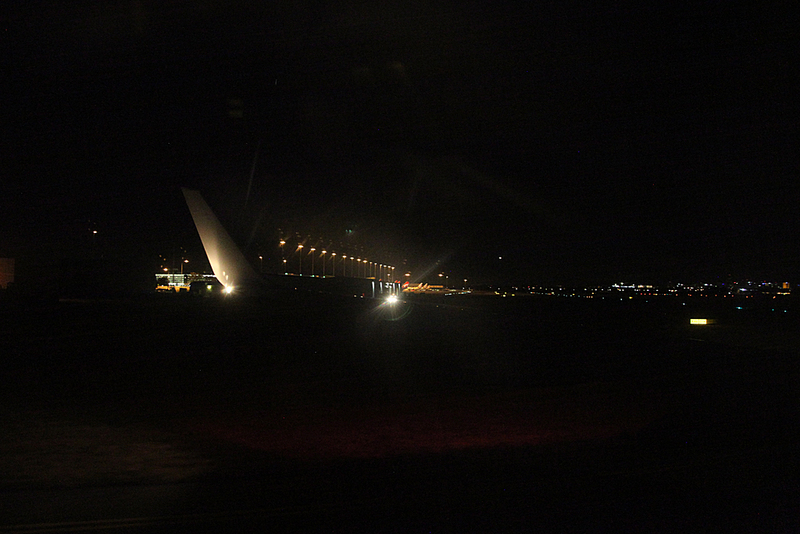 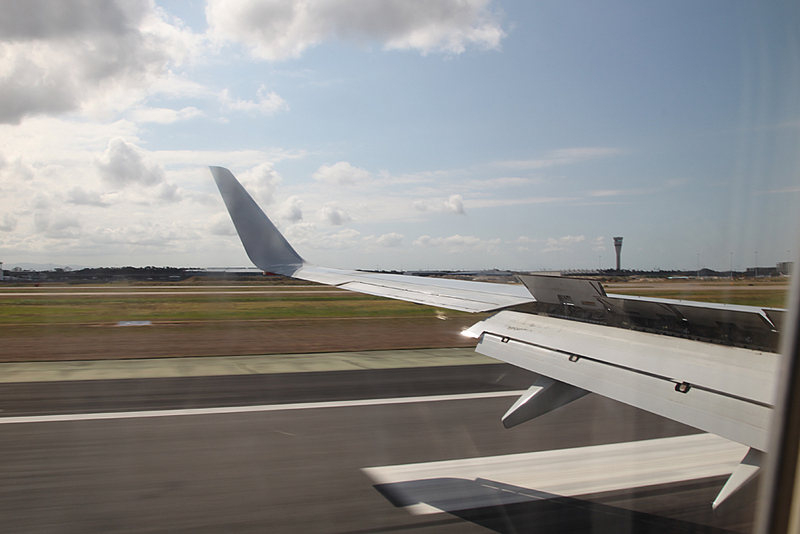 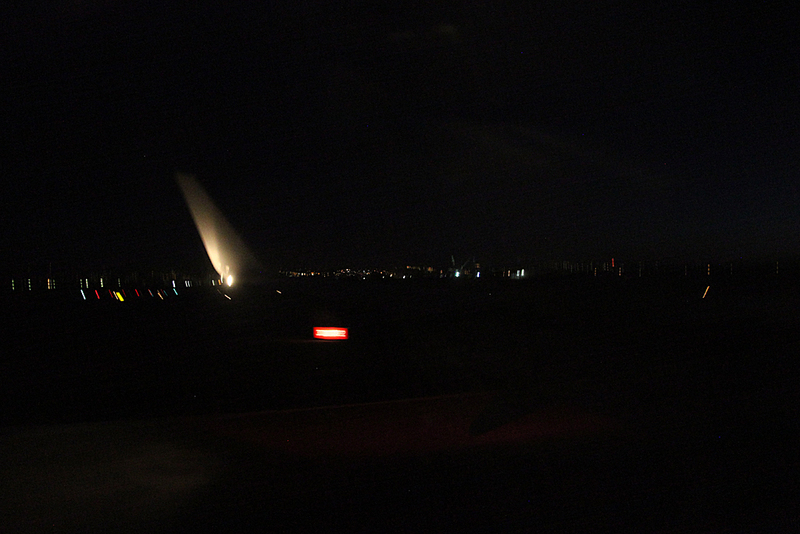 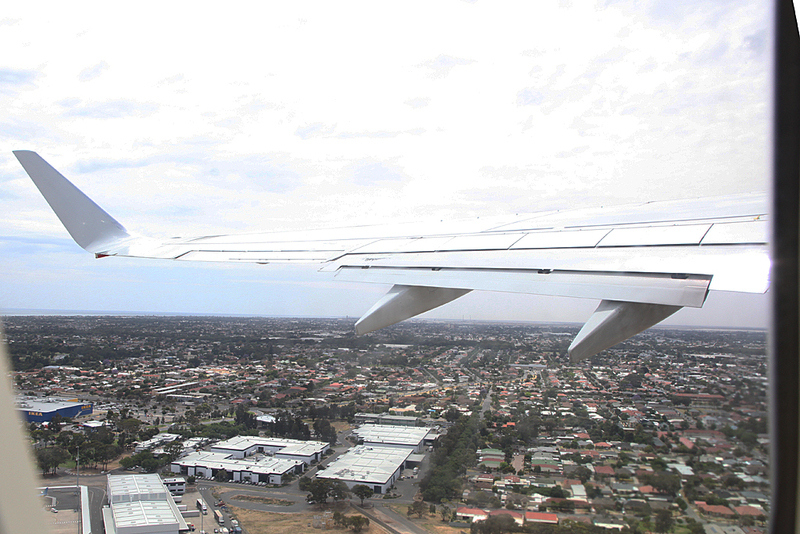 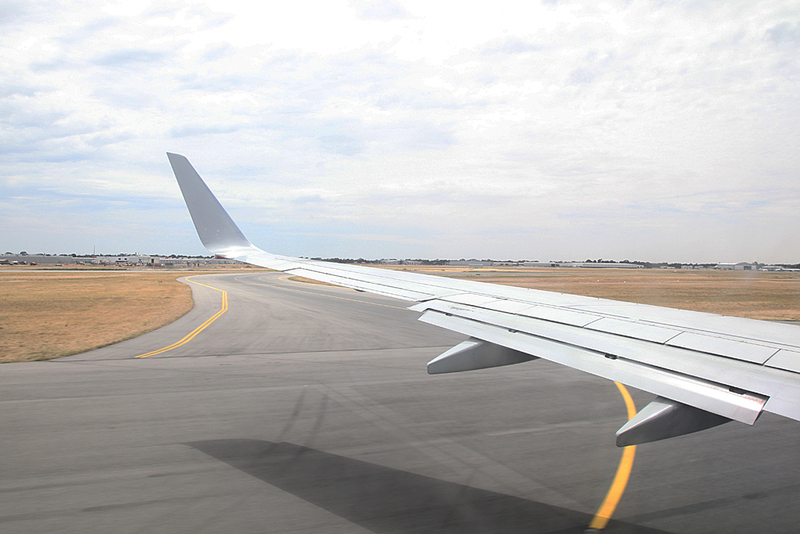 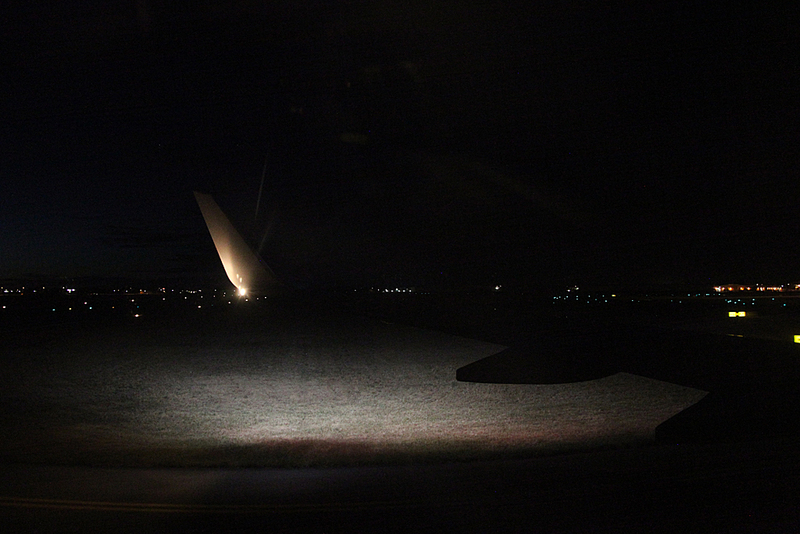 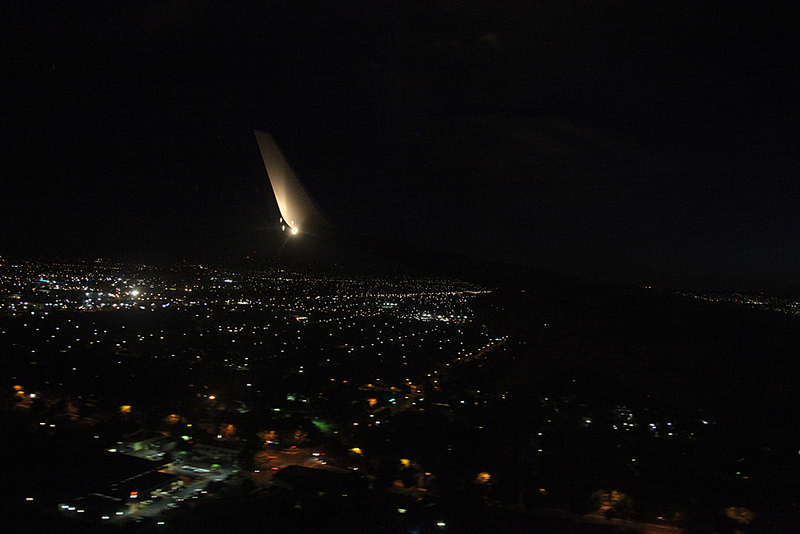 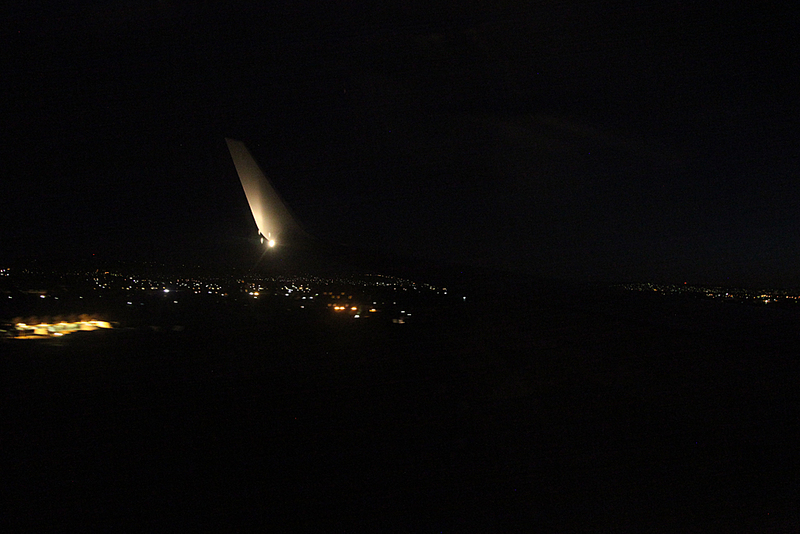 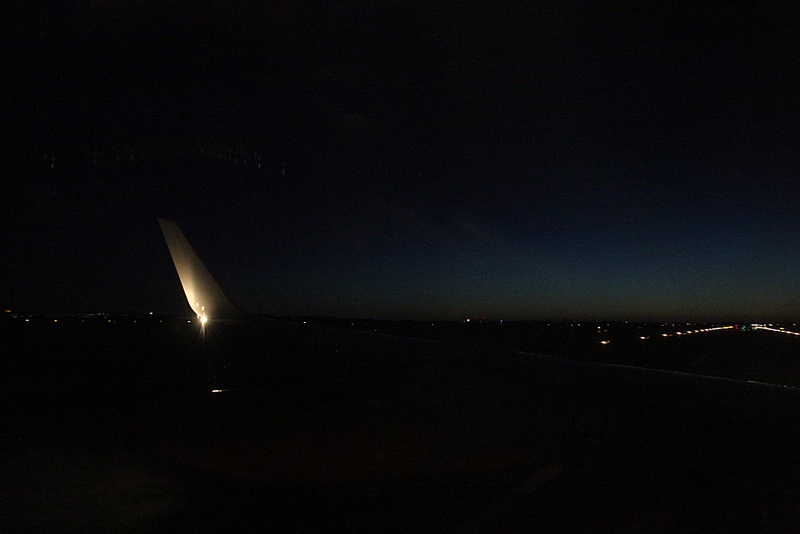 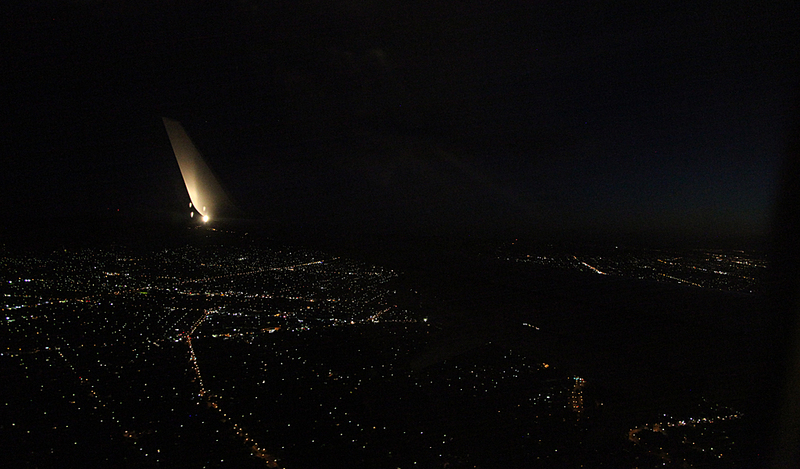 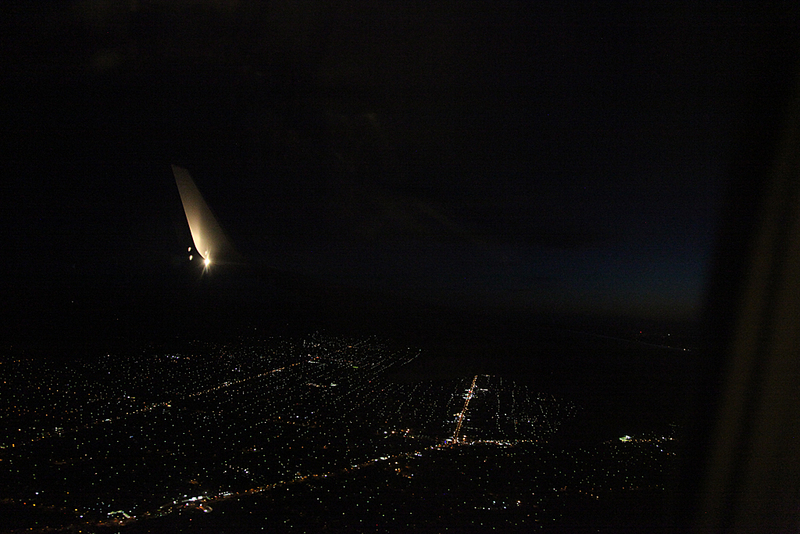 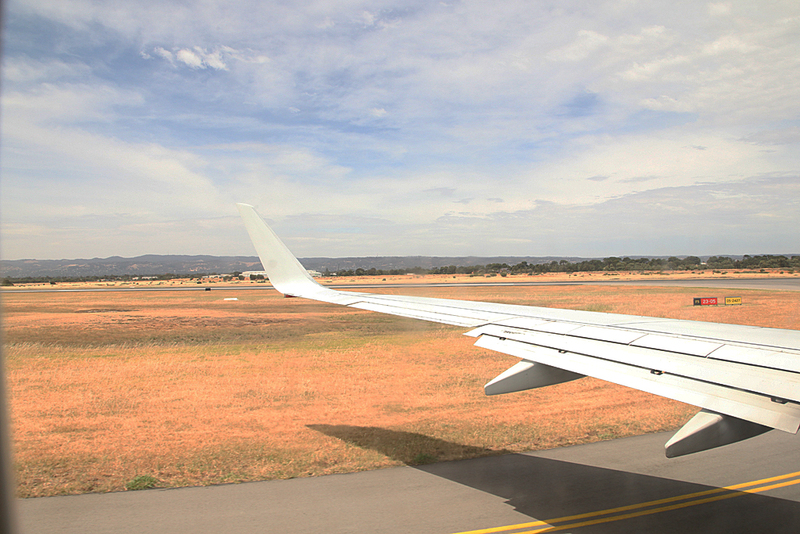 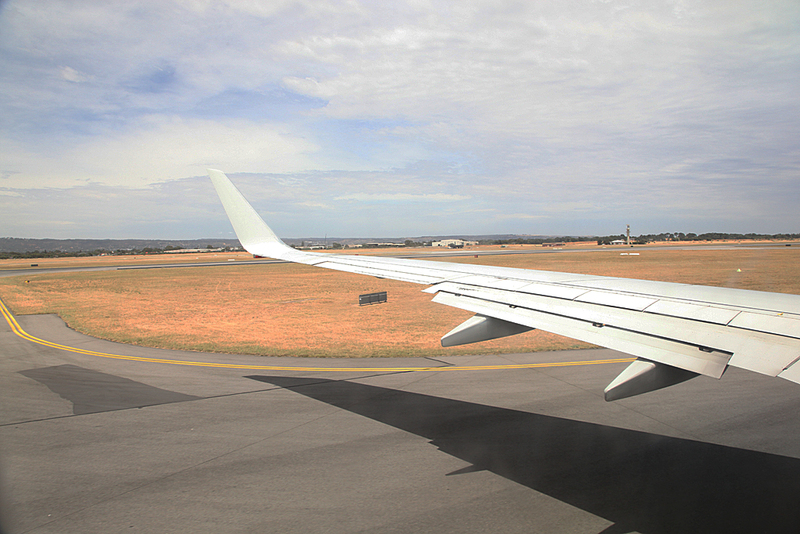 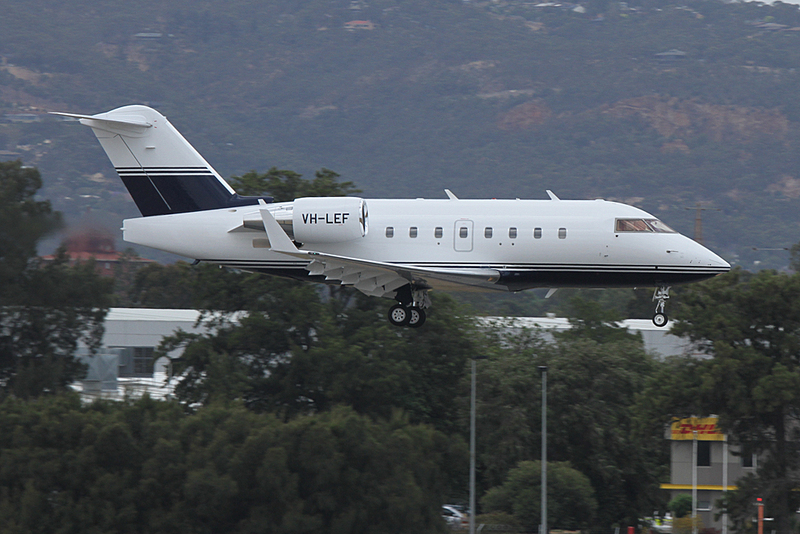 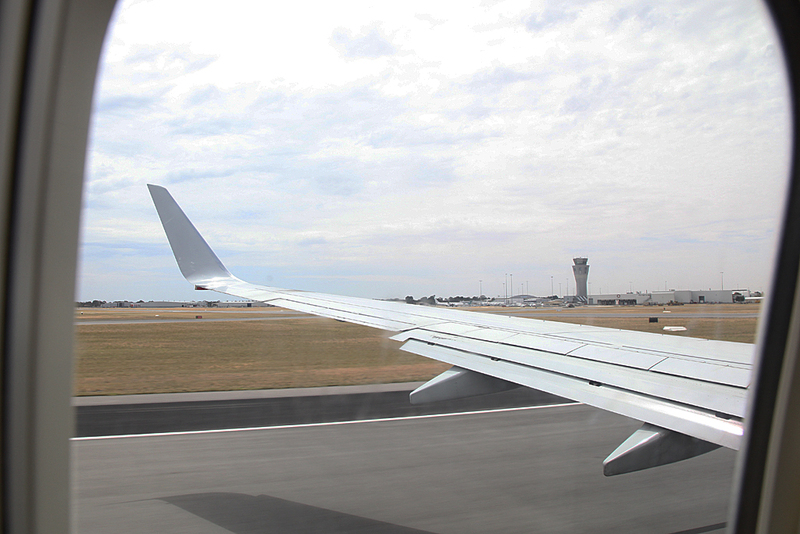 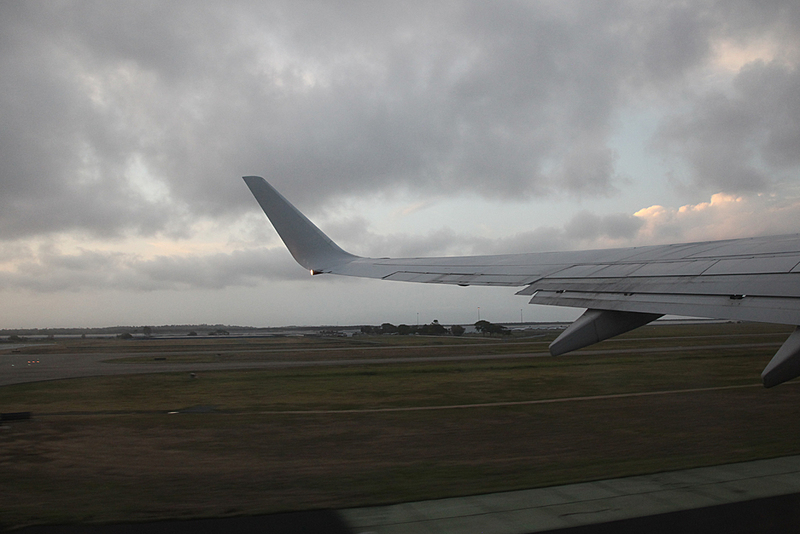 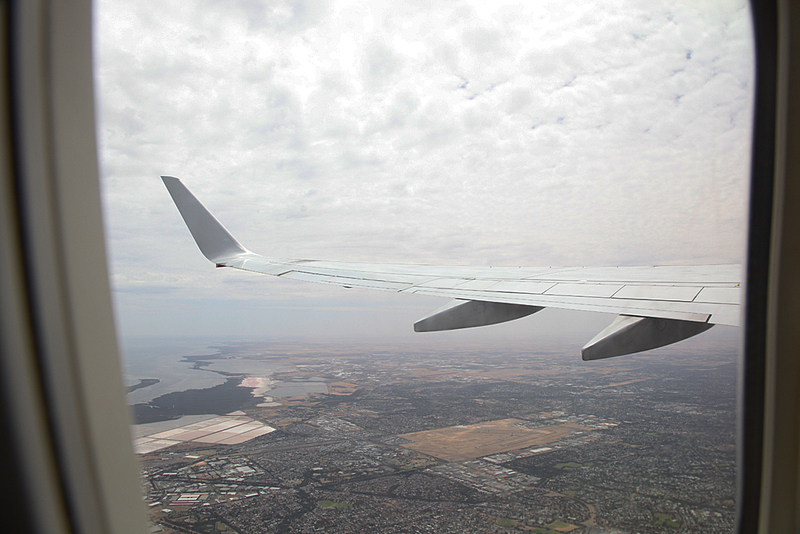 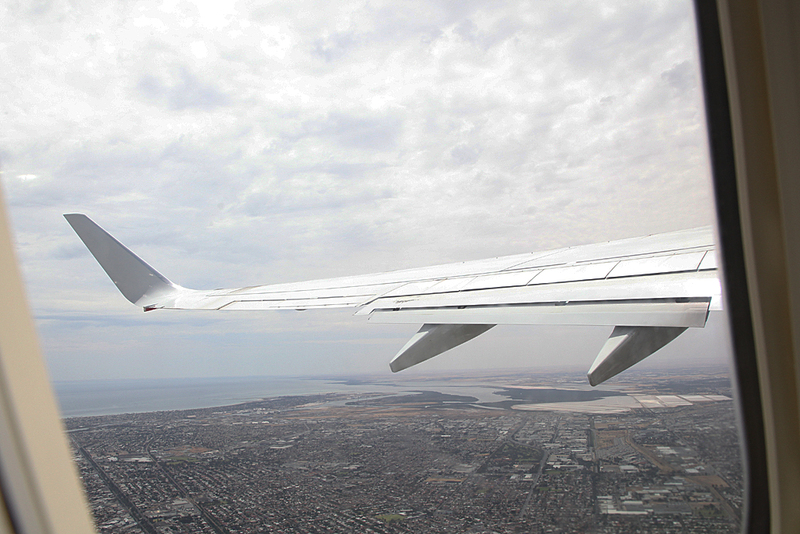 A smooth landing back in Adelaide on runway 23. 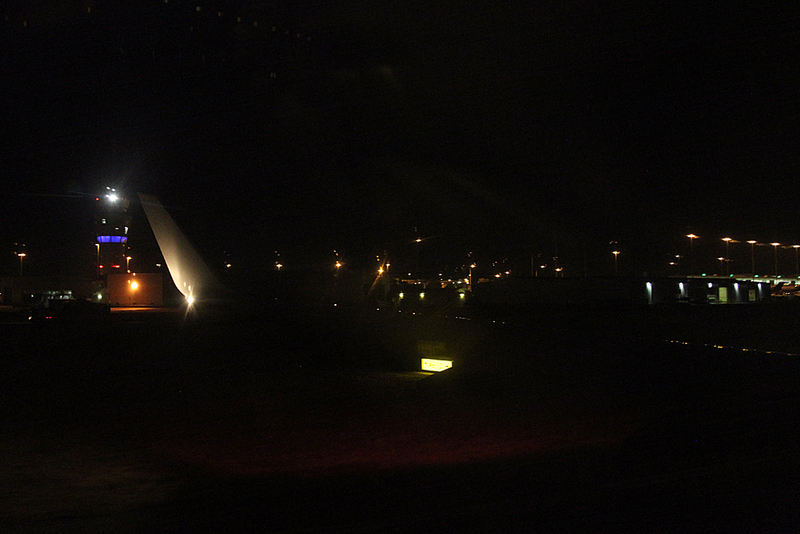 Once the crowd had gone, quick look at the flight deck. 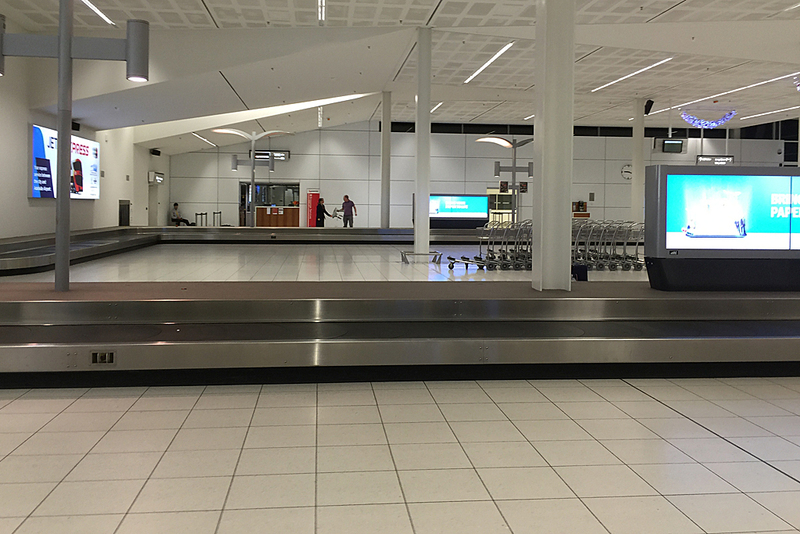 Down to the baggage reclaim to get the bags. 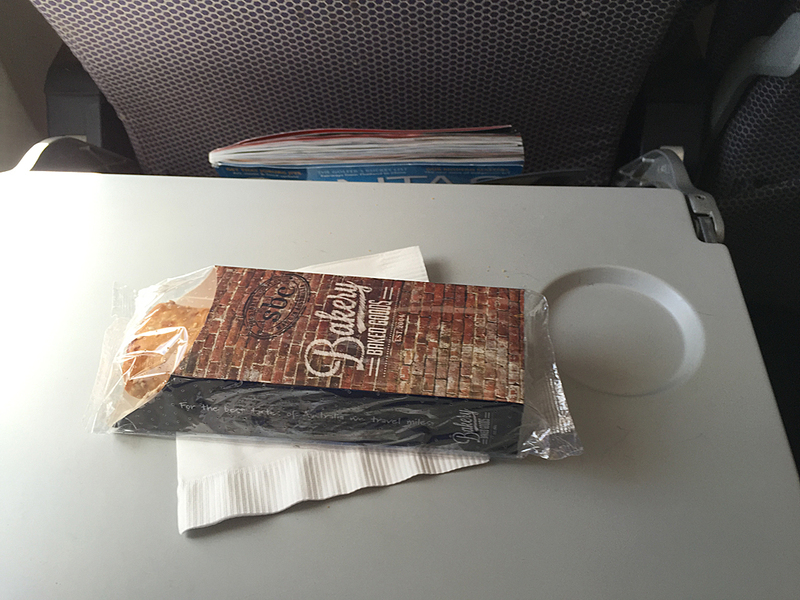 No problems with this flight, meal was good. 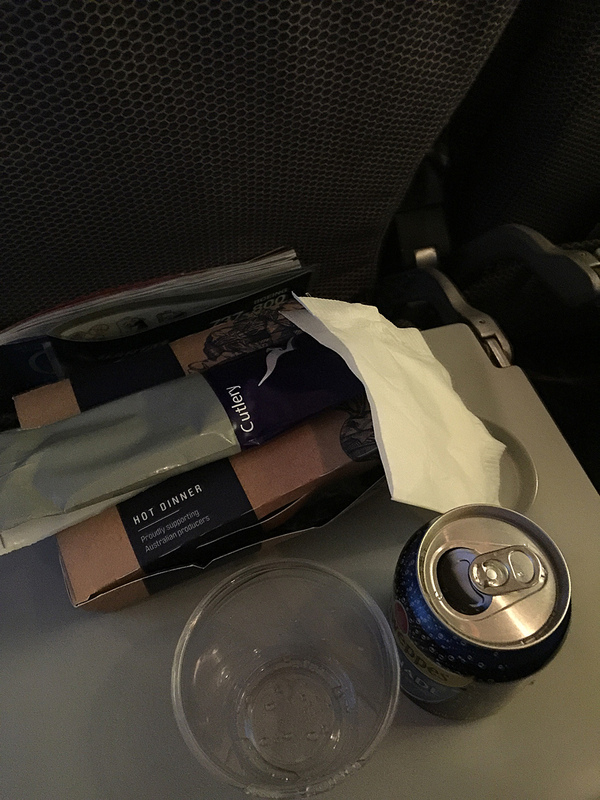 Still can't understand why airline food has earned such a bad reputation.